“Voyage to the interior of the living cities is the second phase of a project that started in 2009, and related to the book ‘Invisible Cities’ by Italo Calvino. 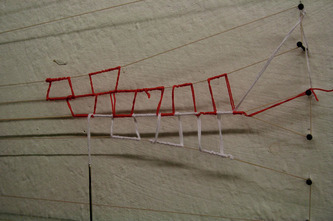 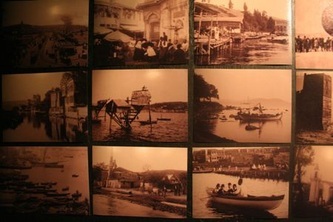 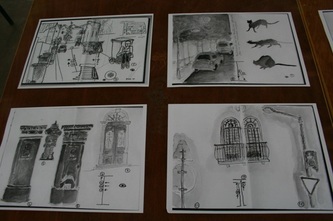 In the sequence of this project I traveled to the city of Istanbul where I stayed for the period of one month. 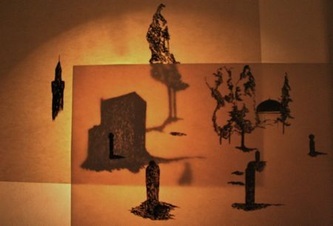 Drawings in shadow appear in the sequence of this experience. 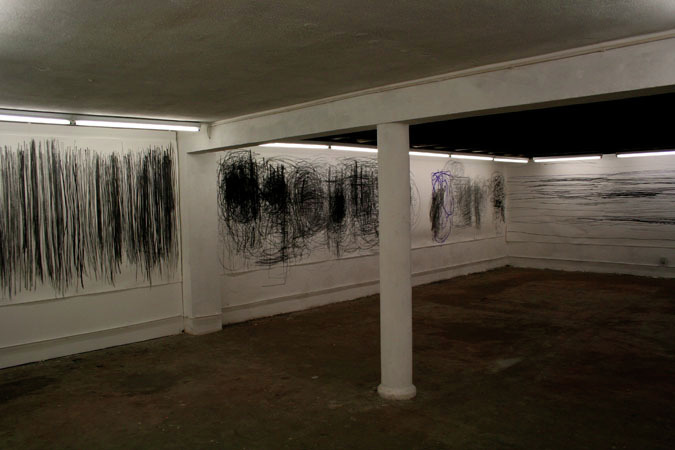 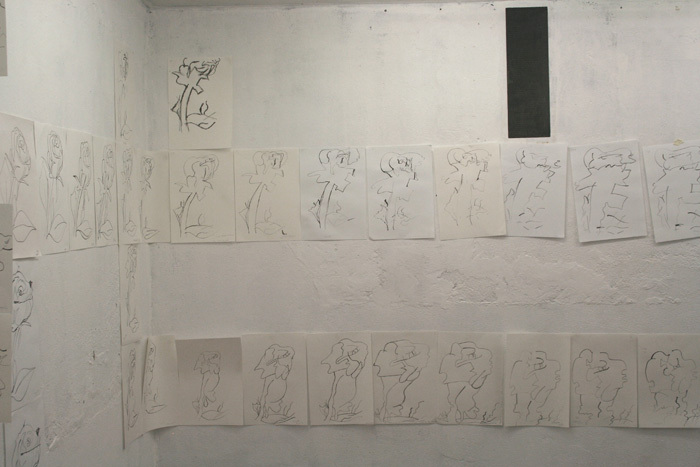 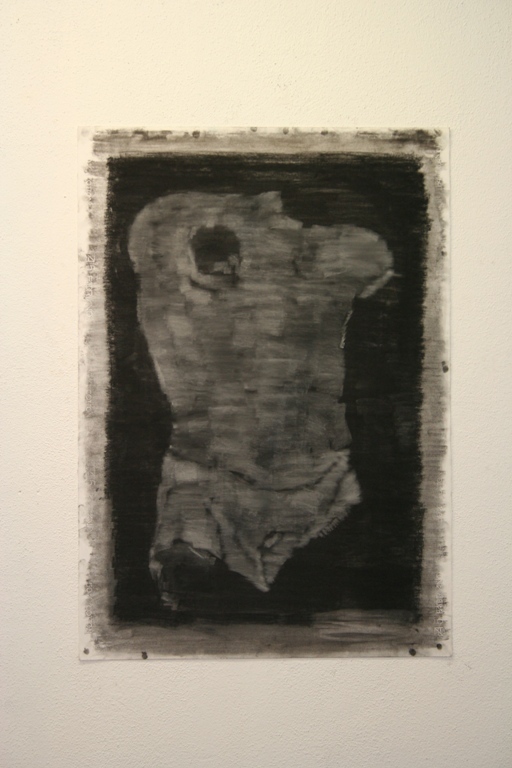 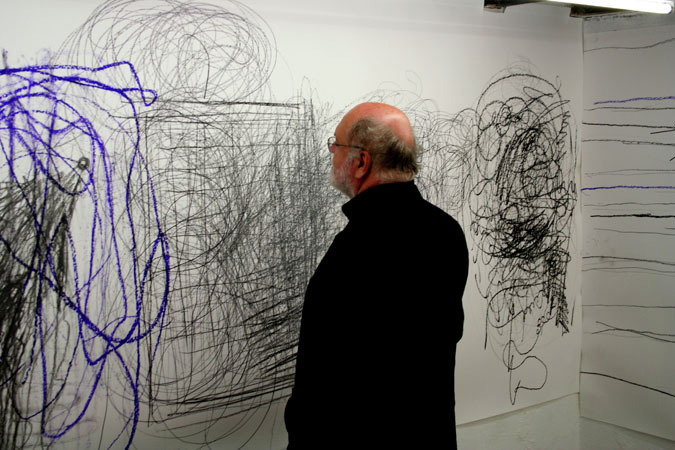 During the residency at drawing spaces my aim was to attempt to give some body and structure to works relating to the ‘mental drawing’ that was created and imprinted in my memory during the period spent in this city. 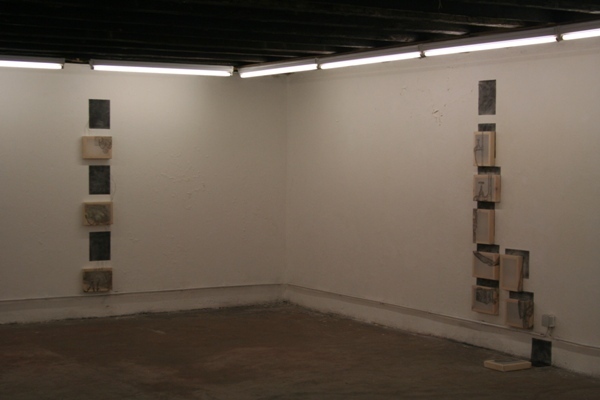 Departing from different registers collected on site, such as photographs, maps, sound or video images, I created a group of works that reflect upon this relationship between this ‘memory’ or ‘mental drawing’ that was established during my experience with the city. During this project, more than being worried about a formal or conceptual practice of drawing I wanted to primarily address its narrative nature and fictional will. 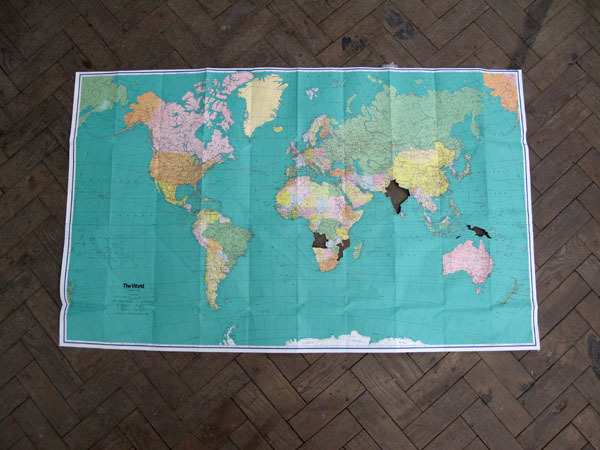 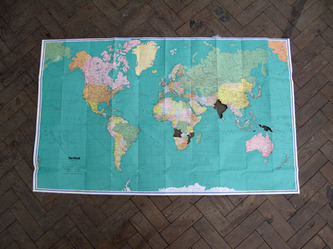 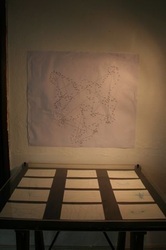 Thematically, it was developed over a mapping of utopian ideas. 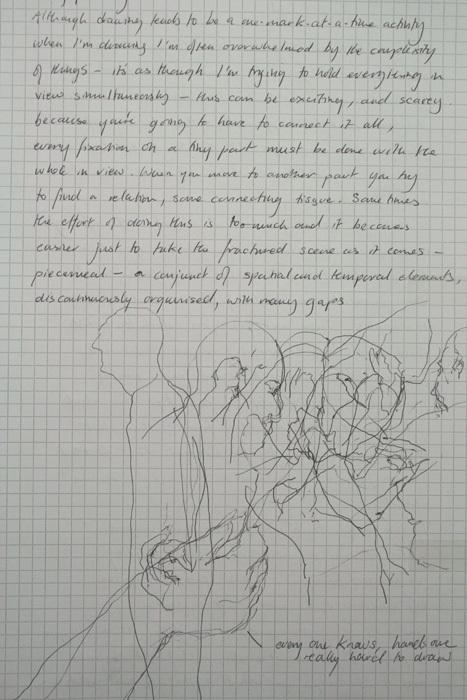 I started from this premise and inspired by a palimpsest method I created an analogy between a process for creating new utopias, with a drawing method by accumulation, overlapping and changing information. 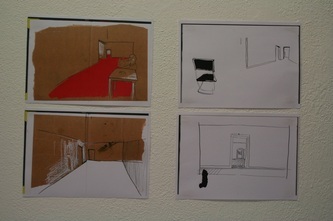 In Stage 2 of the residence I took in to consideration the formal and narrative nature of these drawings and proceeded to the construction of various devices inspired by the genesis of Film and Animation, in particular: the Diorama, the Panorama, the Prascinoscópio the Fenacistoscópio, the Zoetrope, etc. 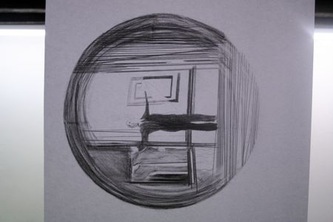 I intended to make drawings move through their interaction with such mechanisms that derive from the Proto-Cinema, questioning the initial quote of Norman McLaren. 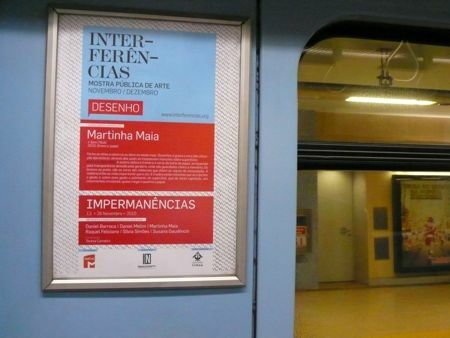 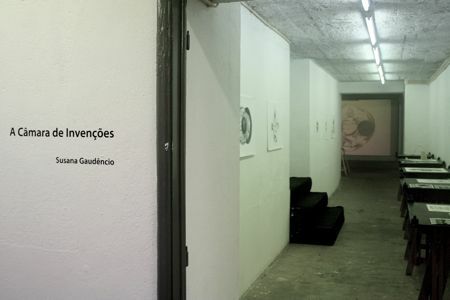 IMPERMANENCES was a project in partnership with FESTIVAL INTERFERÊNCIAS that took place in two distinct times and spaces: an artistic residency/exhibtion, open to the public, taking place at Drawing Spaces (Fábrica Braço de Prata), between November 3 and 20, from Wednesday to Sunday, from 7pm to 11 pm, with an opening presentation on November 13 at 9.30pm; and a drawing exhibition in 6 carriages of the Lisbon Metro which was transformed into galleries displaying 6 individual exhibitions, between November 13 and 26, during the Metro’s normal operating hours. 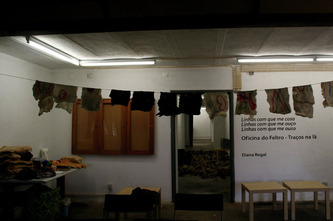 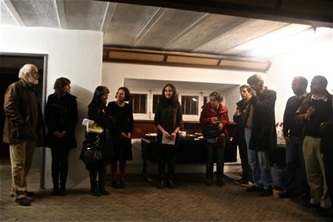 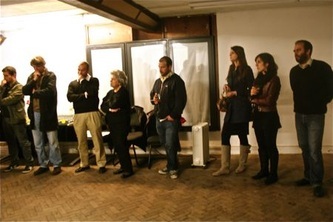 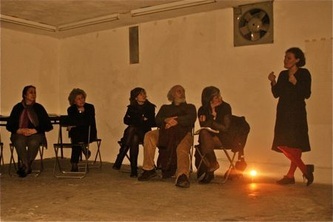 The participating artists are: Daniel Barroca, Daniel Melim, Martinha Maia, Raquel Feliciano, Sílvia Simões and Susana Gaudêncio. 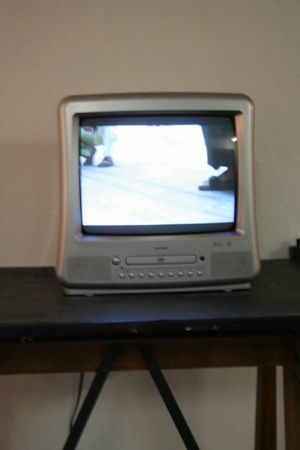 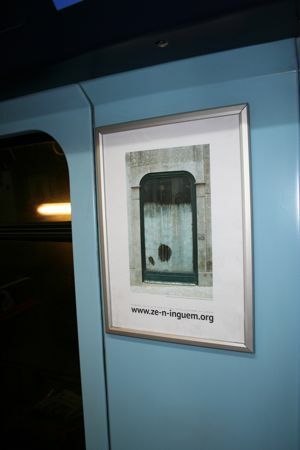 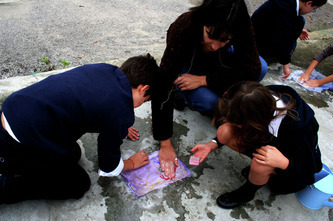 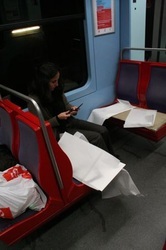 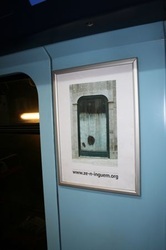 Starting in November, the city of Lisbon received the first edition of INTERFERÊNCIAS – Mostra Pública de Arte (INTERFERENCES – Public Display of Art), an intromission in the daily lives of the population, aimed to bring contemporary art to the greater public, through the appropriation of public spaces / “non-places” and means of mass communication. Therefore, the event was generalist, free and massive. 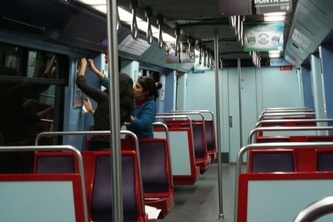 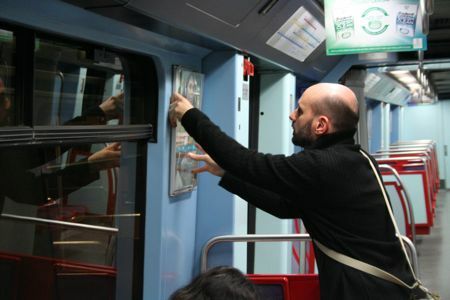 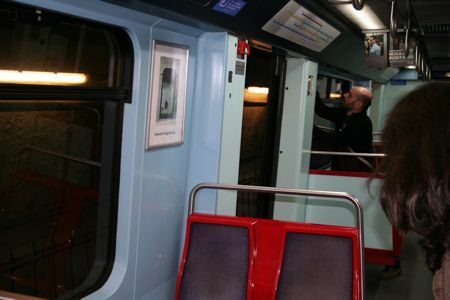 The initiative involved public transports and Metro stations, mupis and outdoors. The second edition will engage shopping malls, parking areas and newspaper pages. "... 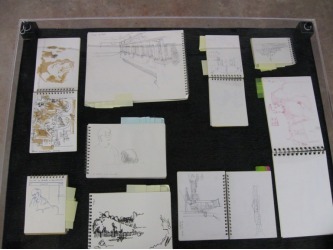 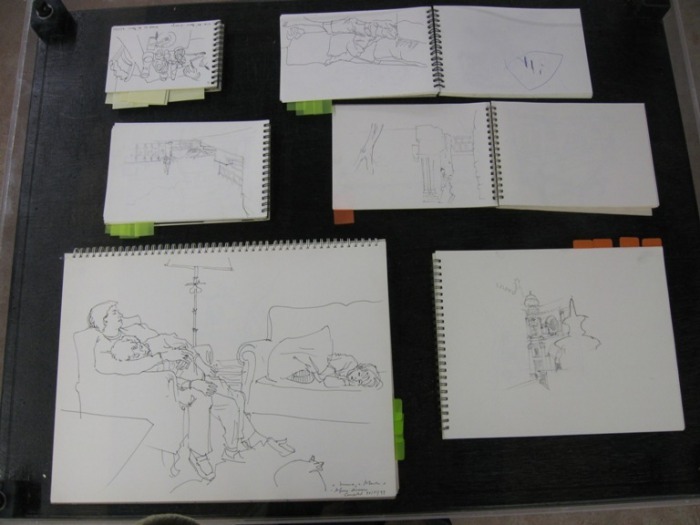 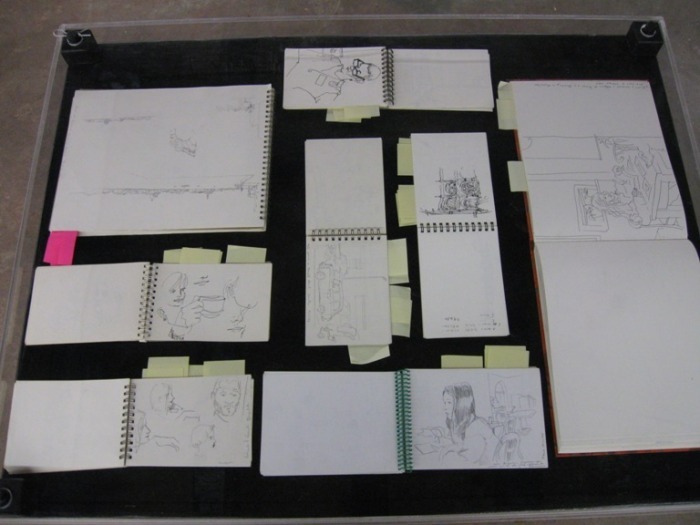 THE DRAWING GOT LEGS AND RAN DOWN THE GROCERY STORE STREET..."
This project was part of a research on the materiality of drawing, into how to give evidence in drawing of a sense of touch, and making it more tangible while creating new readings upon reality. 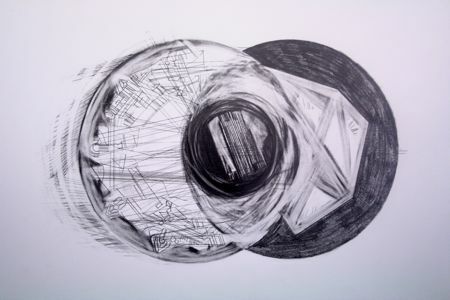 More roughly, it aimed to explore and develop human characteristics, both physical and psychological, within the drawing, so that drawing could integrate our reality with a kind of form and personality of its own. 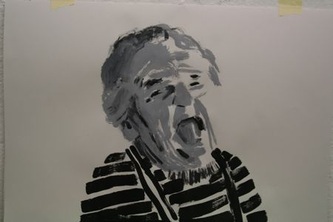 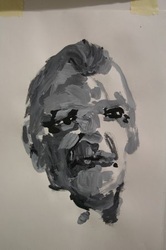 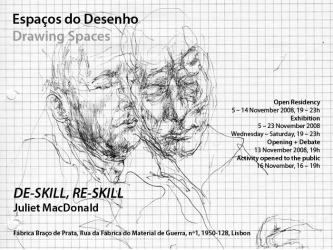 There was an informal casting - 'Casting to explore someone's potential to become a good drawing' - with some of the residents from Mansão de Santa Maria de Marvila (homecare for elder people, neighbors of Drawing Spaces). 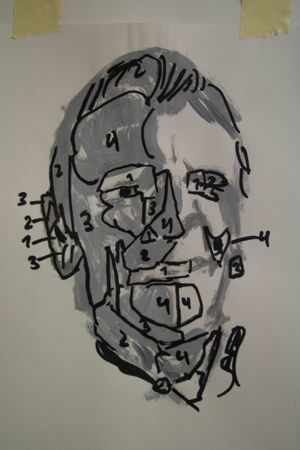 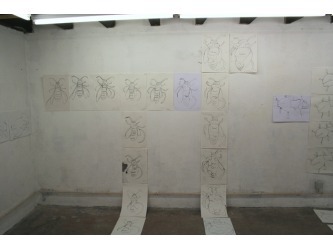 A couple of 'actors' participated in the development of a number of independent drawing languages resulting from the interactions with each of them. 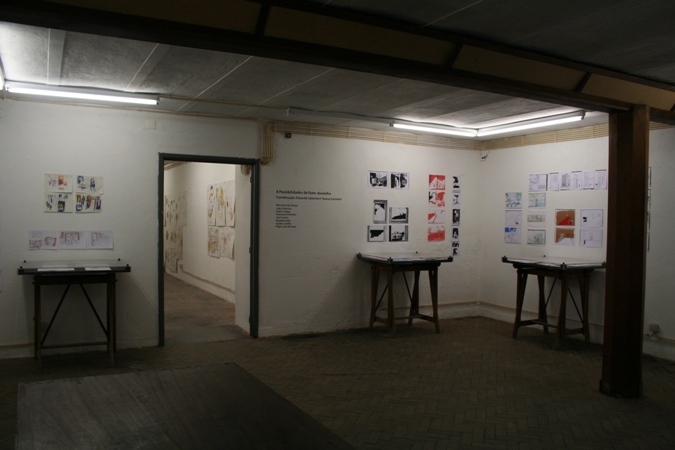 All these proposals developed between the space of residency at Drawing Spaces, Fabrica do Braço de Prata, and various spaces at the Mansão de Santa Maria de Marvila, including interiors, exteriors and surrounding areas. 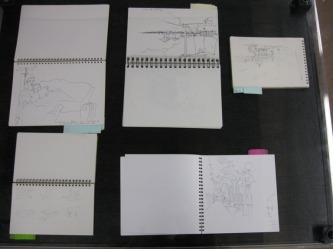 The drawings were defined here by the strategic approach to the ideas and interactions and this took many shapes and become materialized through different materials. 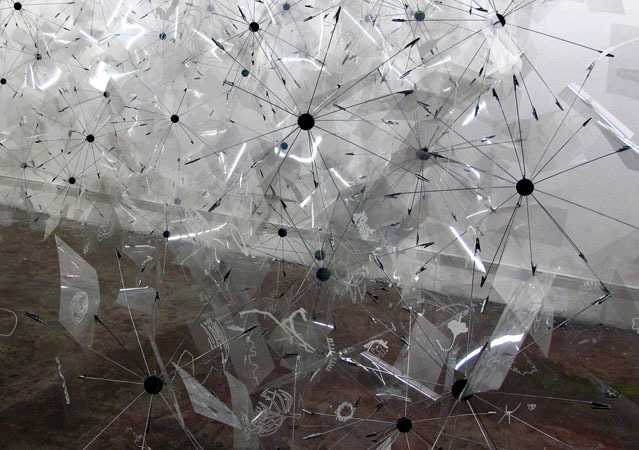 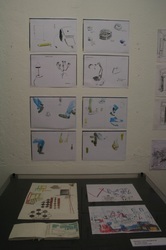 These proposals did integrate drawing, photography, sculpture, installation, video and performance. 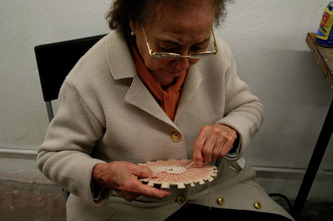 Developed in collaboration with Mansão de Santa Maria de Marvila, Fundação D. Pedro IV. 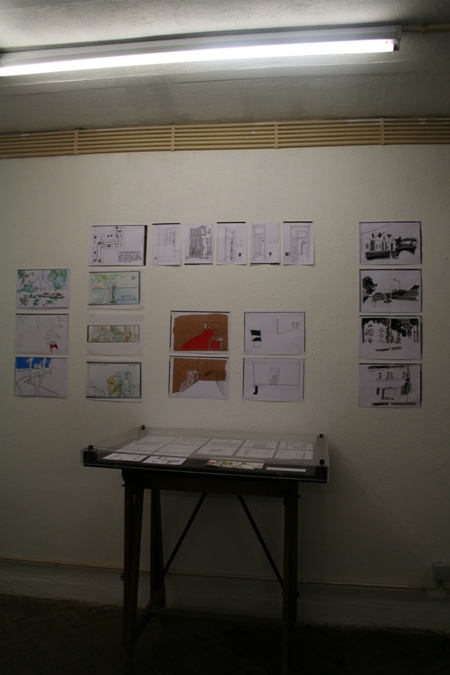 8 Possibilities of making drawing was a project which aimed to respond to the dynamics of Drawing Spaces by presenting a series of public workshops coordinated by a variety of experts in the field of drawing. 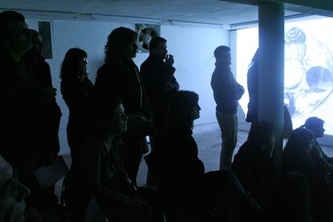 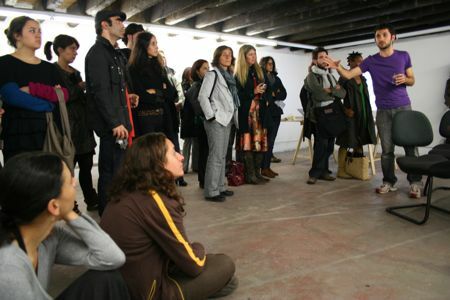 These workshops took place over a period of 2 weeks, during opening hours – from Wednesday to Saturday, from 19h to 23h – following the ‘open residency’ model. 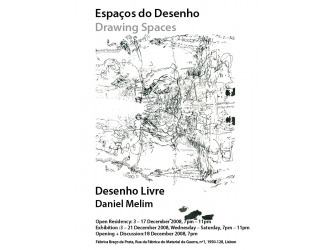 This gave the public the opportunity to daily visit and accompany the development of these experimental sessions around drawing. 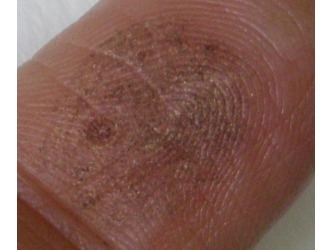 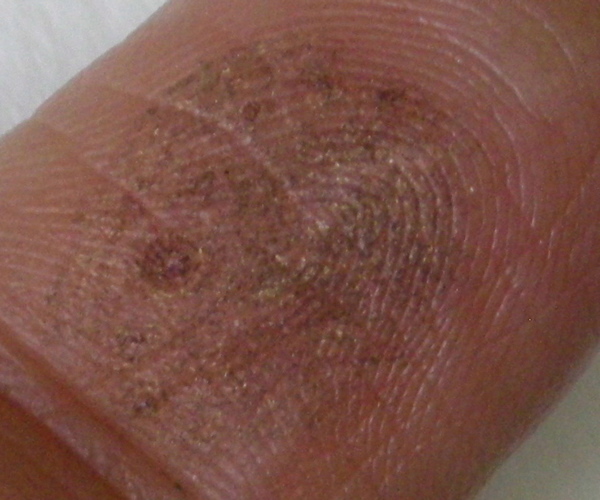 In construction techniques, after pinning the extremities of a thread with nails and covering the thread with a blue pigment, the line is BEATEN. 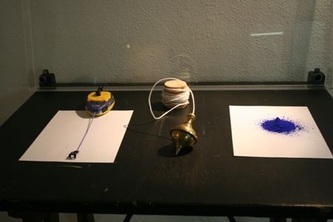 It is in this act of BEATING (the) LINE where the momentum of drawing can be found: at the transfer from thread to line, from matter to mark, both blue. 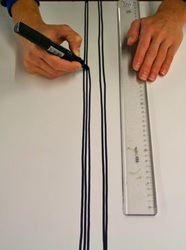 The line is ‘beaten’ horizontally and then elevated vertically. A line-up system is then set up guiding the elements which will constitute this work through a specific use and combination of straight lines. 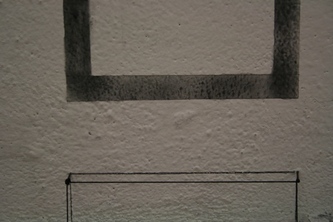 If on bi-dimensional drawing the use of line might risk the ‘fixation’ of forms, here line is used as an element that configures real space, making it sensible. 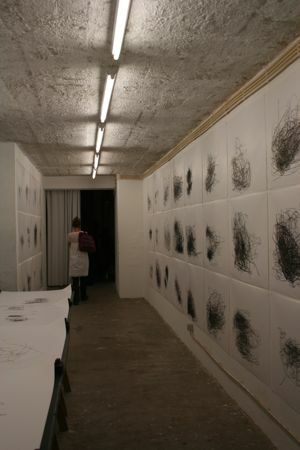 And in this case, by using the physicality of line as a kind of body, this also confers a certain kind of physicality to space which poses the supporting/tension points, the mesh, volumes and dynamics created by the line, in an immediate relation with the architectonic structures of the space to which it adheres. 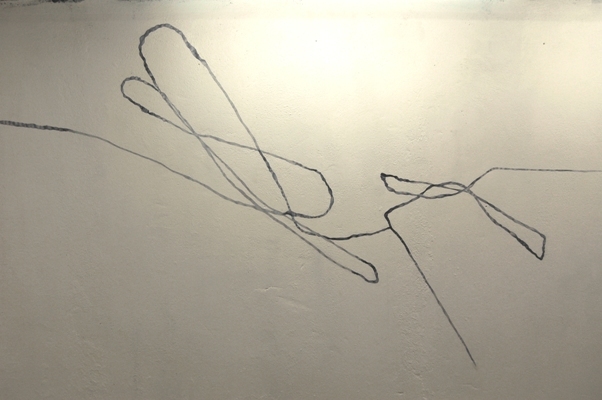 From the operator of lines to the visitor of the space, the physicality of different bodies and its movement in space will then become the sensible element sustaining this work. 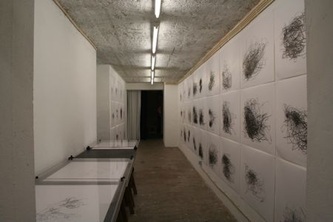 From the various construction line-ups to the structural tissue and its movements, drawing might in this sense reside on the manifestation or elaboration of a speculative idea, familiar to drawing, articulated to a series of actions, familiar to specialized procedures to those who operate it. 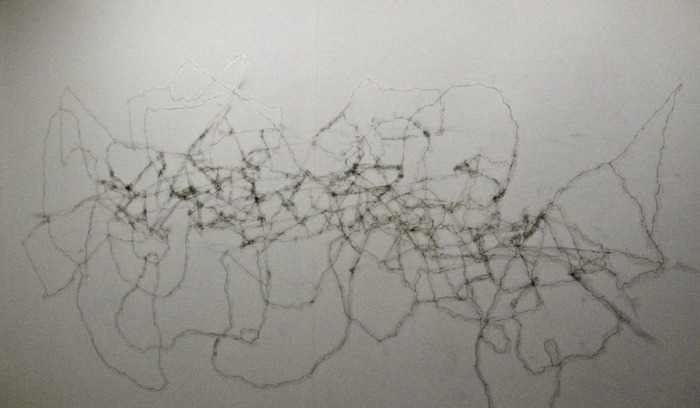 Transfer methods were used to place a drawn line on a wall or floor, and lines were arranged to configure a particular spatiality made evident through a particular materiality. 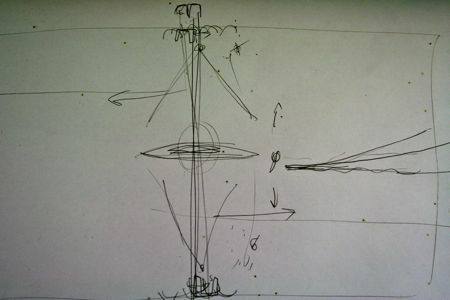 This sequence of operations constituted the «plastic object». 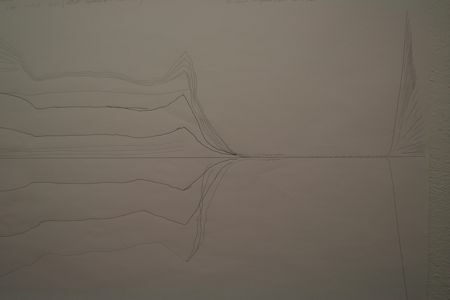 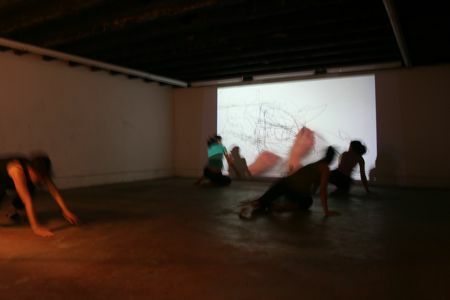 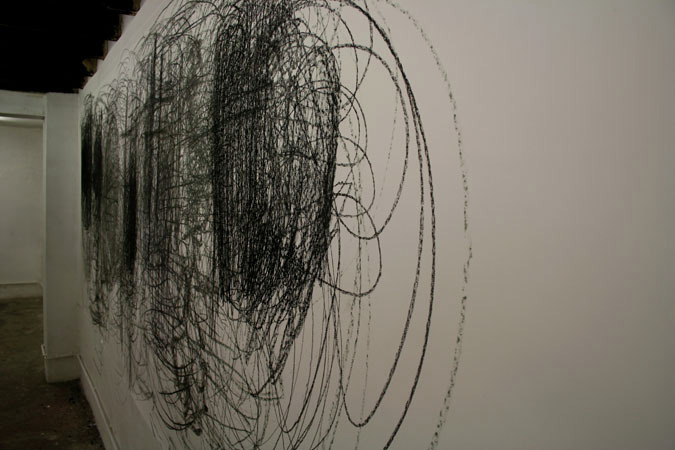 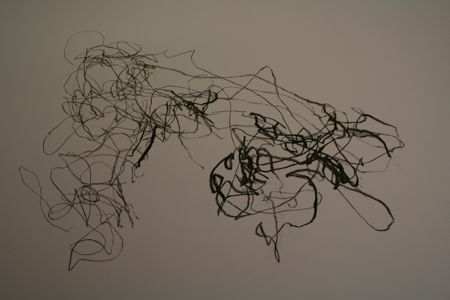 In a collision between dance and drawing, the movements of a dancer were transformed into a series of lines drawn live by the artist (Rochelle Haley). Drawing with both hands simultaneously, the artist tracks the movement of two points on the dancer’s body. 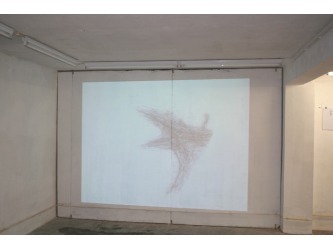 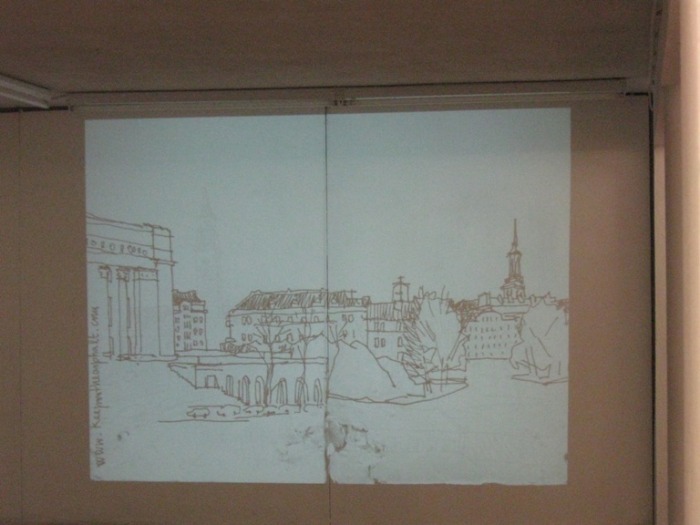 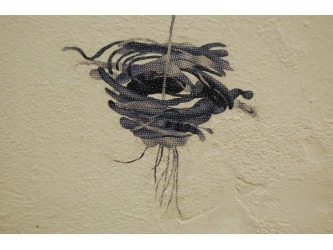 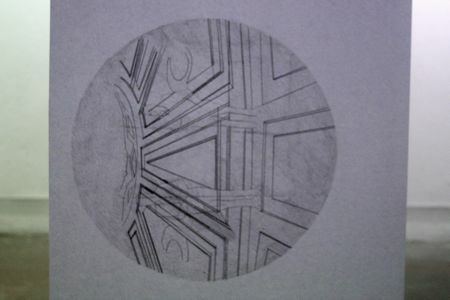 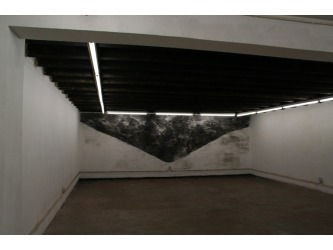 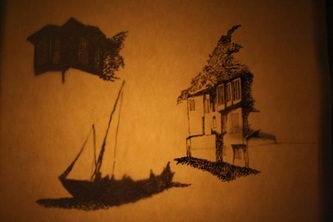 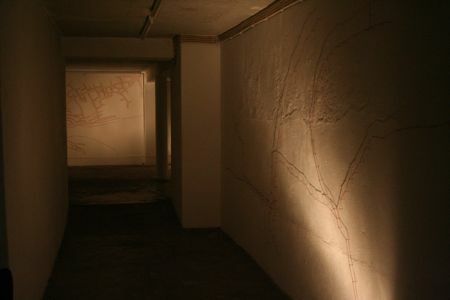 The drawing was filmed from above and was projected onto a wall via a live feed. Other dancers then used the drawn lines as visual cues to interpret their own movement. 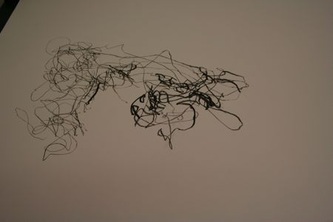 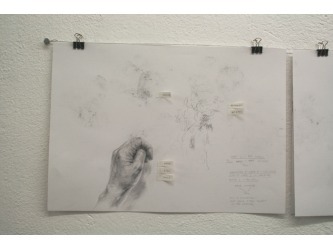 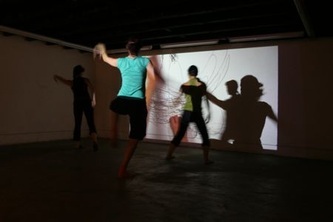 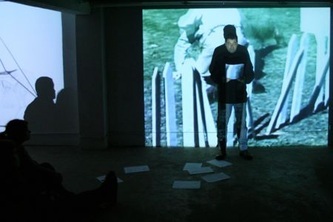 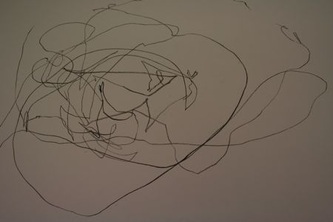 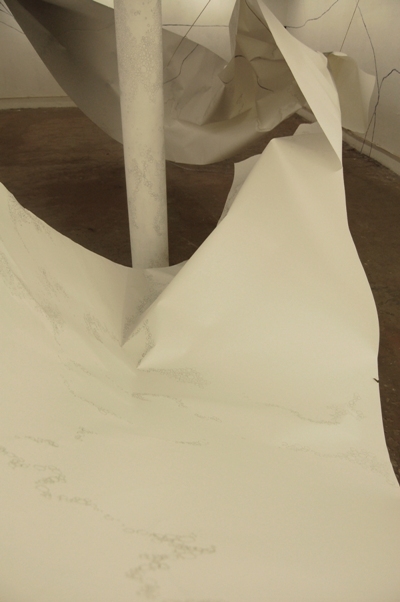 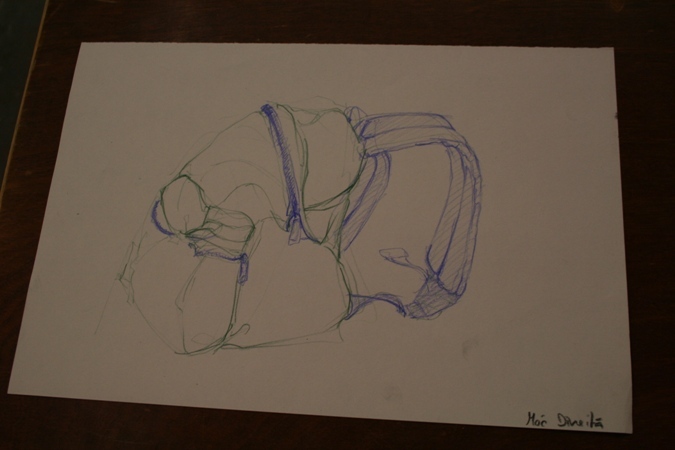 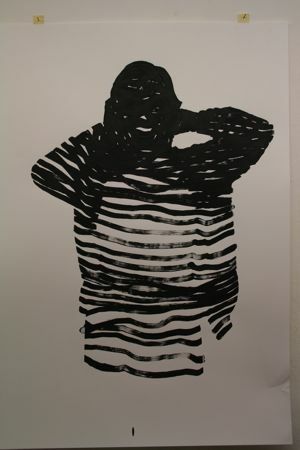 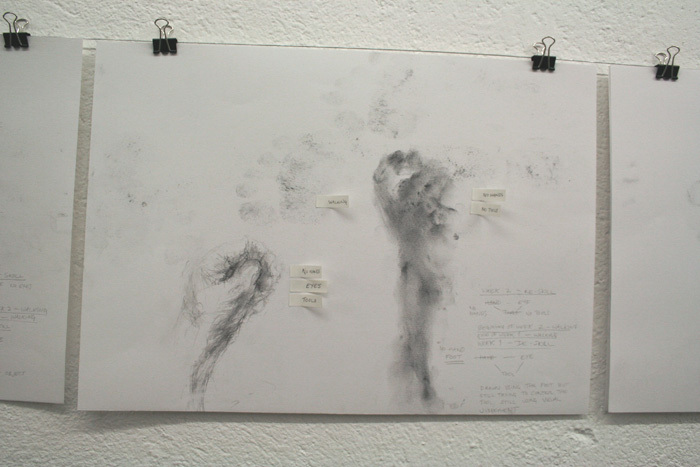 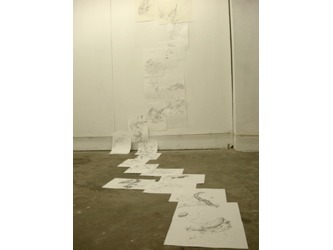 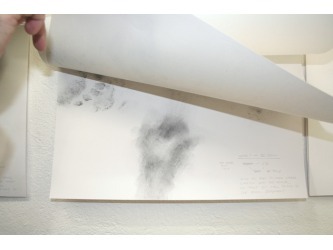 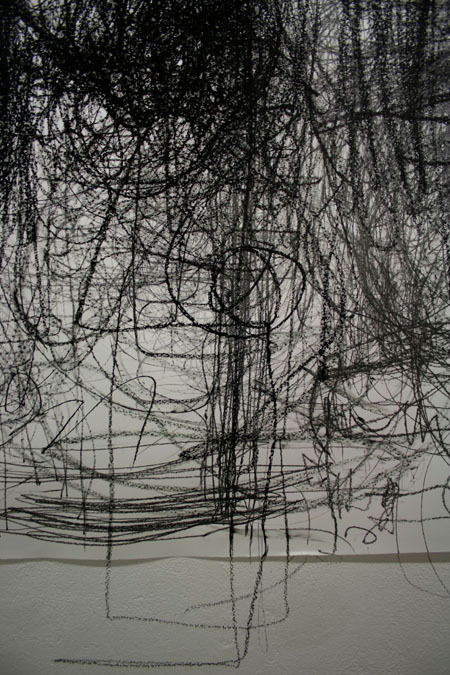 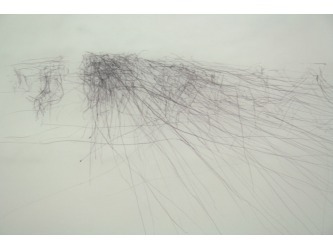 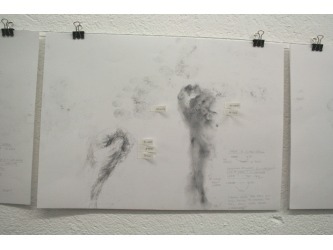 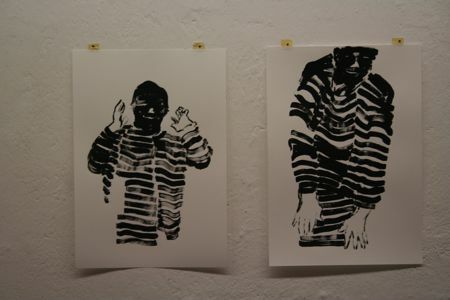 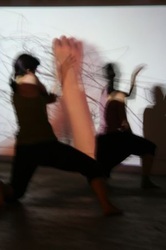 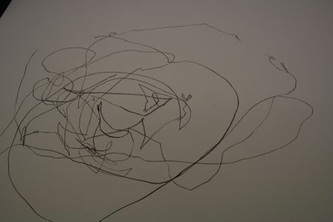 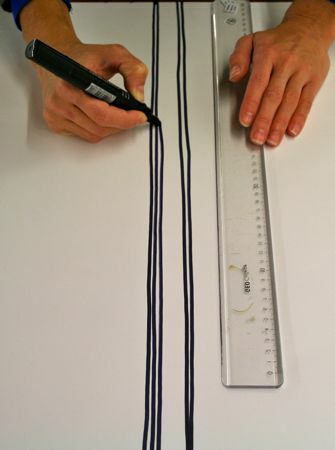 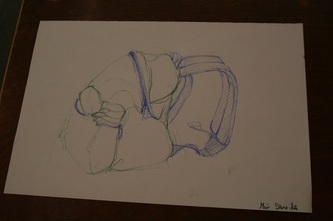 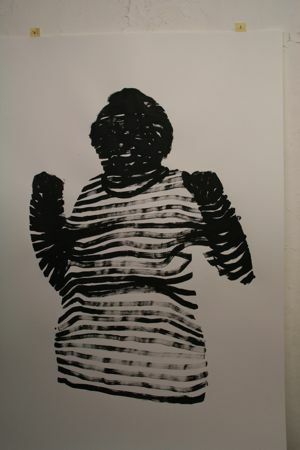 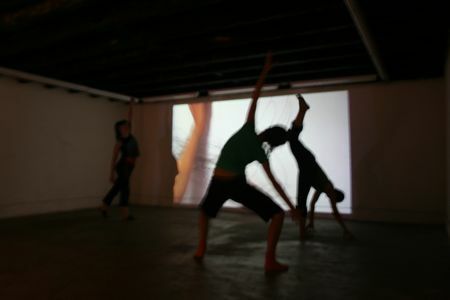 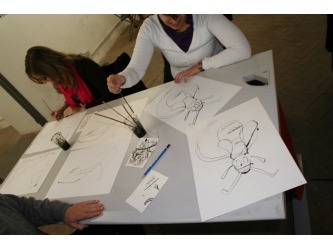 ‘Gesture & Trace’ investigated drawing as an embodied and performance based activity. 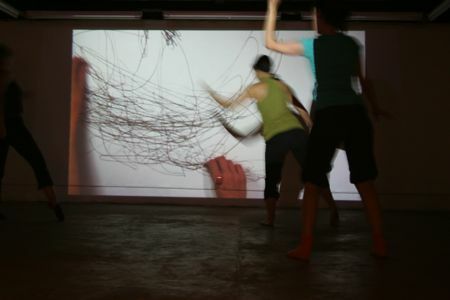 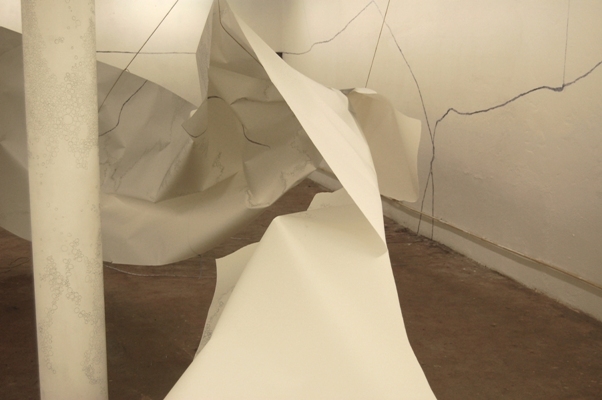 The methodology, maintaining a direct material interaction with the drawn line, explored relationships between the visual graphic mark and dance-based motion. 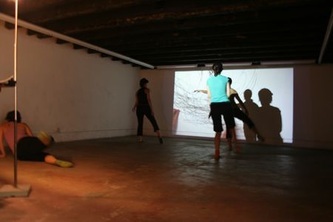 The experimental pairing of dance and drawing provided space to explore complex and figurative interactions between the visual and performing arts. 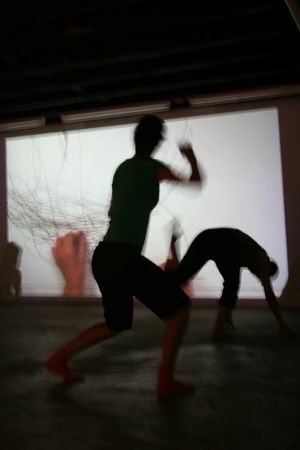 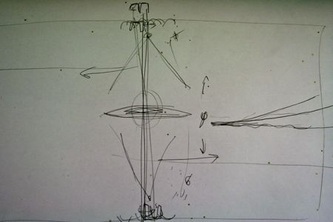 At the heart of this project was the reciprocity between the body, motion and line. 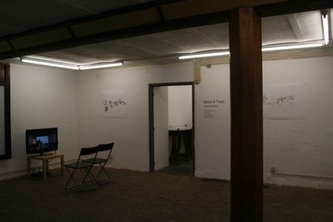 Lines of Passage that correspond, converge and diverge was a project by Minna Philips that took place between the 23rd od April and the 8th of May 2010. 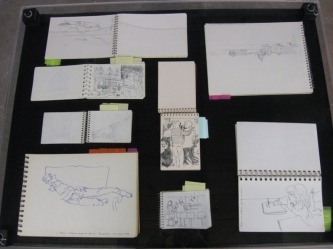 Through her works, Minna Philips aimed to explore a particular position which allowed to experience and object/ event or place from a paradoxical point of view. 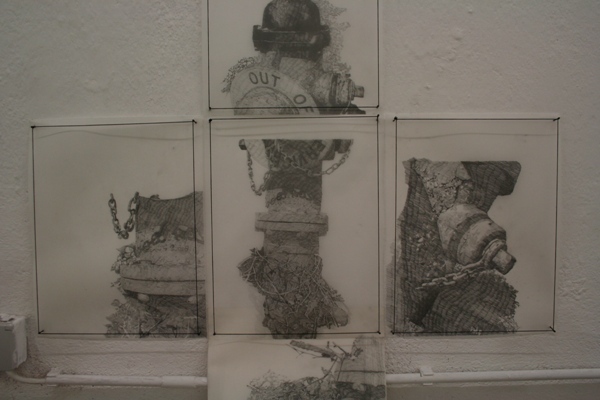 Her drawings related to a kind of imagery that frequently enable paradoxical significations, for example, fire hydrants, sprinkler systems or manhole covers, that represent danger and safety at the same time. 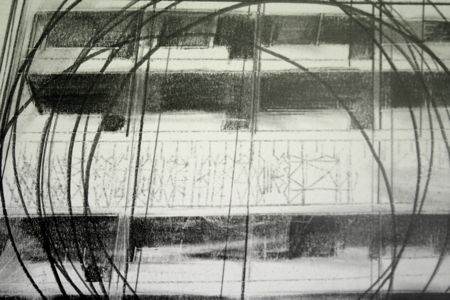 Such imagery was deconstructed in a way to distort perspectives and the drawings are arranged in a manner that is at the same time continuous and fragmented. 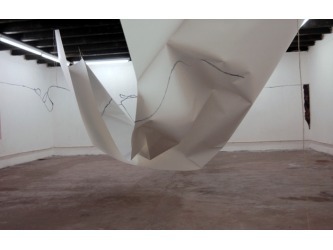 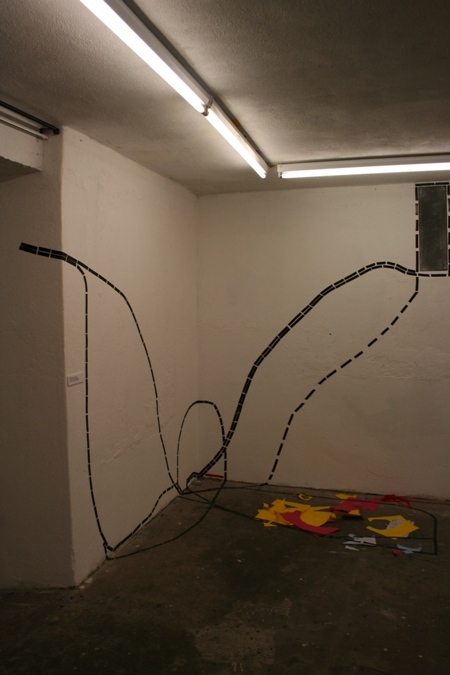 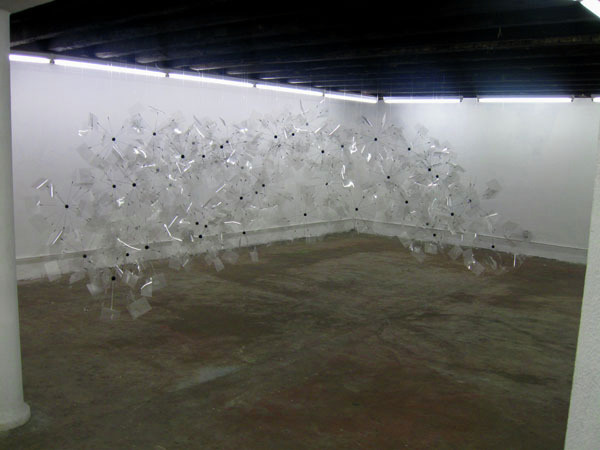 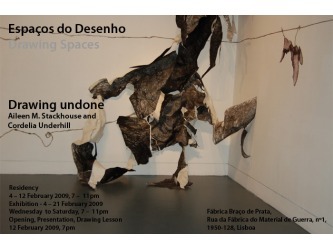 The multiplicity of interpretations and a deconstructed reality was further exaggerated through a process this particular installation was made to adapt to Drawing Spaces / Fábrica Braço de Prata. 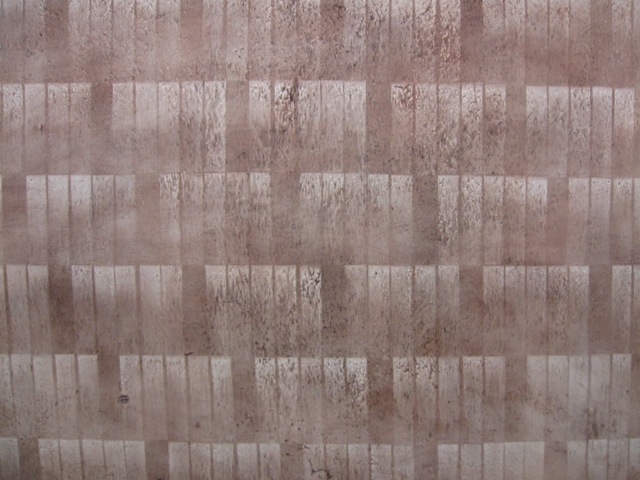 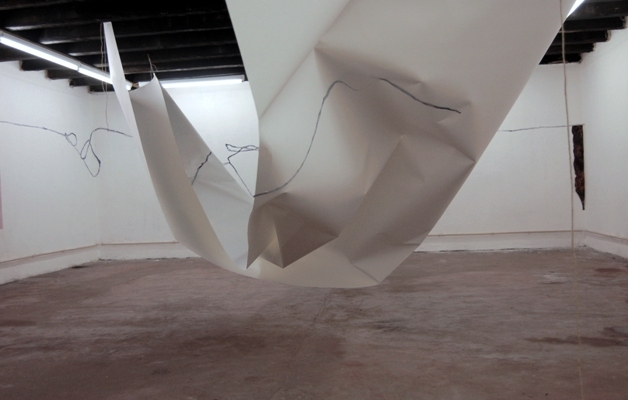 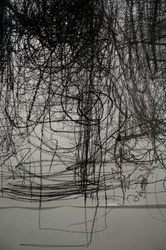 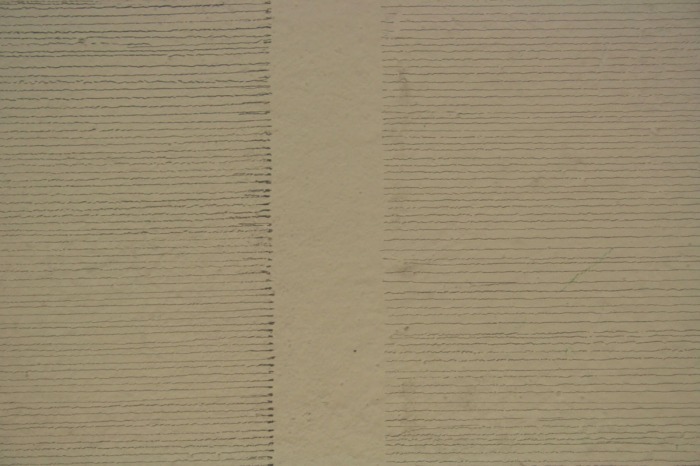 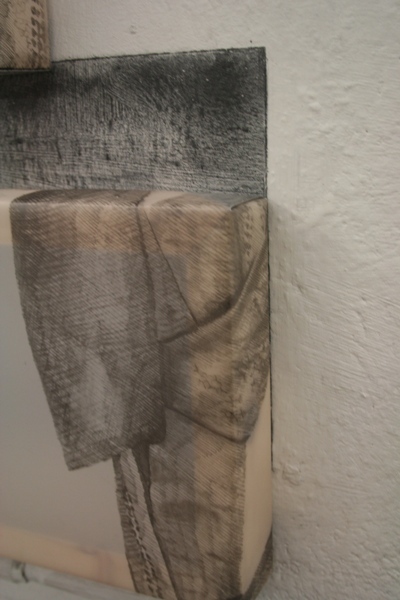 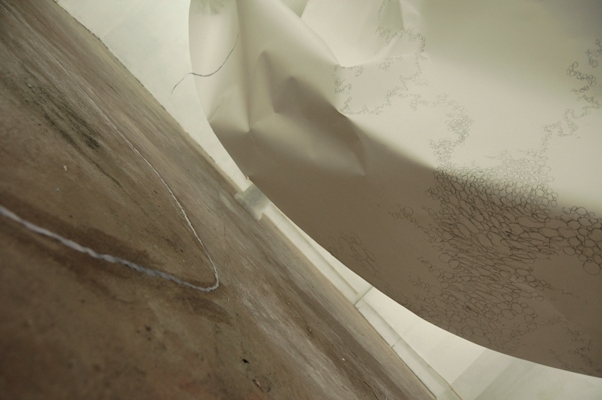 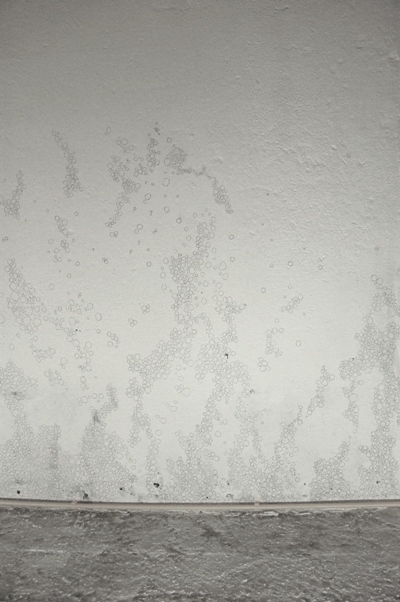 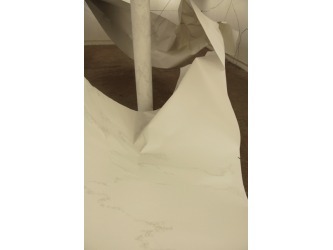 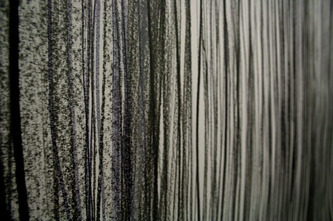 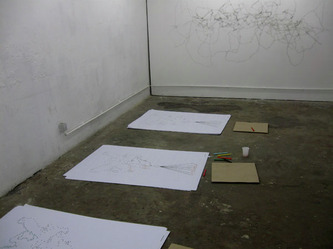 Minna Philips’s drawings acted as paper landscapes that occupied the wall, floor and/or ceiling of Drawing Dpaces. The work was created in the space of the residency/exhibition using the immediate surroundings of this space and some of its singular elements which facilitated the study and integration of the identity of the place. 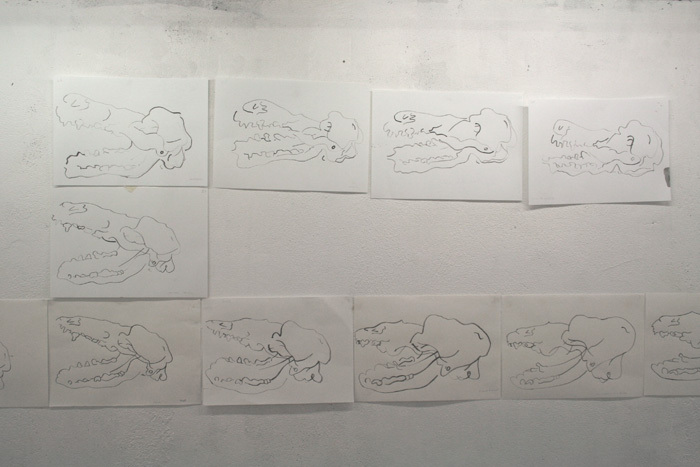 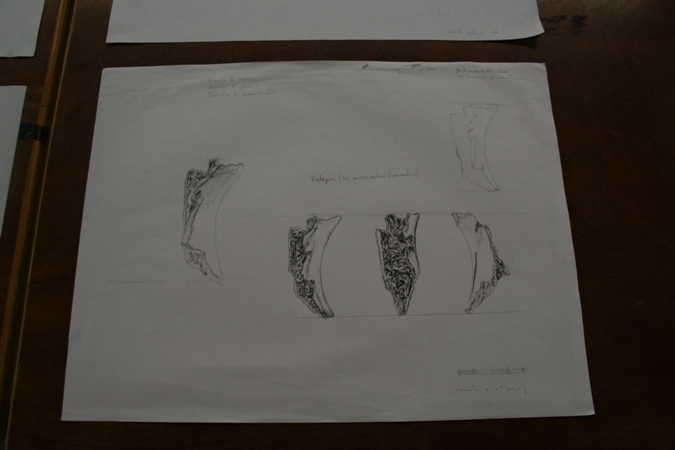 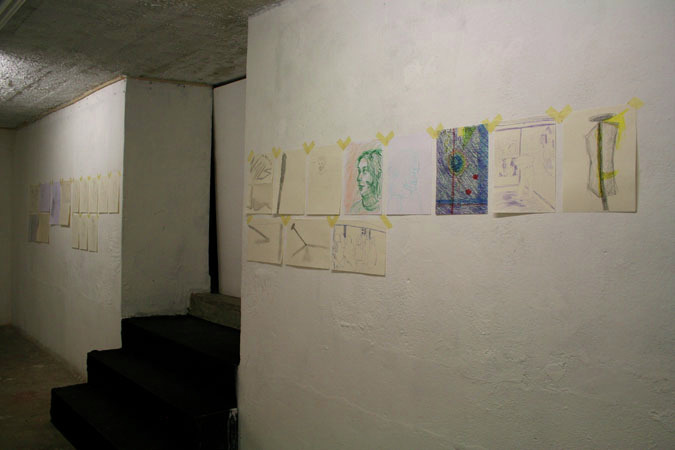 Timeline_Drawing Time, was both a project around a very old tomb (the tomb of D.Fernando I, king of Portugal) using methodologies of archaeological illustration, and a work in progress where the viewers can accompany the evolution of the drawing in time. 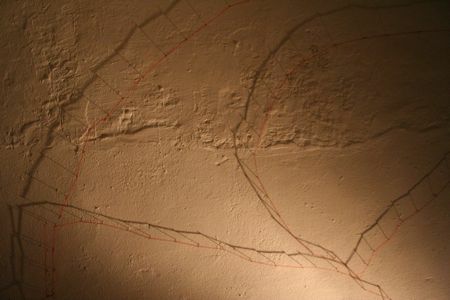 This residence created the opportunity to question the role of the Archaeological Illustrator, namely in its ambiguous position between being an artist and a scientist. 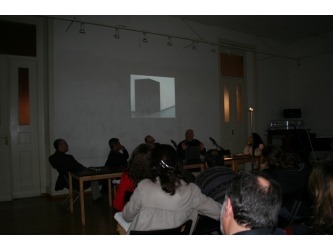 On the 1st of April took place a Round Table Discussion - “State of the Art in Scientific Illustration" with Ilknur Ari, Guida Casella, Prof. Olga Pombo, Nuno Nabais and Pedro Salgado - The role of the image in History, Art and Science will be put in perspective through different approaches of Scholars, Researchers and Practitioners. 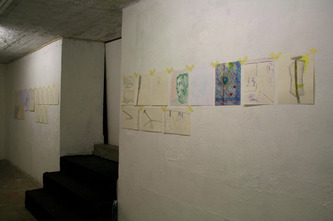 The draughswomen/men draw one another, was a project that took place between the 3th and the 20th of February at Drawing Spaces. During the period of 10 days, three artists draw and portray one other obsessively. 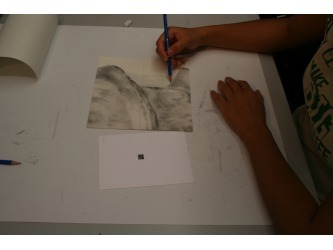 The modes of register varied, more or less directly referring to traditional drawing. 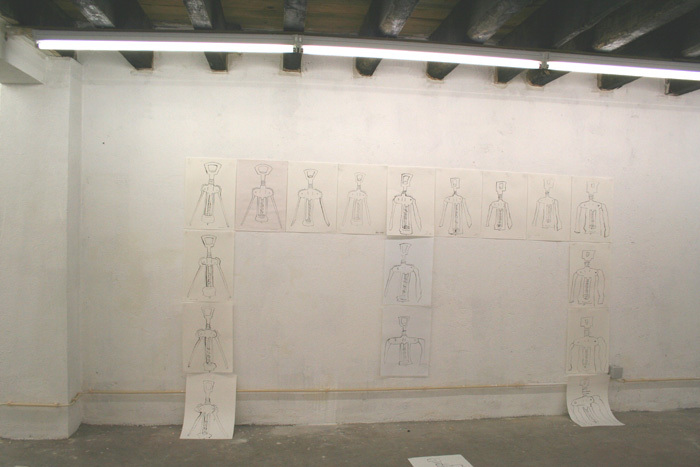 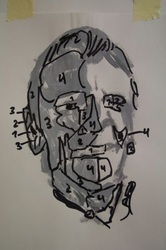 In P2 – duplicate, it was proposed to the groups of students/visitors that they draw and observe the draughtswomen/men, becoming themselves also draughtswomen/men. Two parallel paths were established here. 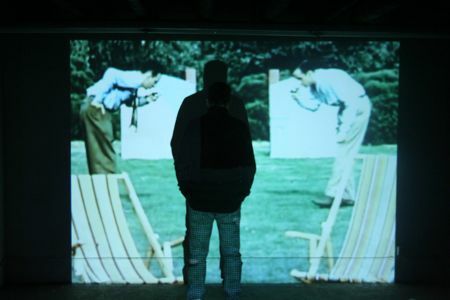 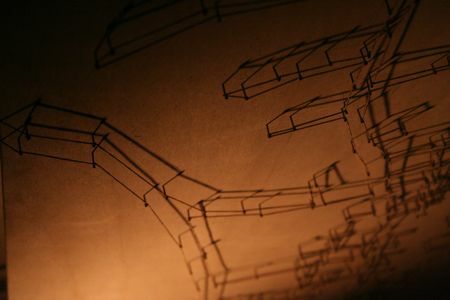 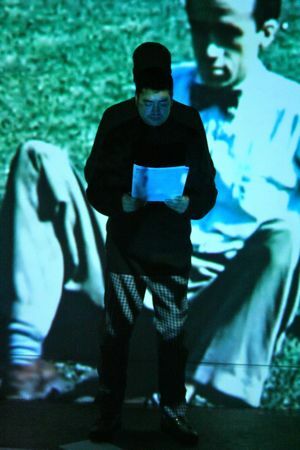 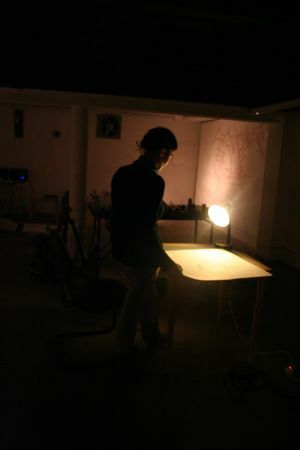 Apart from the traditional methods of drawing, other working methods were used: photography, transposition, transference, digital manipulation, video, drawing projections as well as drawings from projections, etc. 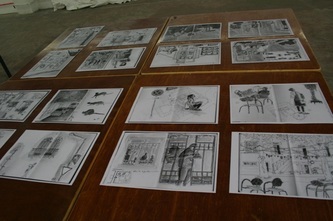 Some of these methods were used in articulation with others. The Opening/Presentation of the project was on the 13rd of February, with an open talk between the artist and Maria João Gamito. 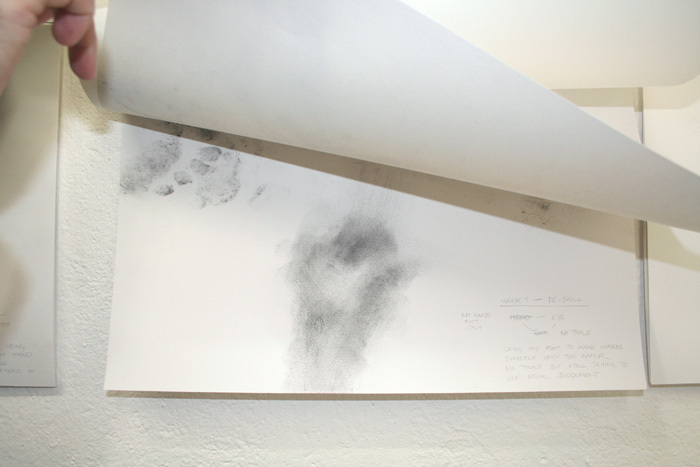 They shook us real hard, there at the battle field was a project that took place between the 9th and the 20th of December at Drawing Spaces. 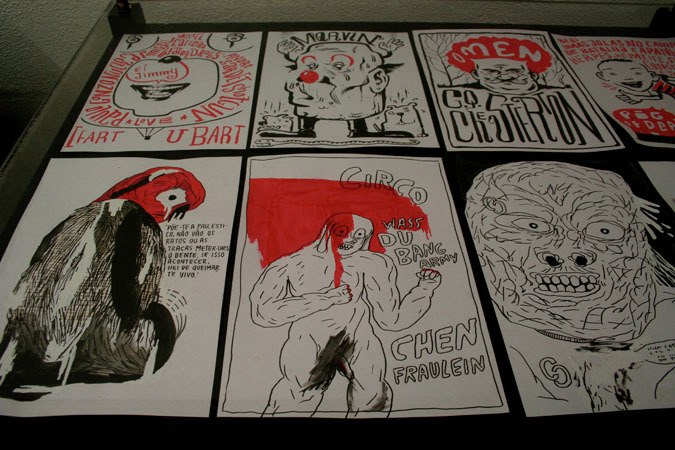 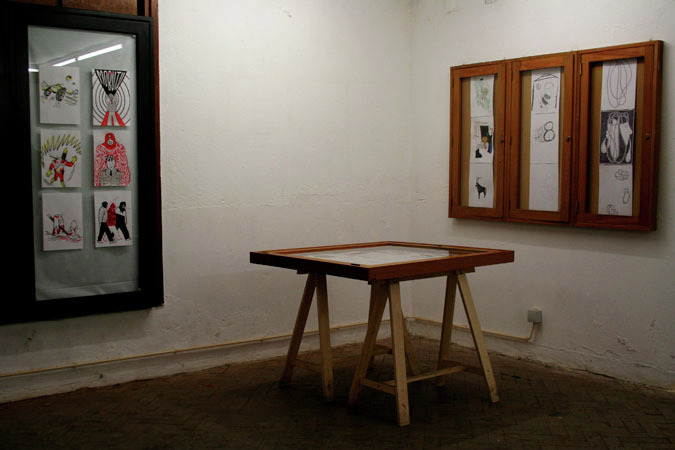 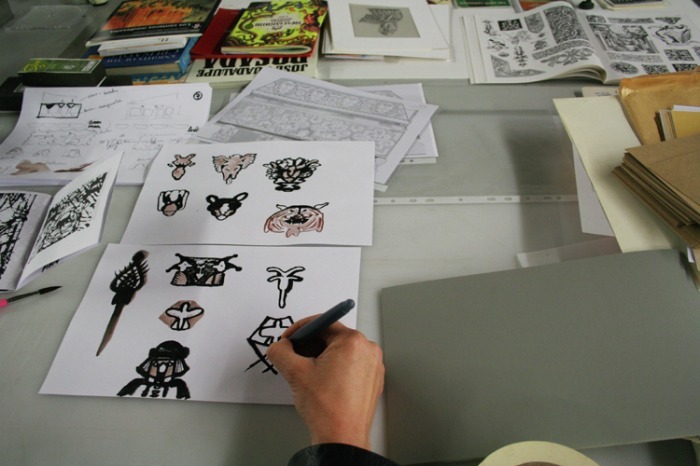 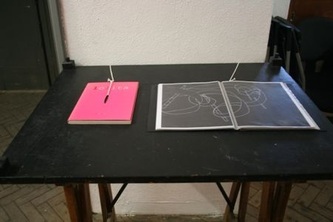 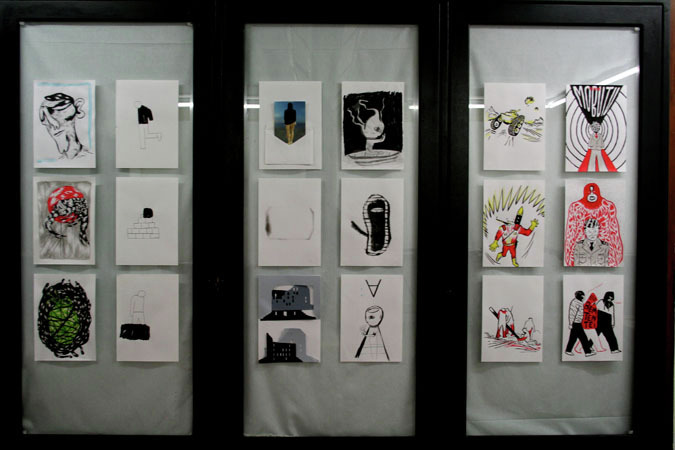 - A collective exhibition of drawings showing multiple uses and approaches of this activity in zines, illustrations and independent series of works; and incorporating also works developed from drawings. 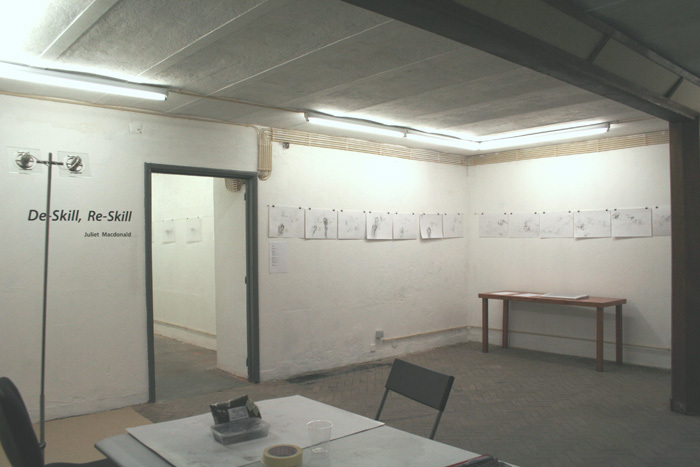 - One edition, produced in loco, with series of works produced by various artists during the time of the project at Drawing Spaces. 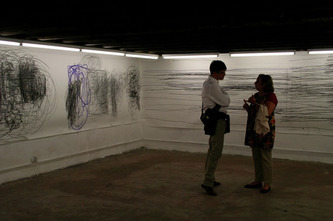 The public was invited to visit the space during opening hours, and followed the development of these works. 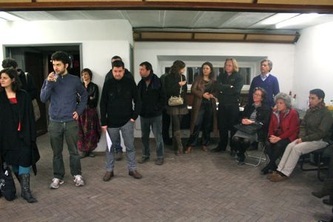 The Opening/Presentation of the project was on the 19st, with Pedro Moura. Participant Artists: Alex Gozblau, Ana Biscaia, Ana Menezes , André Lemos, António Coelho/Atelier Mike Goes West , Bárbara Assis Pacheco, Bruno Borges, Daniel Borges, Filipe Abranches, Joanna Latka, João Chambel, João Maio Pinto, José Feitor, Jucifer, Luís Henriques, Isabel Baraona, Pedro Zamith, Ricardo Martins and others. 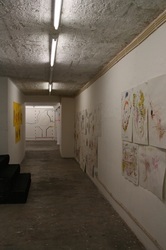 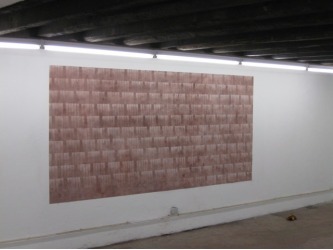 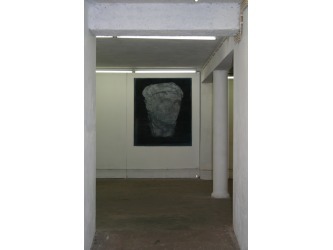 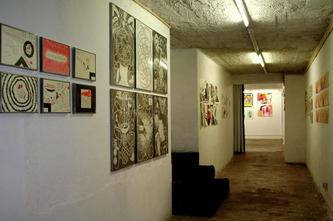 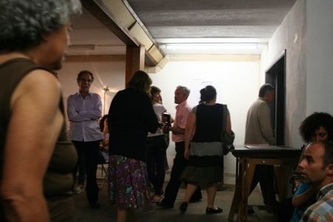 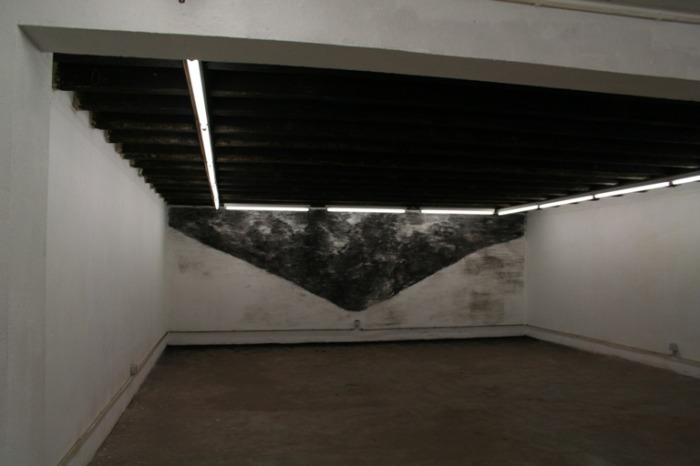 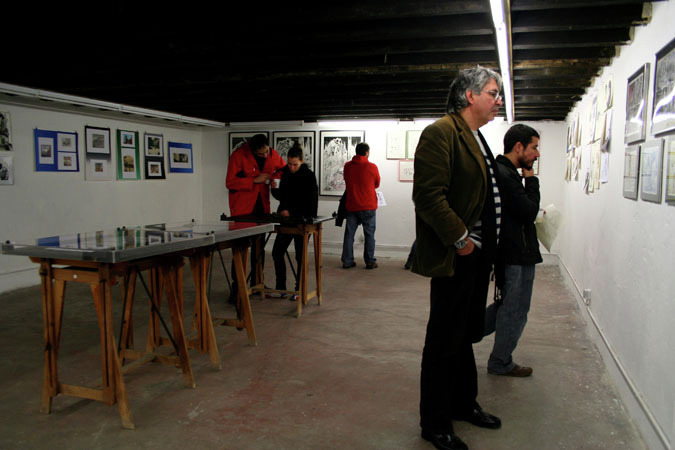 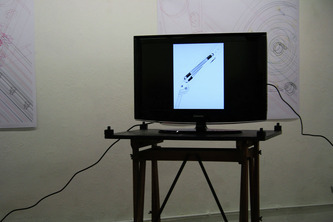 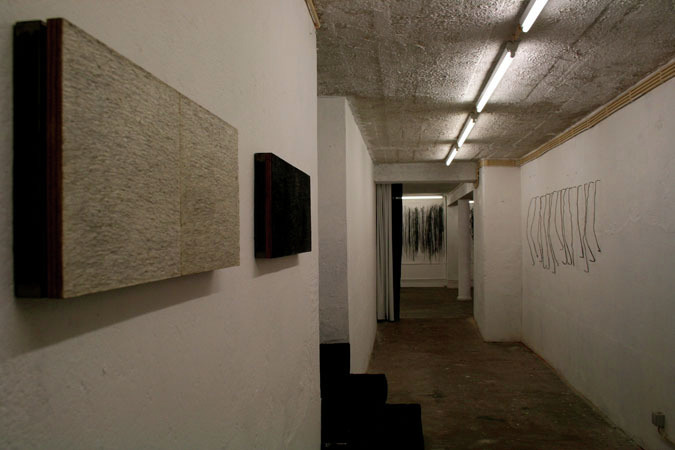 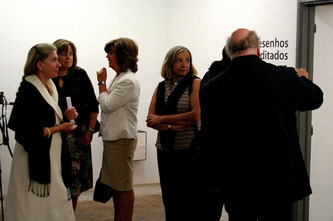 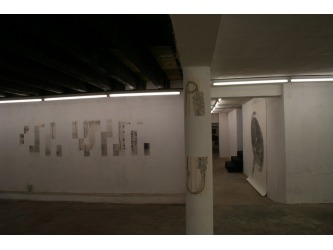 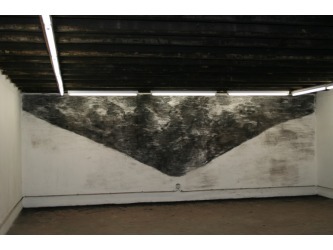 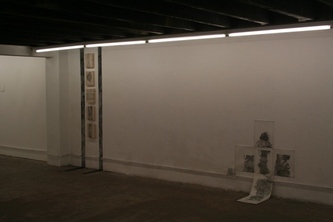 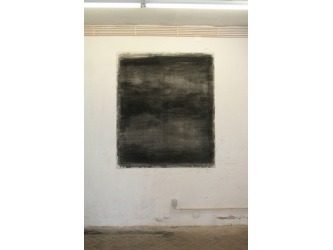 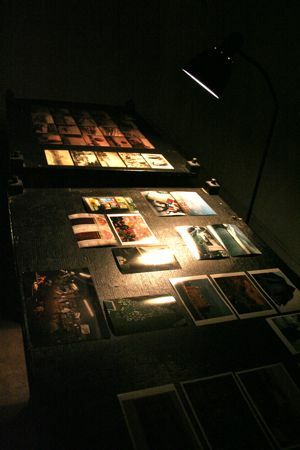 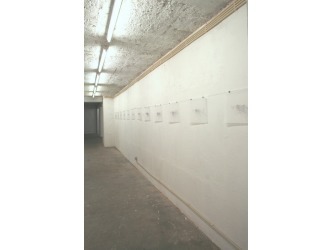 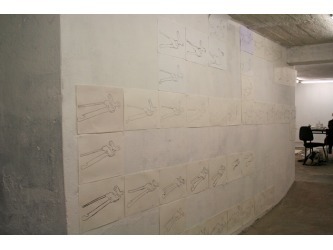 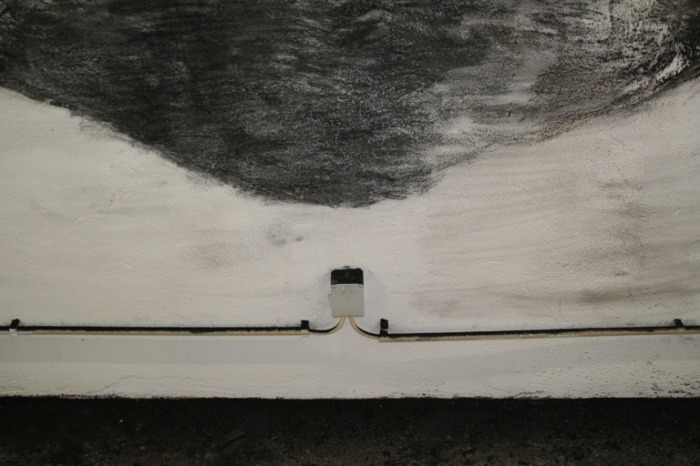 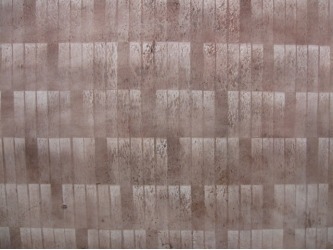 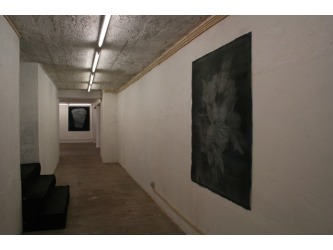 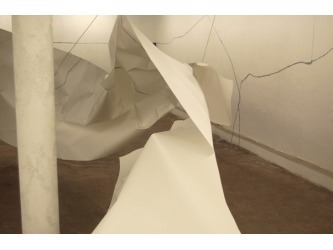 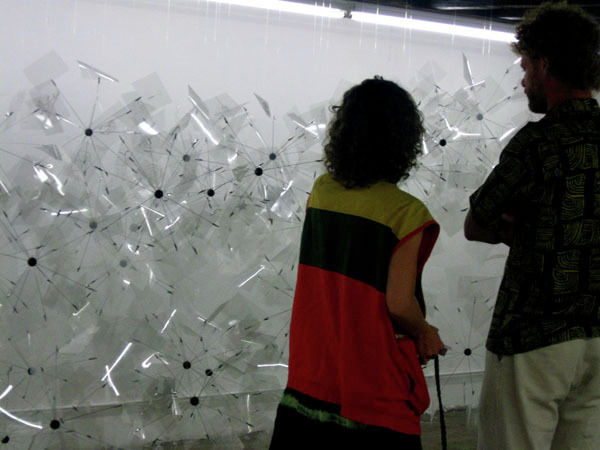 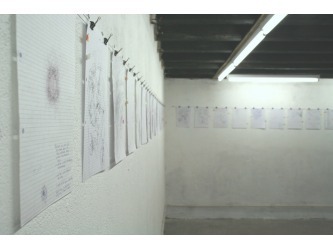 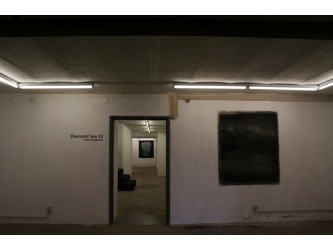 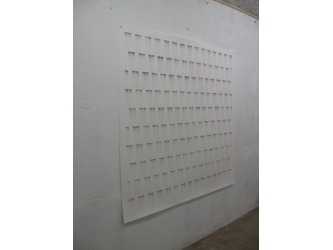 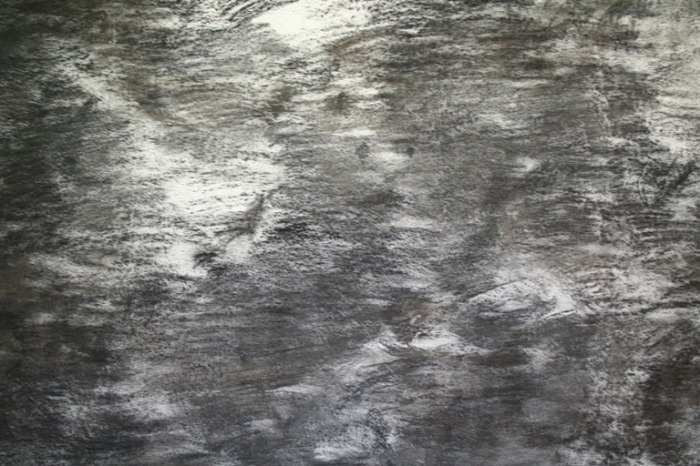 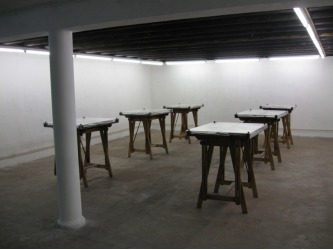 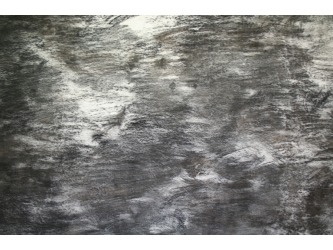 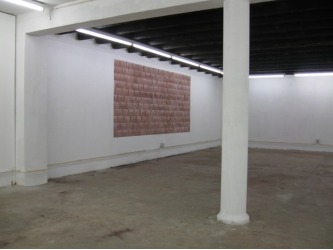 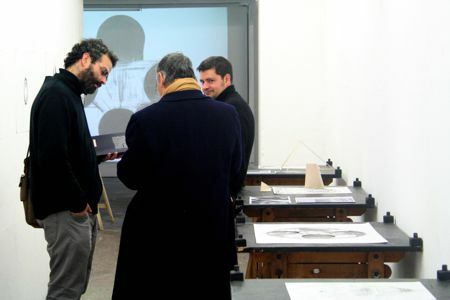 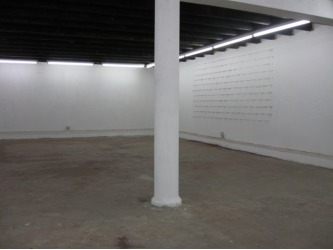 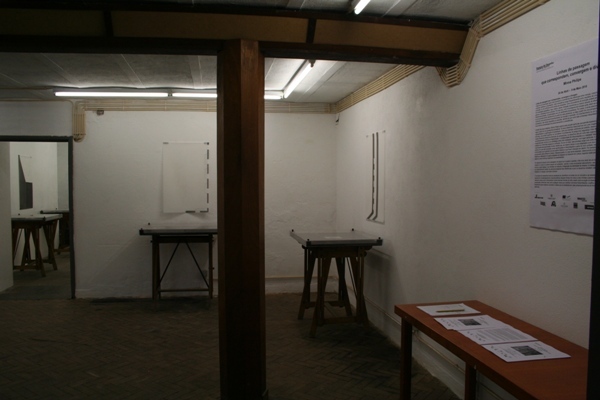 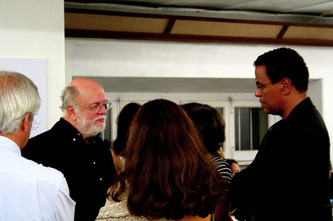 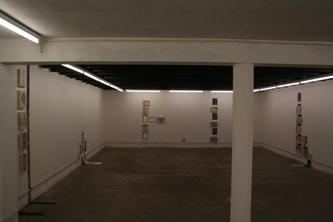 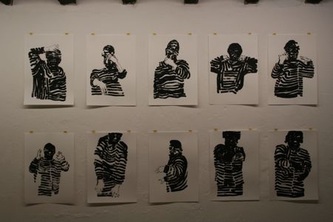 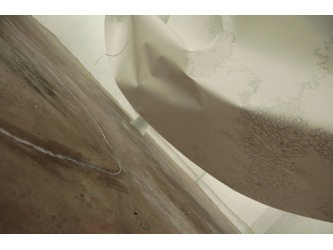 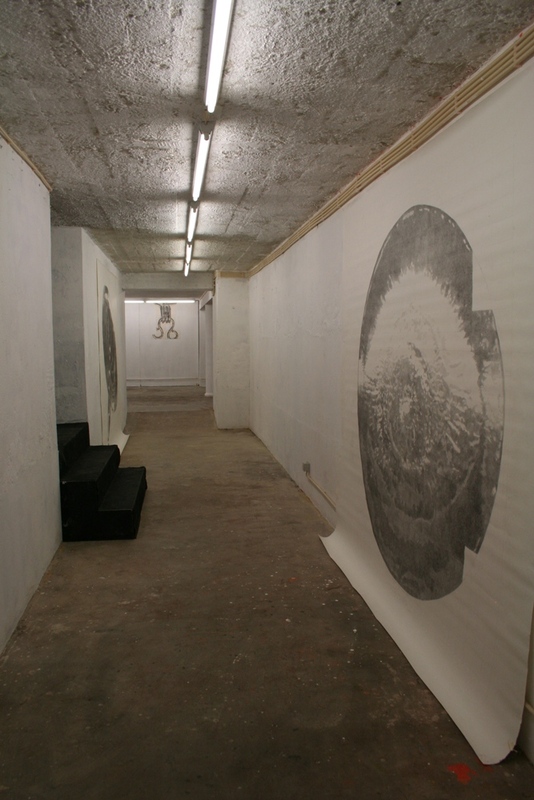 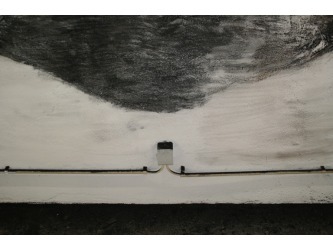 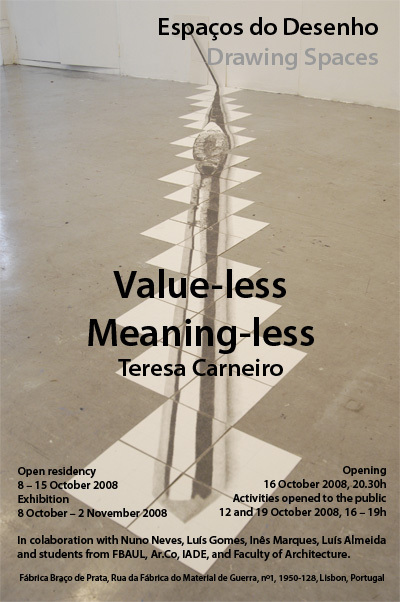 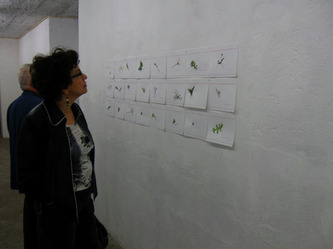 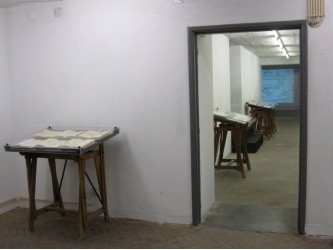 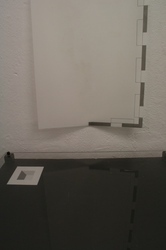 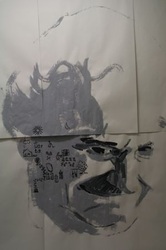 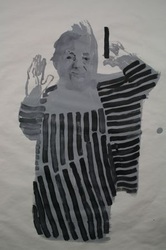 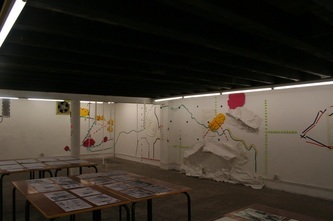 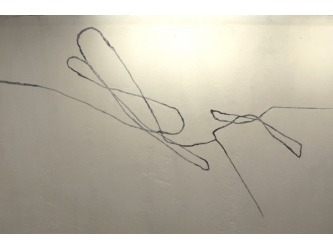 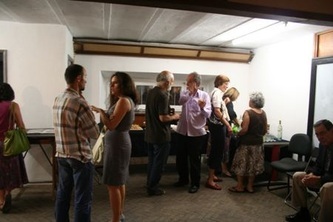 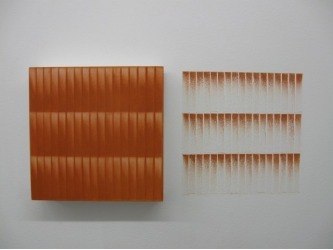 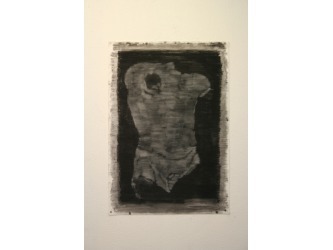 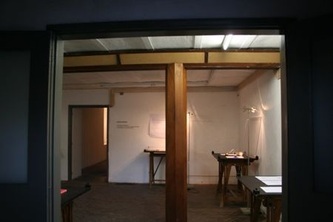 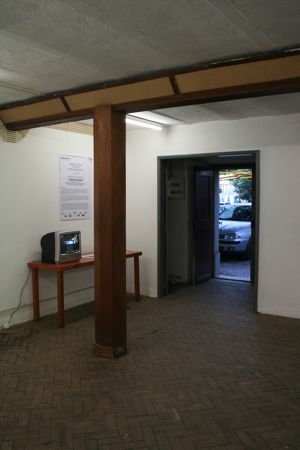 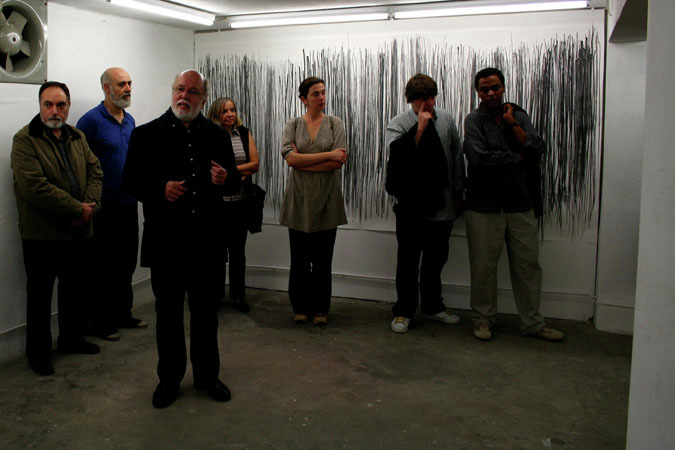 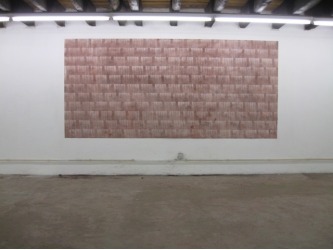 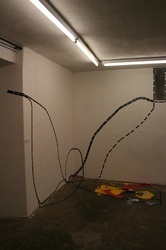 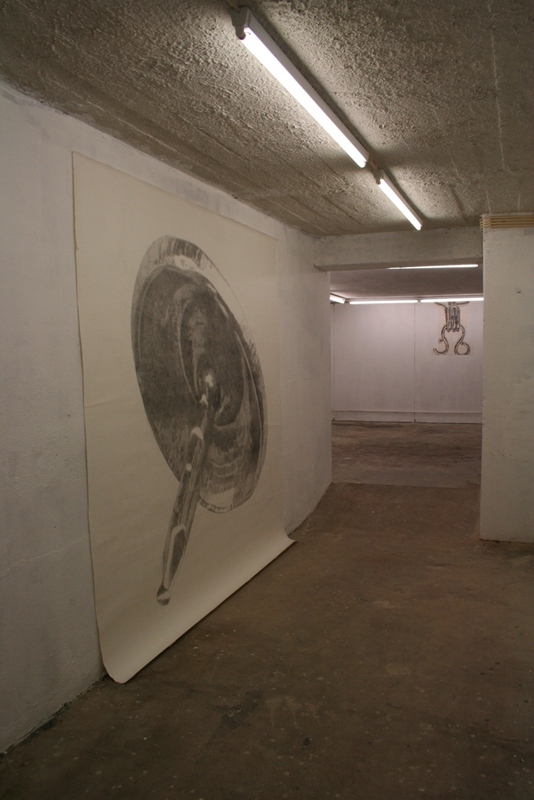 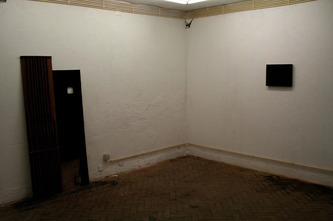 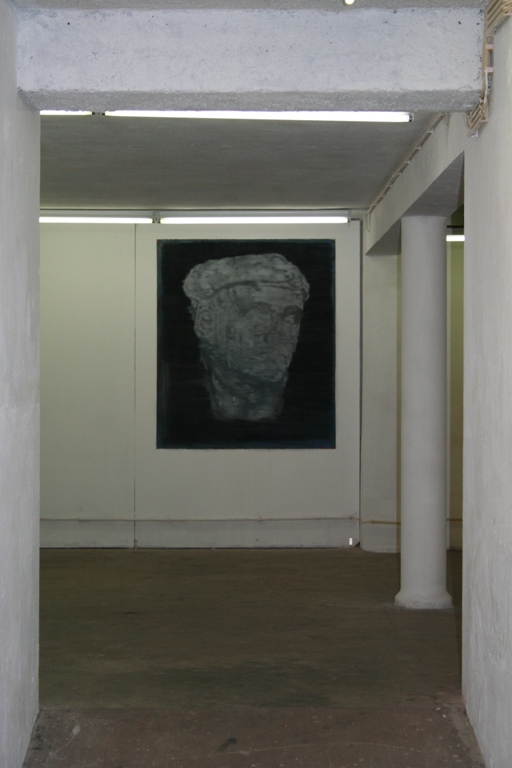 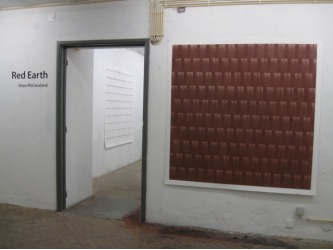 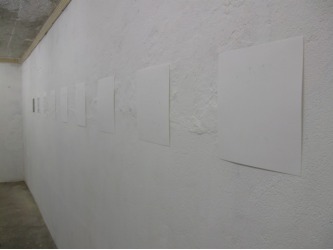 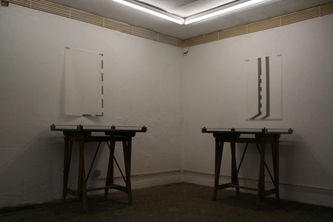 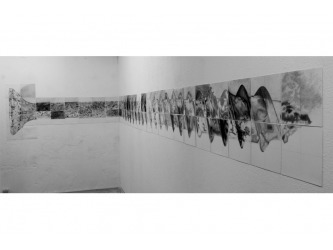 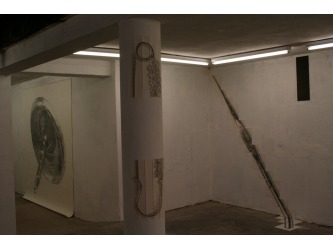 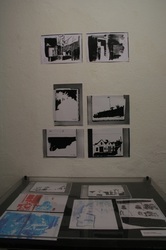 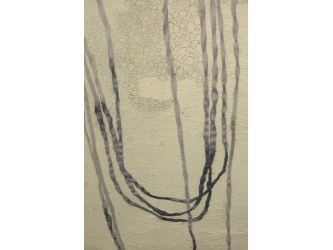 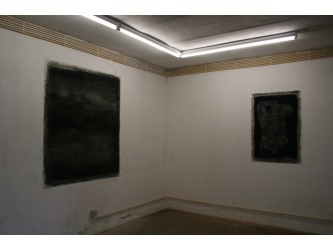 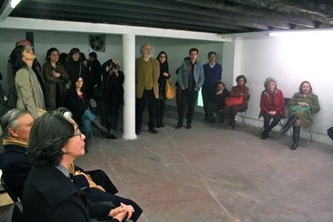 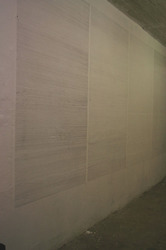 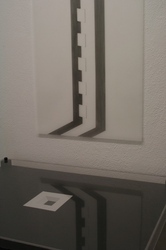 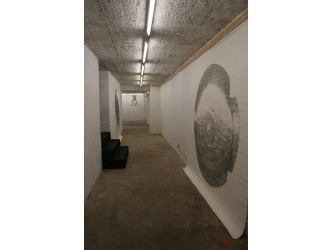 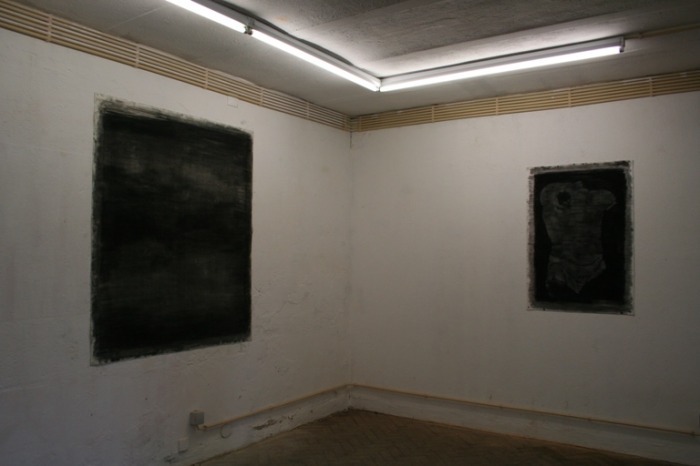 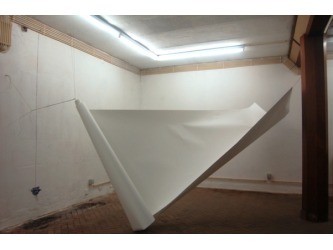 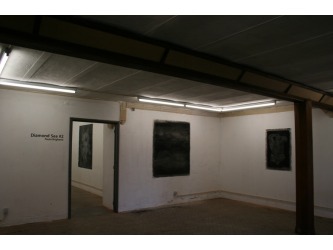 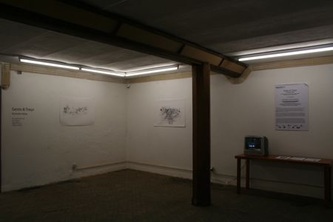 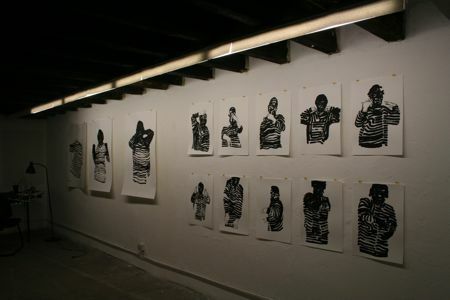 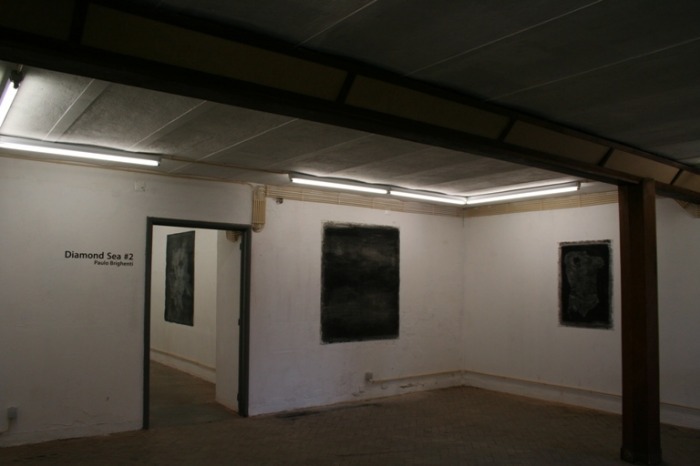 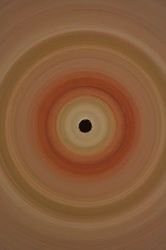 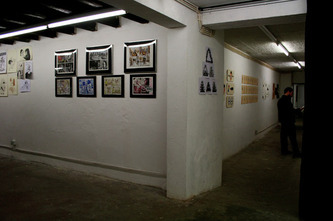 Artists exhibiting works: Ana Menezes , André Lemos , Bruno Borges, Carlos Pinheiro, Cátia Serrão, Daniel Lima, Filipe Abranches, João Fazenda, João Maio Pinto, José Cardoso, José Feitor, Jucifer, Júlio Dolbeth, Luís Henriques, Marco Mendes, Marta & Alves Von Calhau, Miguel Carneiro, Nuno Sousa, Pedro Lourenço, Ricardo Martins, Rosa Baptista, Rui Vitorino Santos and others. 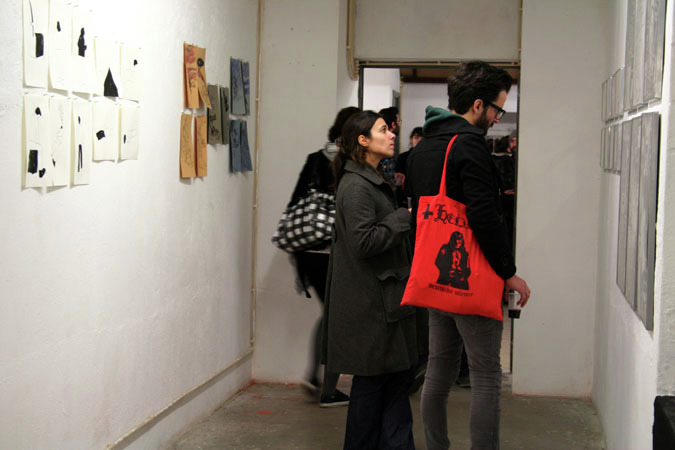 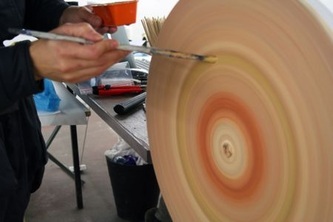 The 15th Laica Fair took place on the 19th and 20th of December at Prado Coelho Room in Fabrica Braço de Prata. 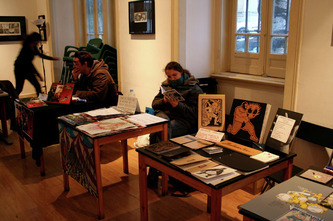 The Laica Fair a cultural project with specific creative and artistic aims as well as commercial ambition; it is organized by an informal group of people connect to the graphic arts and concerned with the world of independent editions. Concerts that took place during the Laica Fair, on the 20th of December, starnting at 6pm: Movie Blogs Internet Free Tv Online Movies Database; (///); Cangarra; Gnu. 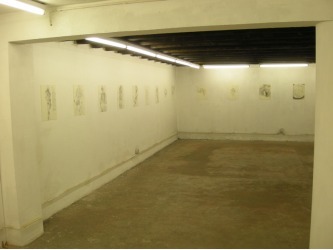 This was a project by Diana Regal that took place between the 12th and the 28th of November at Drawing Spaces. 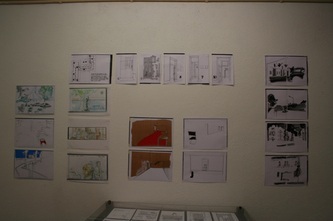 The project was divided in two parts: witch one developed in one week. During the all project, the movie Moiras by Regina Guimarães and Saguenail, will be in exhibition for the general public. 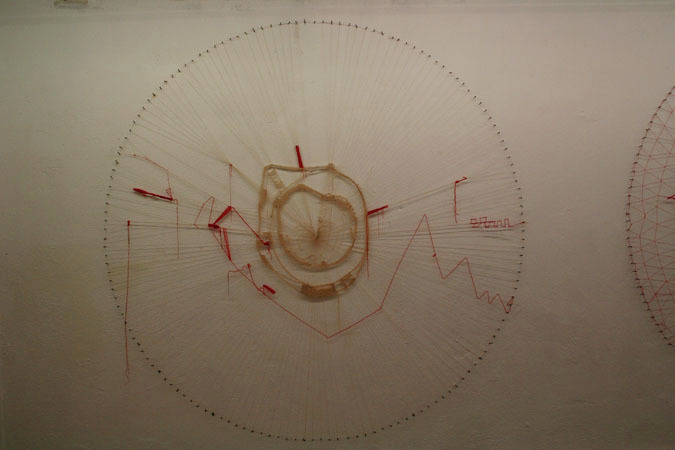 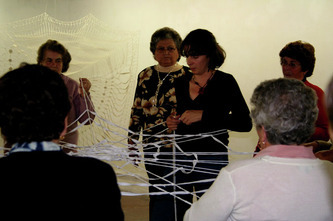 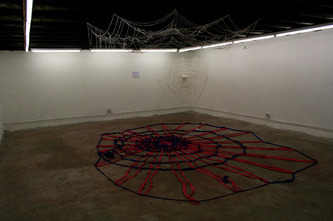 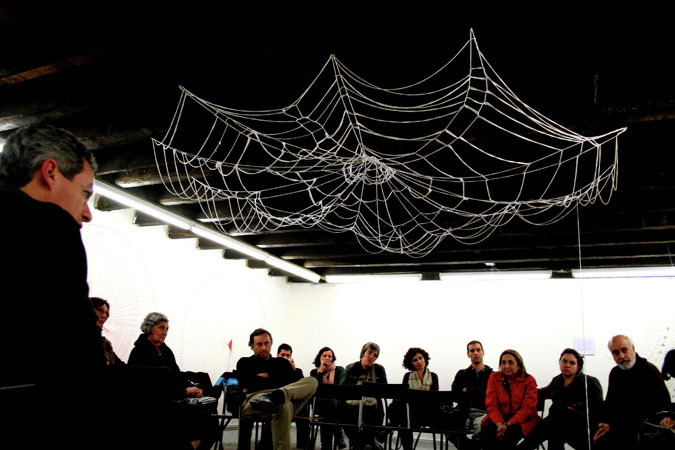 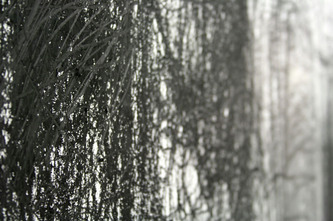 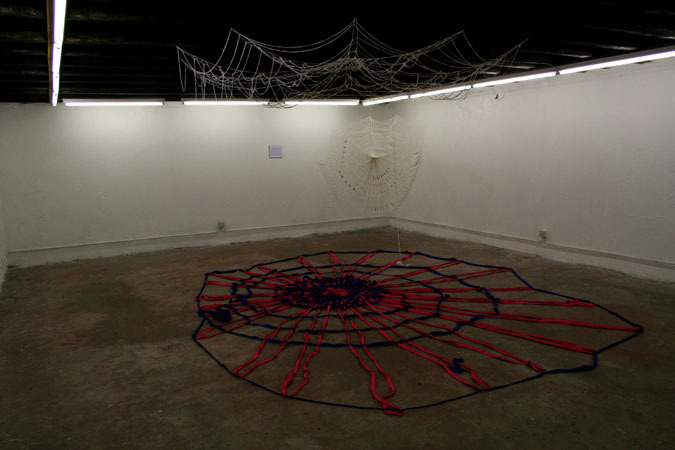 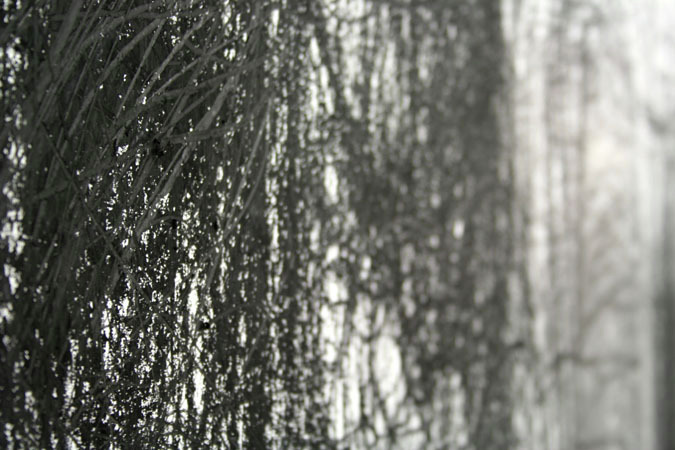 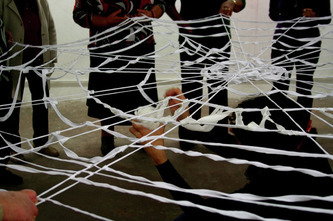 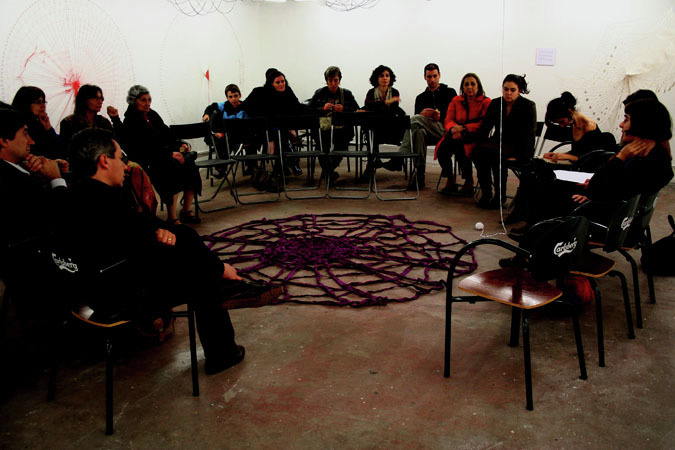 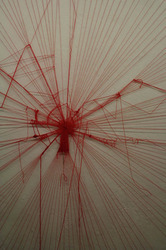 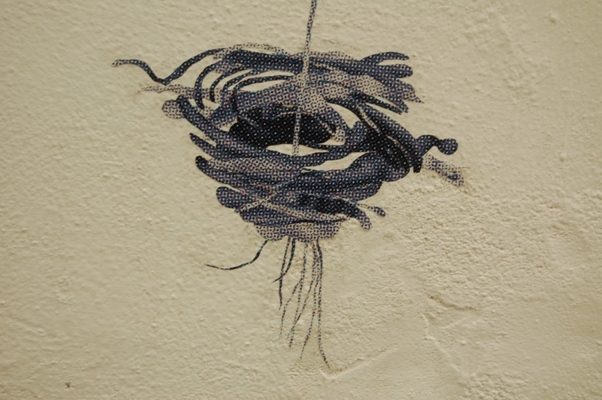 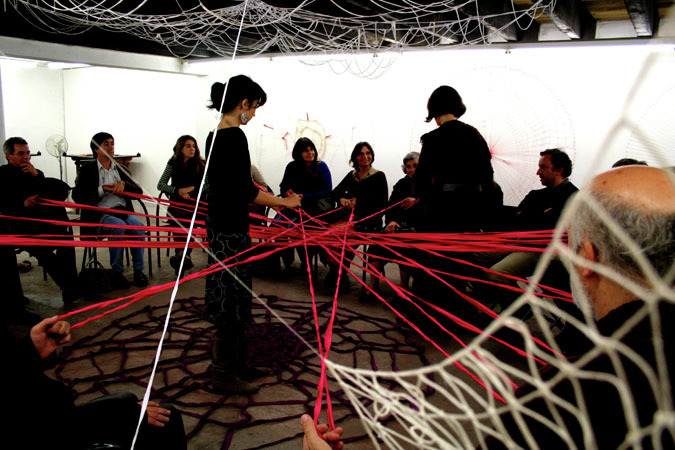 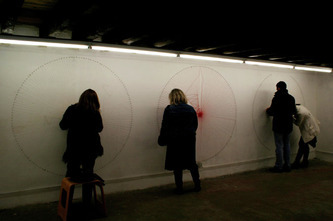 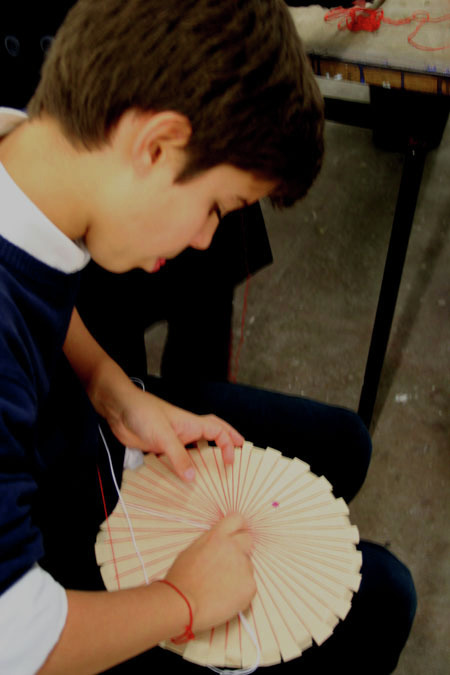 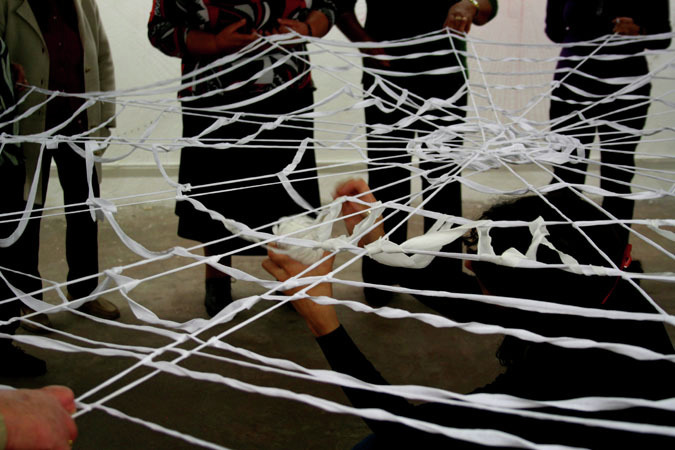 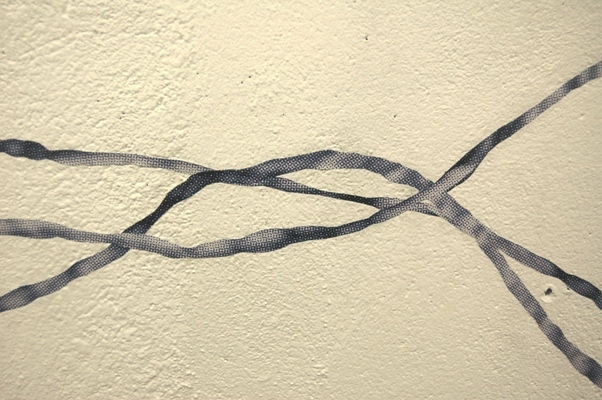 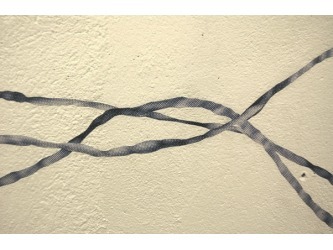 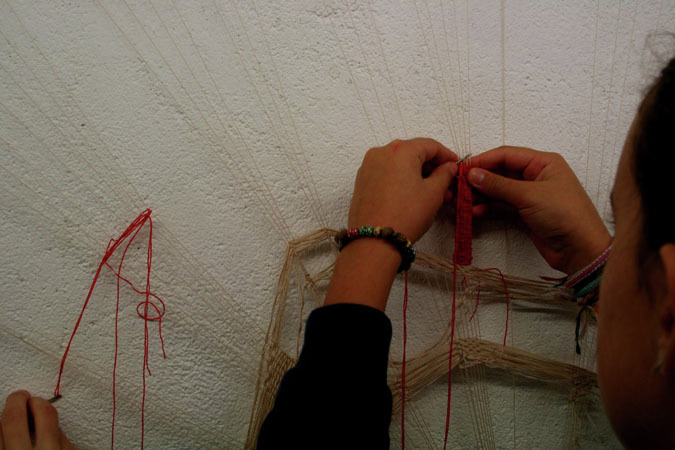 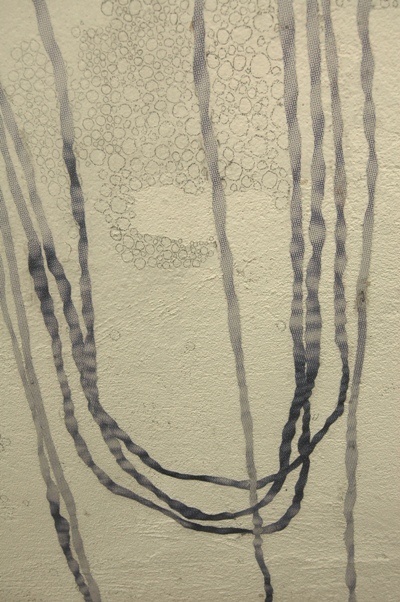 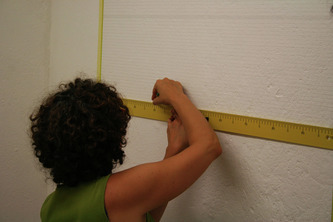 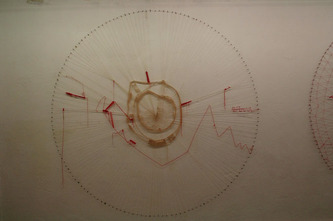 From the 12th to the 15th of November, Diana Regal proposed the construction of “framed drawings” made with strings that are based on a circular figure, which will refer to particular techniques of textile production as the Renda Tenerife and the Renda de Milão. 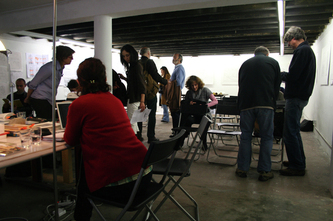 It happened a Open workshop for the community (under the scope of Grundtvig Program). Festa da Lã happened on the 14th, at 8pm, where a group of 20 women from Viana do Alentejo worked in a gigant web while singing tradicional songs from Alentejo. 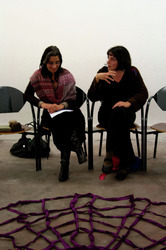 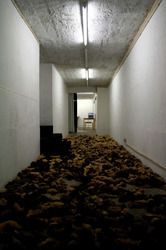 Between the 19th and the 21st , took place the Felt Workshop – Traces on Wool, open to the general public, with technical orientation by Diana Regal. 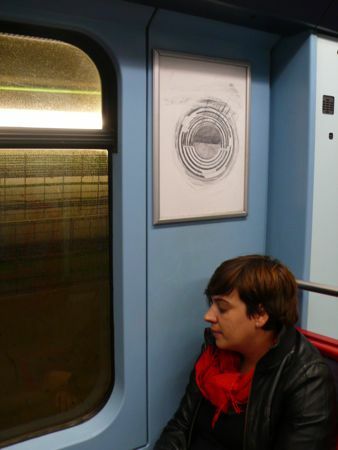 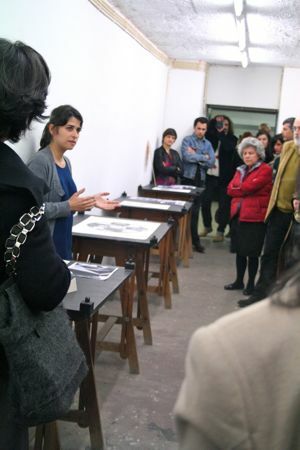 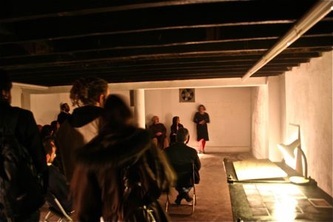 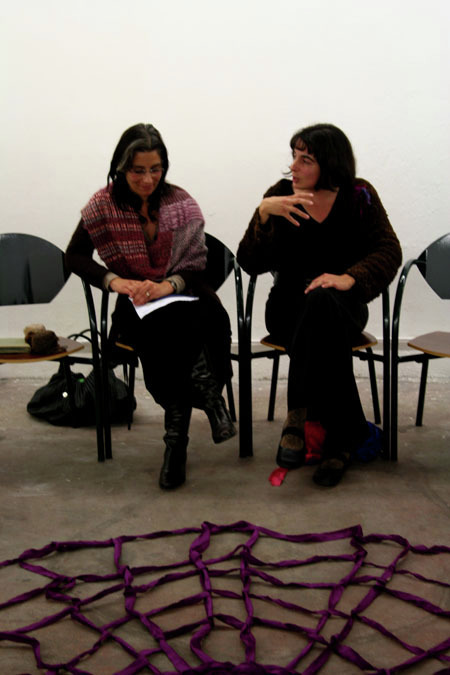 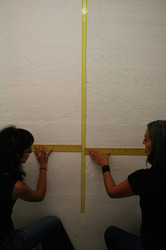 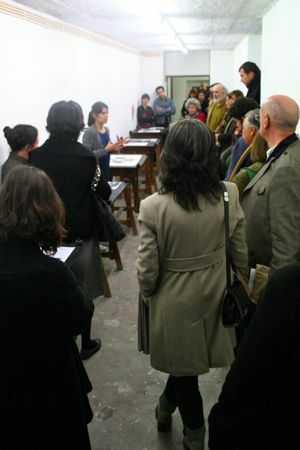 The Opening/Presentation of the project was on the 21st , at 9pm, with Sara Barriga. 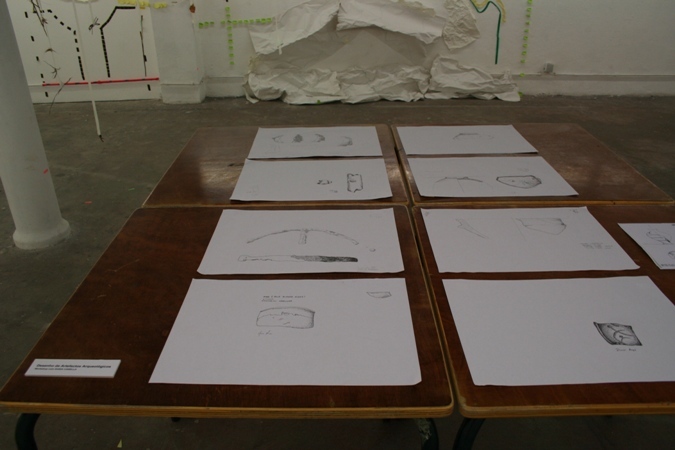 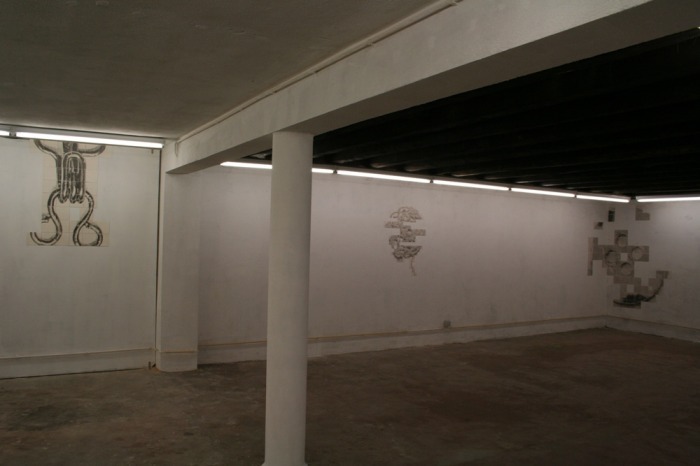 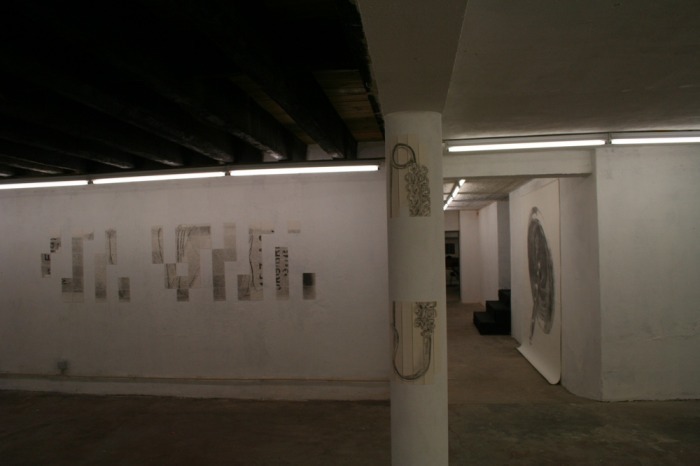 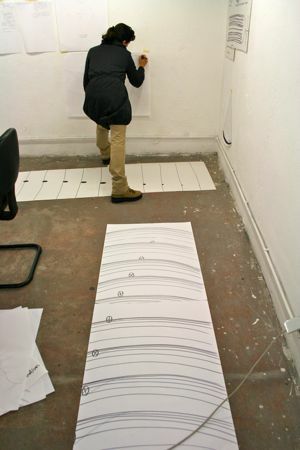 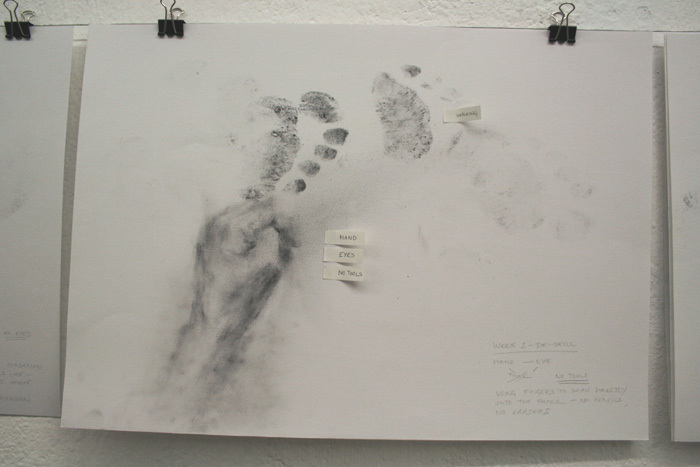 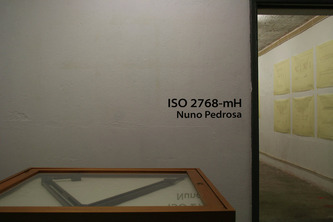 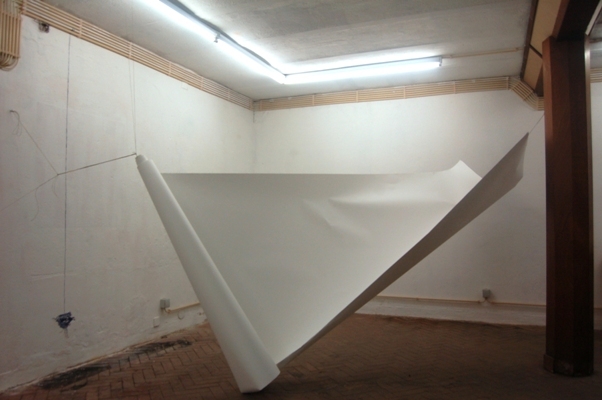 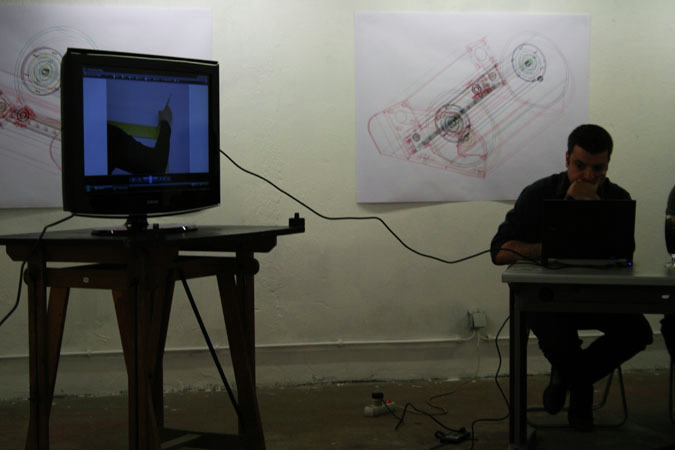 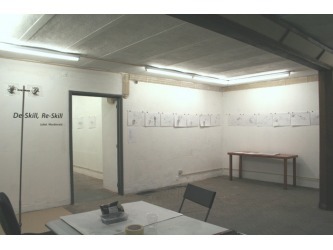 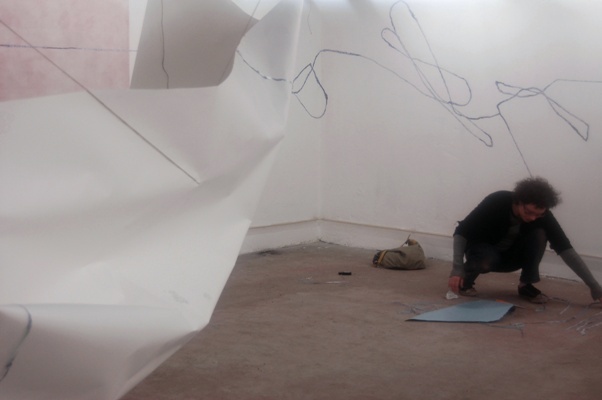 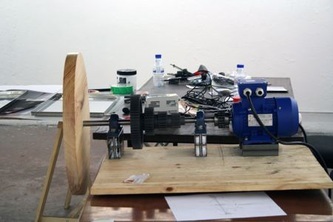 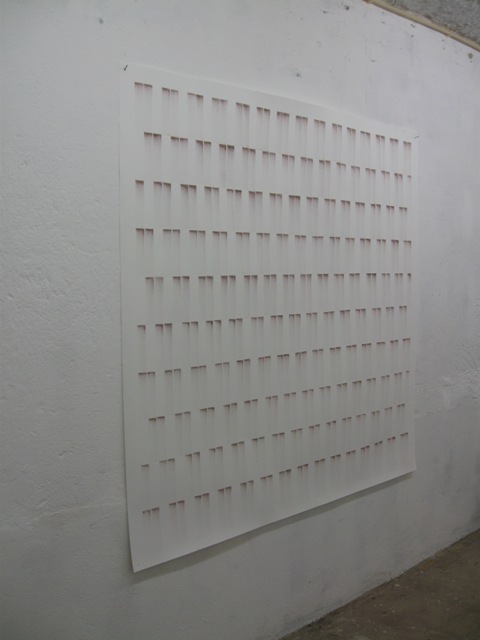 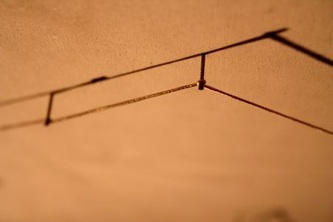 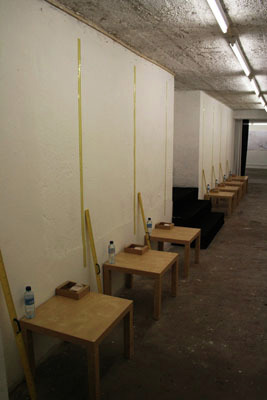 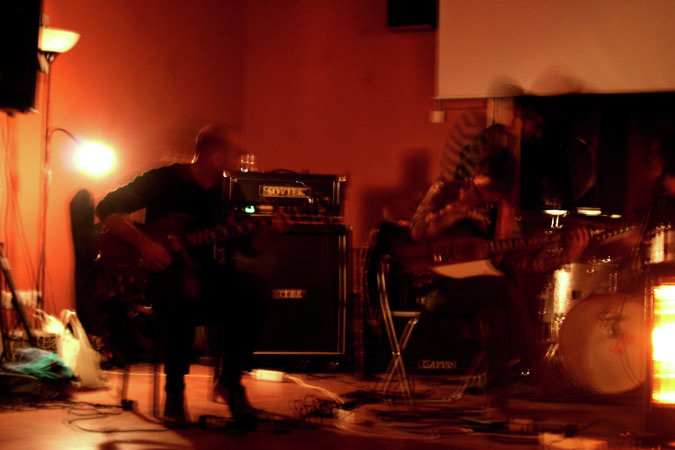 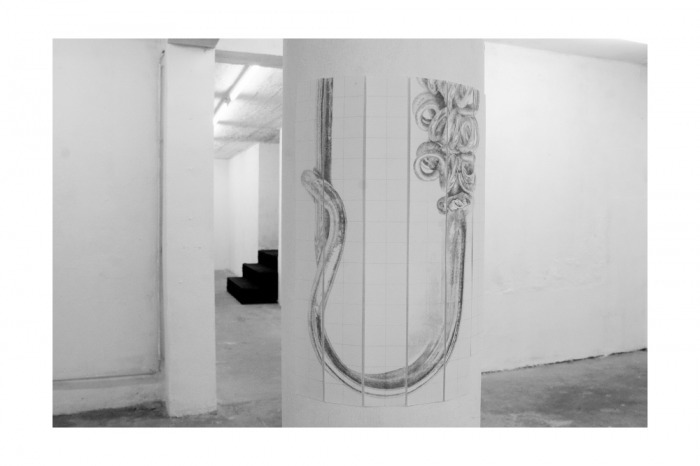 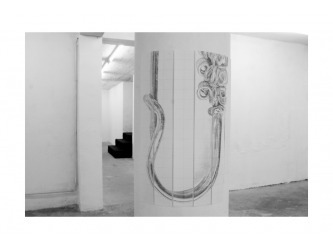 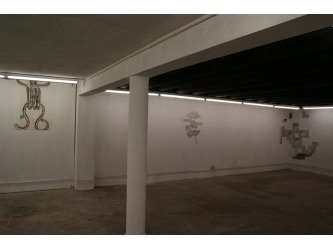 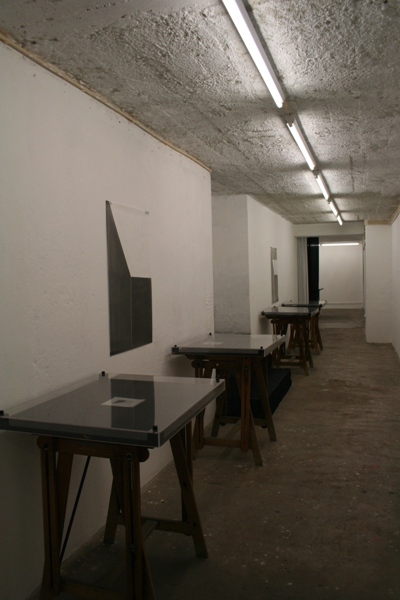 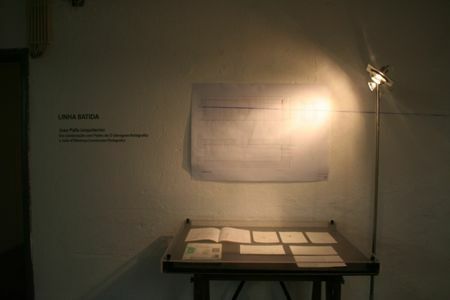 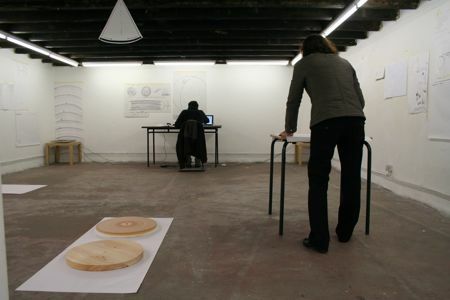 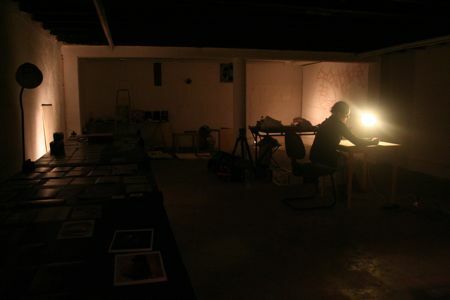 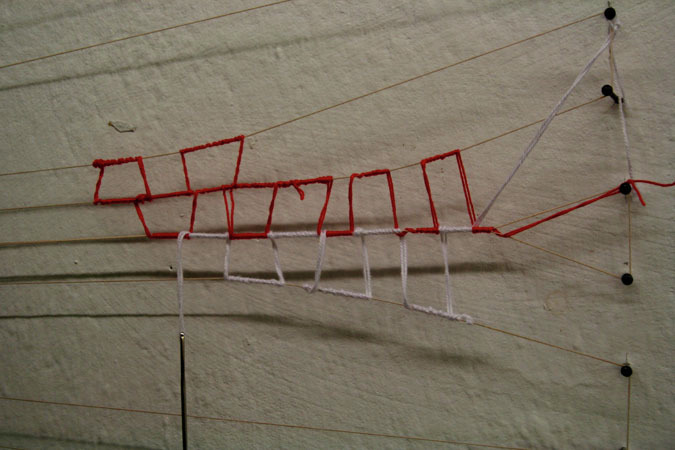 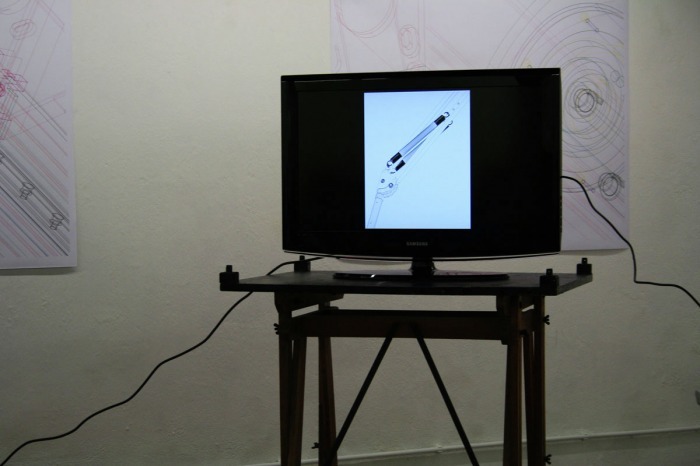 ISO2768-mH – was a project by Nuno Pedrosa that took place between the 14th and the 31st of October at Drawing Spaces. 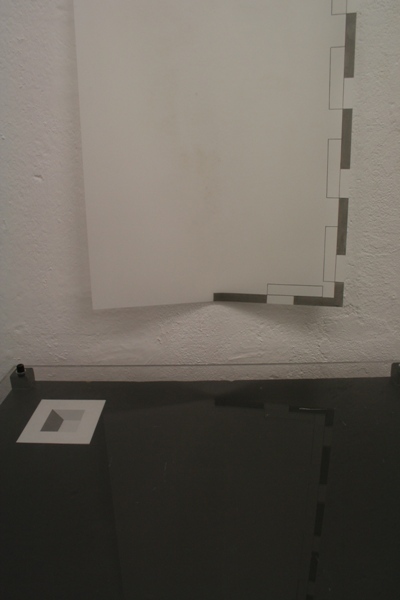 ISO2768-mH drawings, could be seen as a mise en abyme implement of sorts, only that the mirroring brings about variation instead of infinite, flawless replication. Beyond that, the true action takes place where the enforcement of constraint meets with the imponderable forces of the natural gesture. 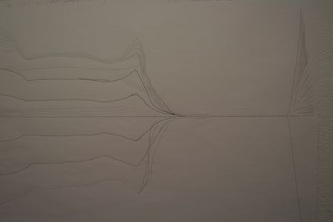 This same measuring of forces could be found at work in the one and only collection of drawings that were produced on location during residency, the somewhat compulsive series that go by the name of “Parallelism”. 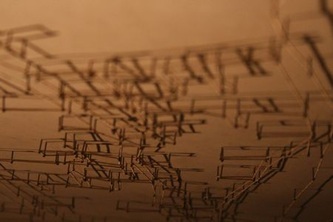 The script could not be more straightforward, a fixed but reasonable number of lines were drawn parallel to each other at regular spaces of one millimeter. 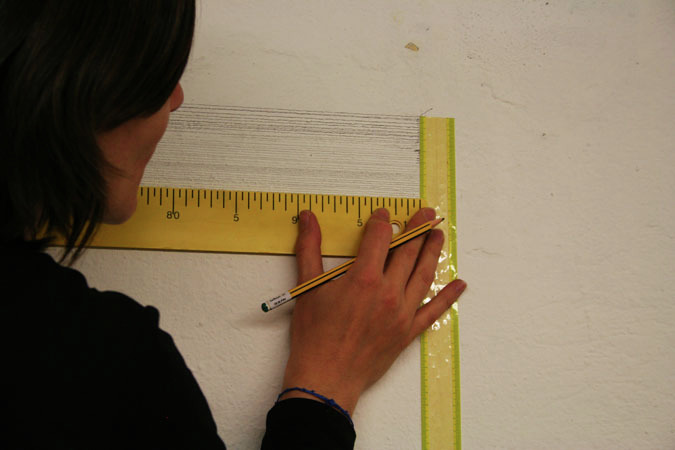 The exact same exercise was repeated four times in a row on different but similar surfaces with the sole help of a ruler. 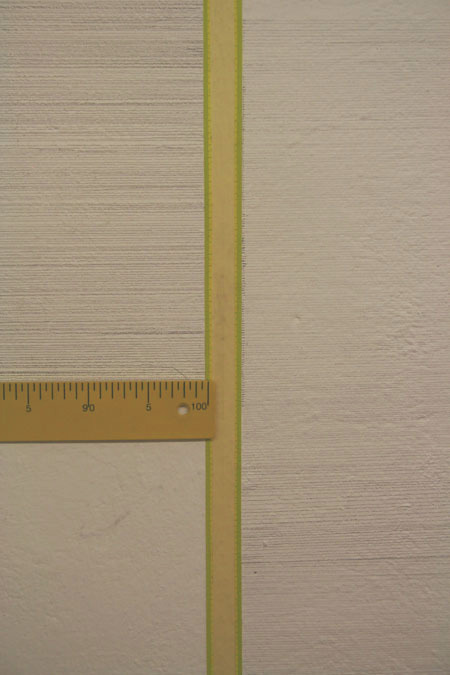 Where parallelism and linear accuracy are concerned, the nominal values encoded by international standard ISO2768 provide for aspects such as fatigue and disruption. What was once an unhindered gesture was then a measurable event, where even the unavoidable element of irregularity was kept under manageable margins of error. That is as much as one was allowed to expand oneself then, a fraction of a millimeter to both sides of the absolute zero of expression. 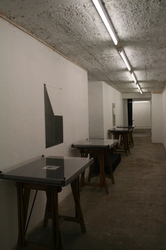 The public was invited to visit the space and followed the developmental stages of artist residence and of the Parallelism project, witch happened on the 16th of October, from 9pm to 11pm, with the collaboration of Carlos Farinha, Fabrice Ziegler, Maria João Santos, Patricia Pedrosa, Sofia Castelo e Teresa Carneiro. 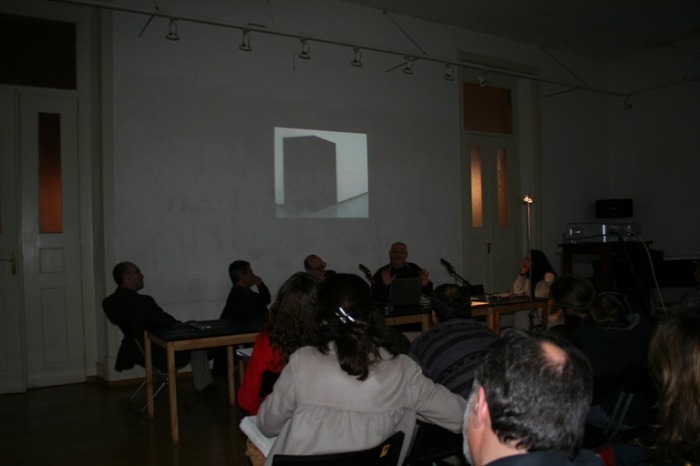 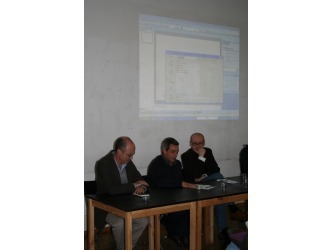 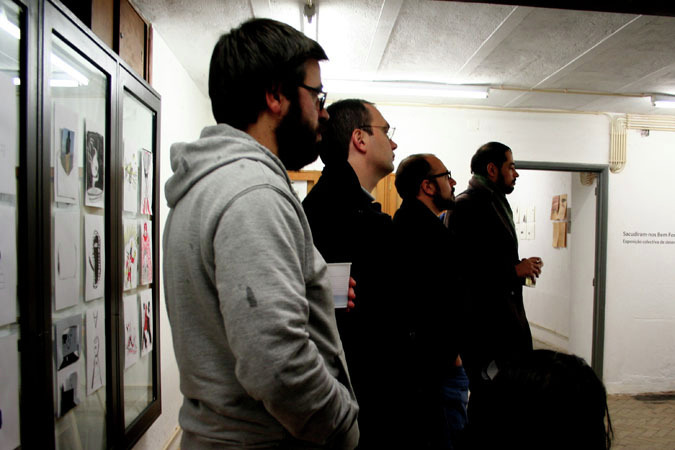 The Project Presentation/Formal Opening was on the 24th of October, at 7 pm, with Victor Moura and Nuno Nabais. 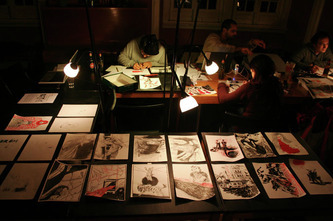 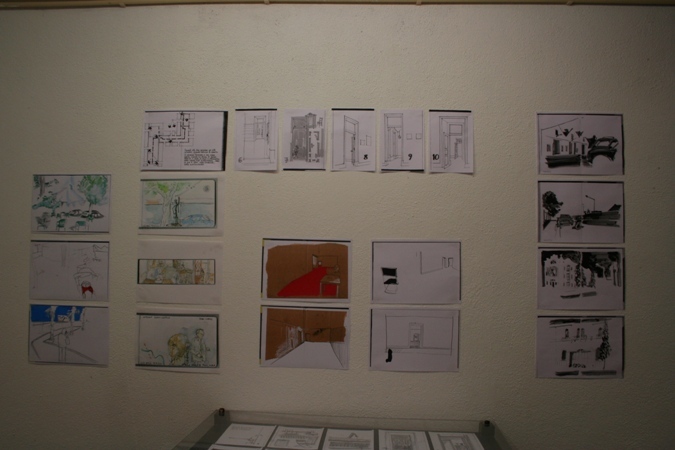 Drawings dictated in the dark and other works was a project by Carlos Nogueira, that took place between the 16th of September and the 3rd of October at Drawing Spaces. 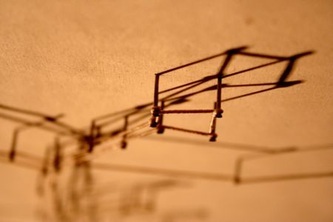 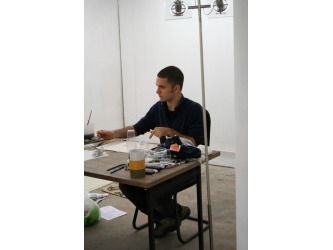 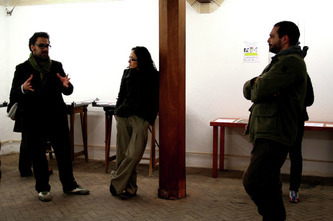 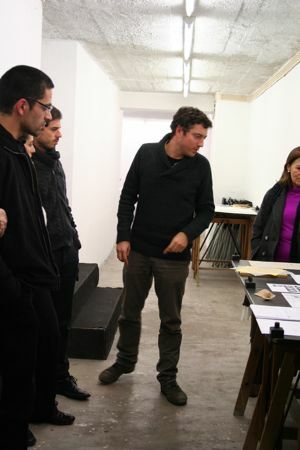 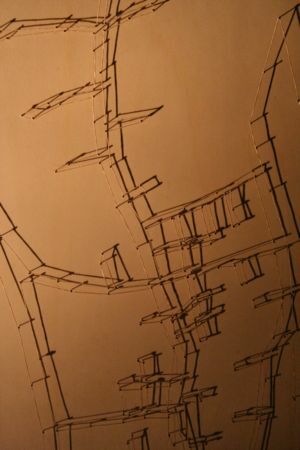 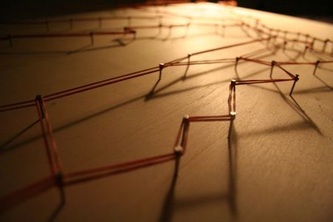 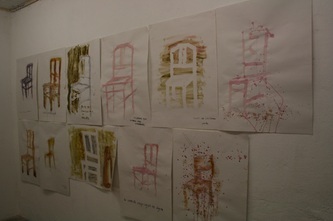 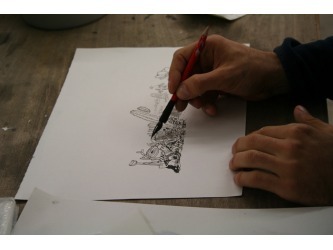 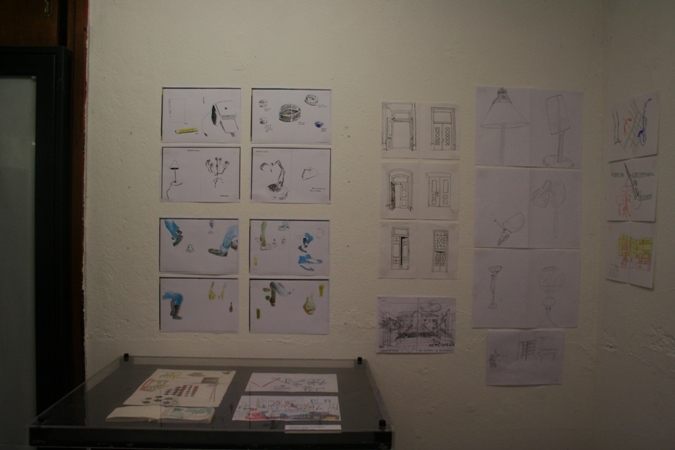 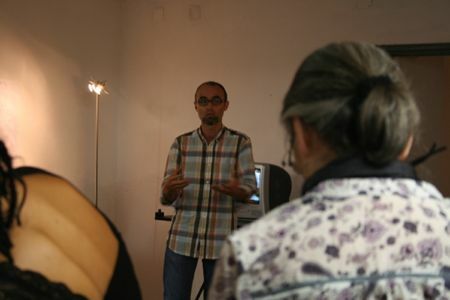 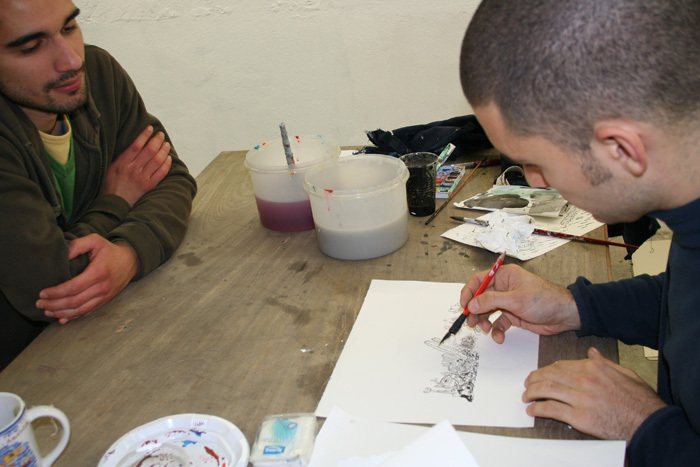 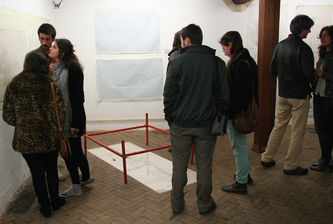 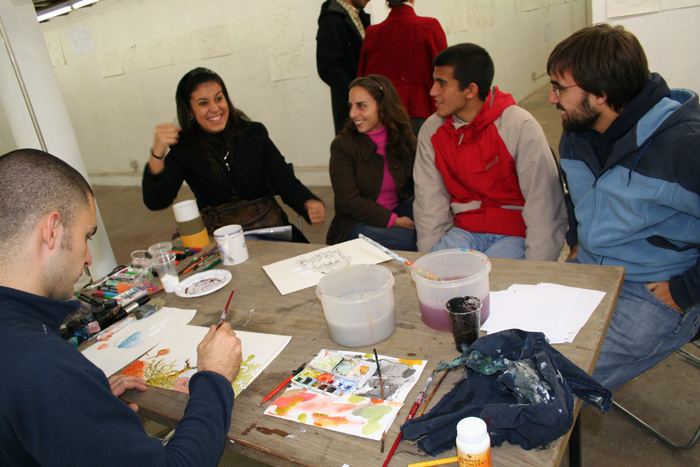 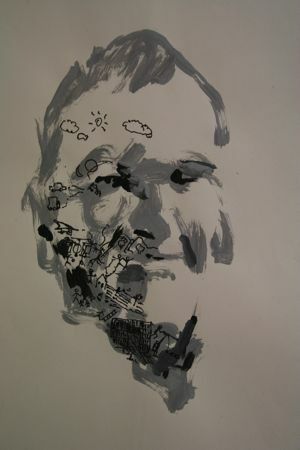 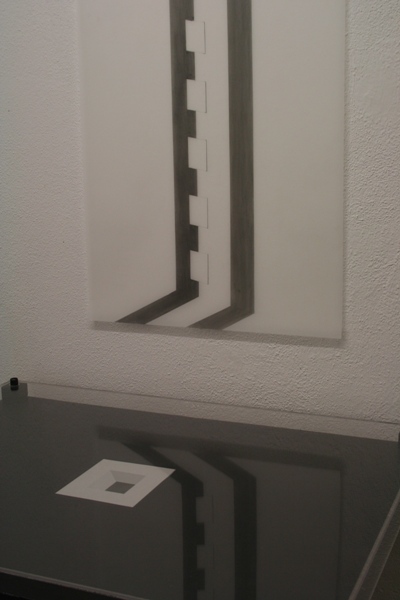 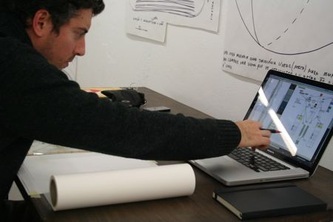 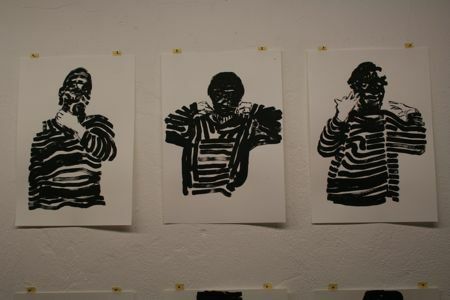 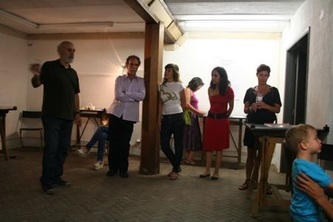 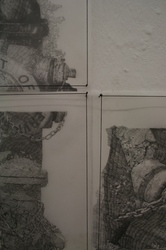 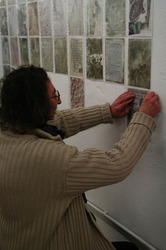 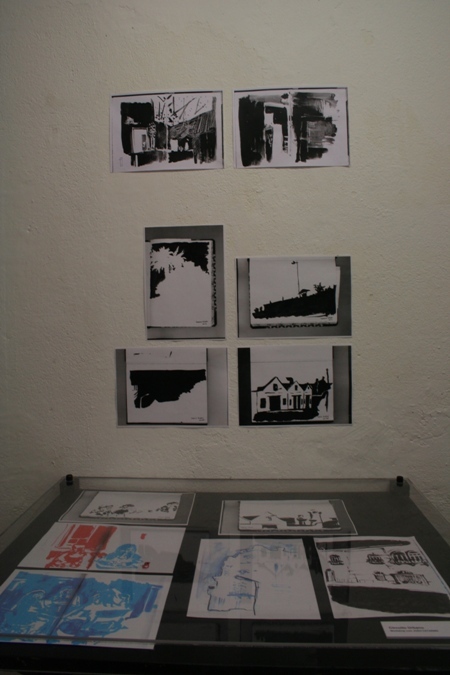 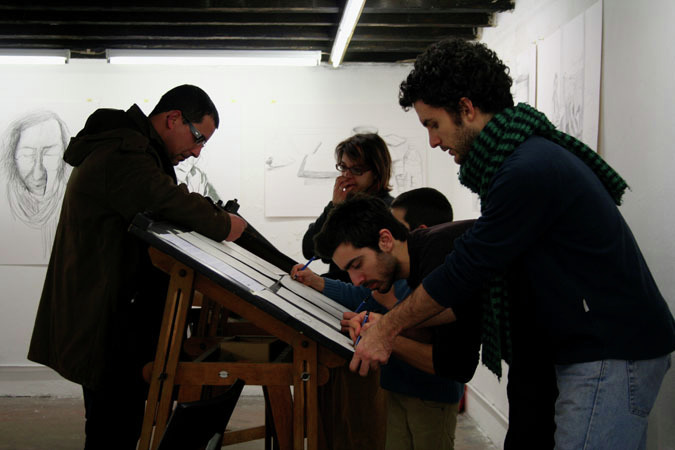 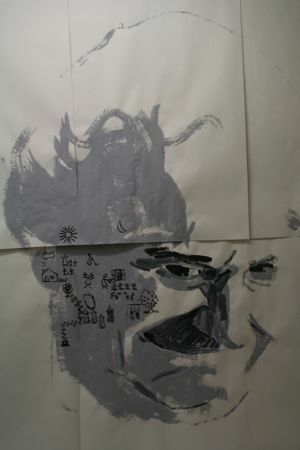 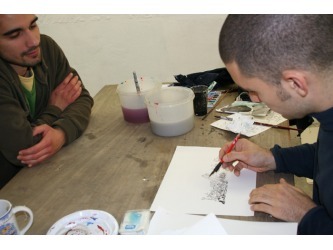 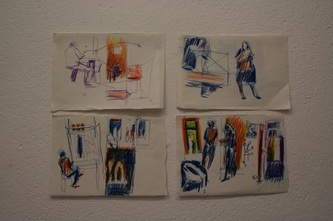 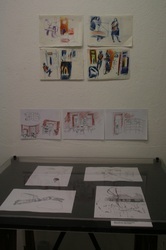 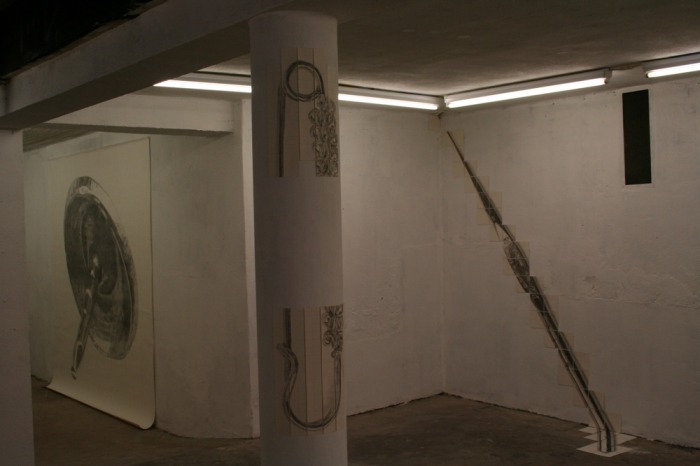 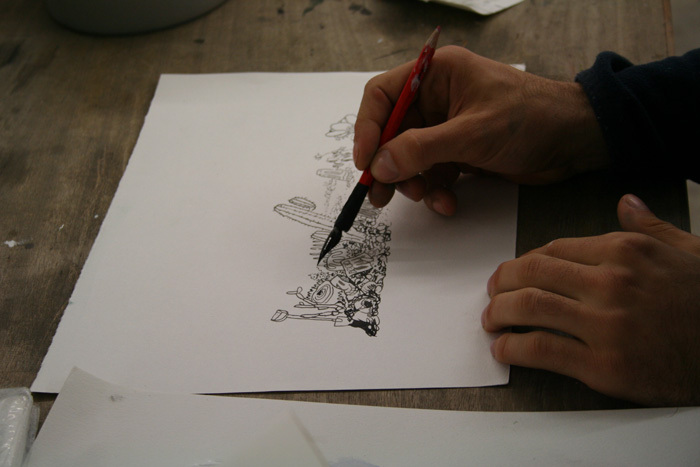 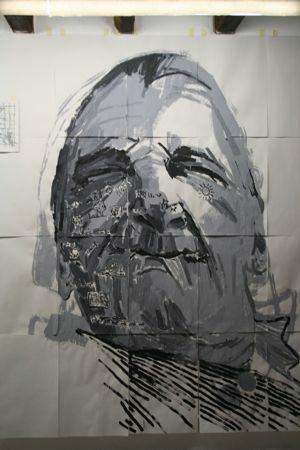 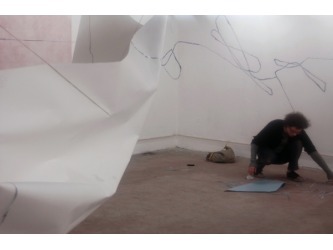 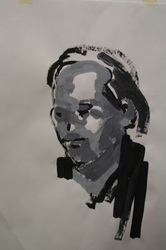 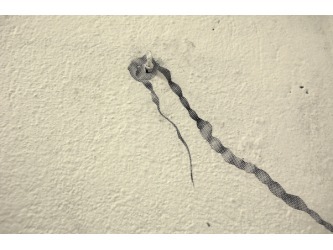 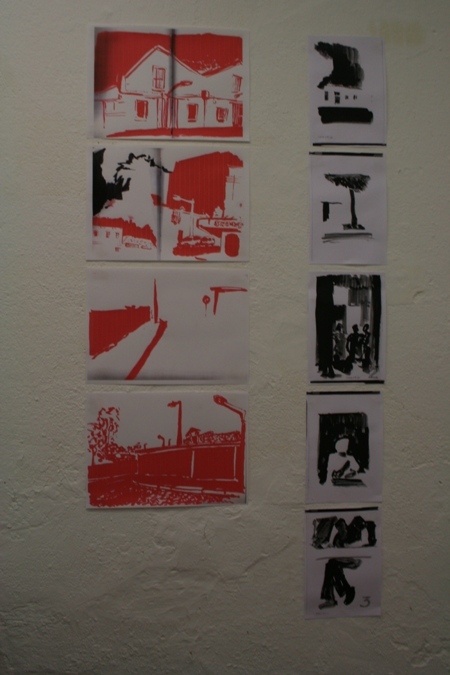 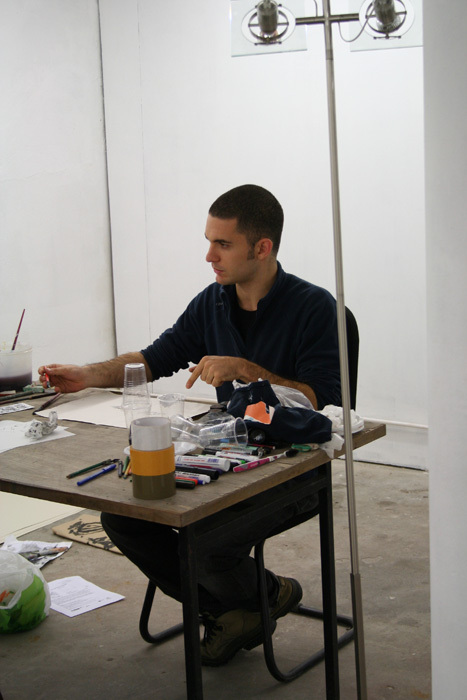 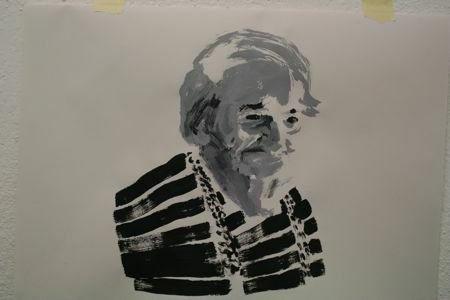 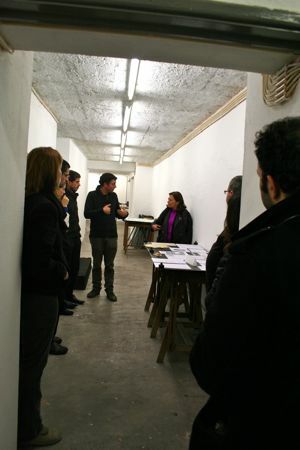 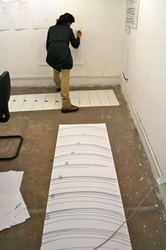 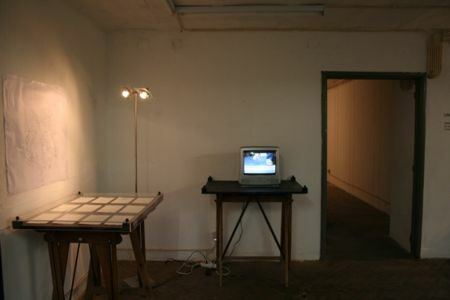 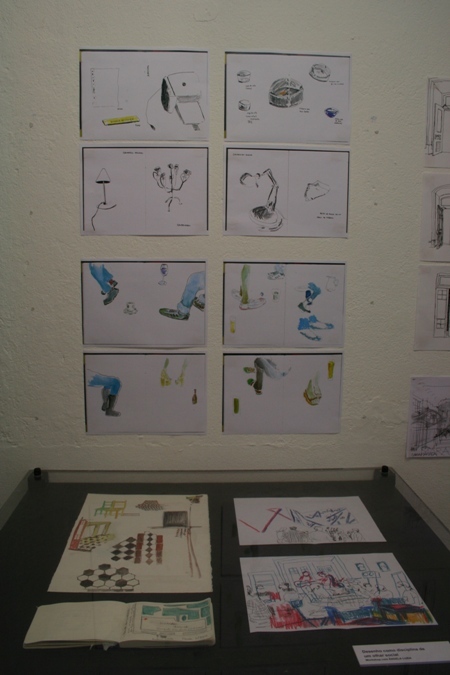 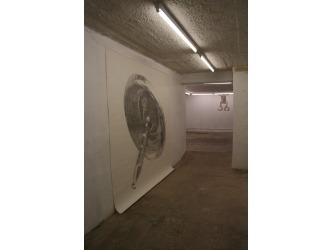 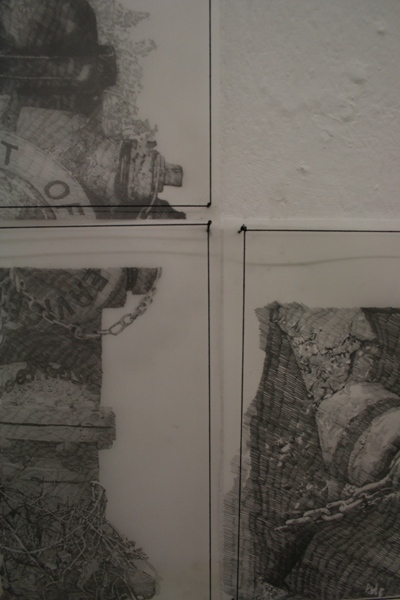 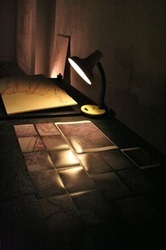 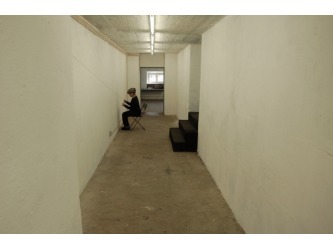 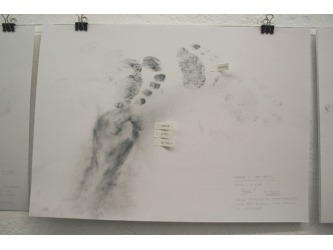 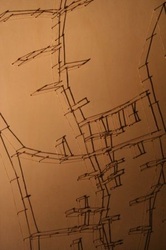 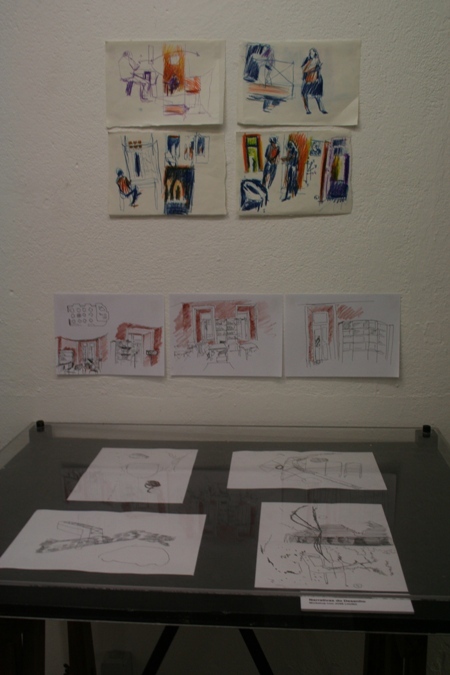 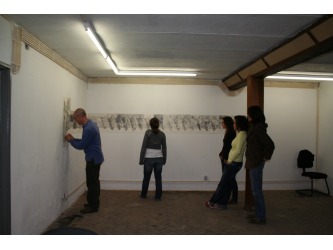 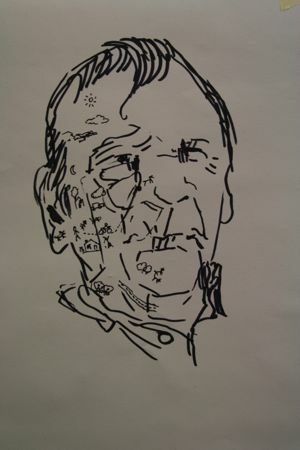 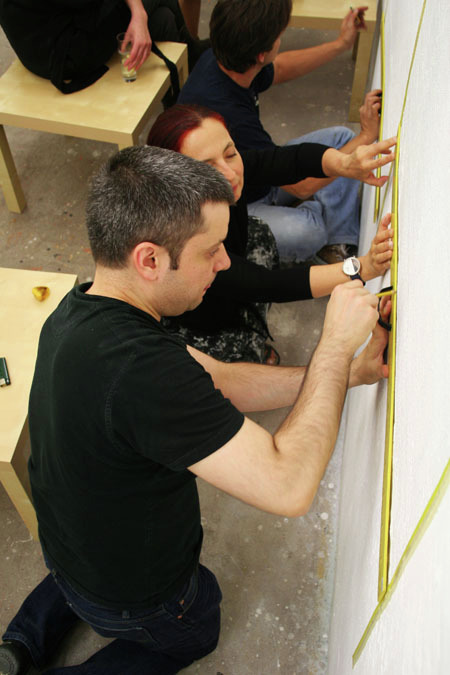 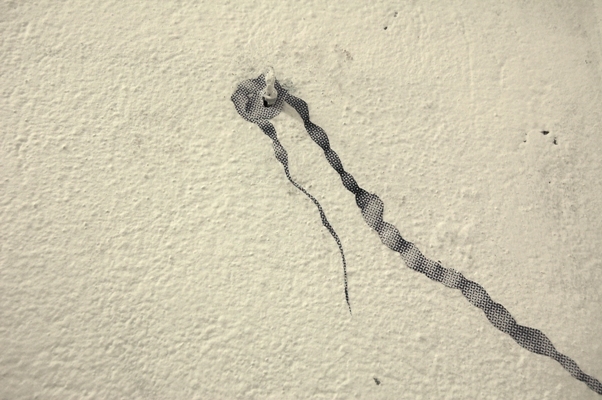 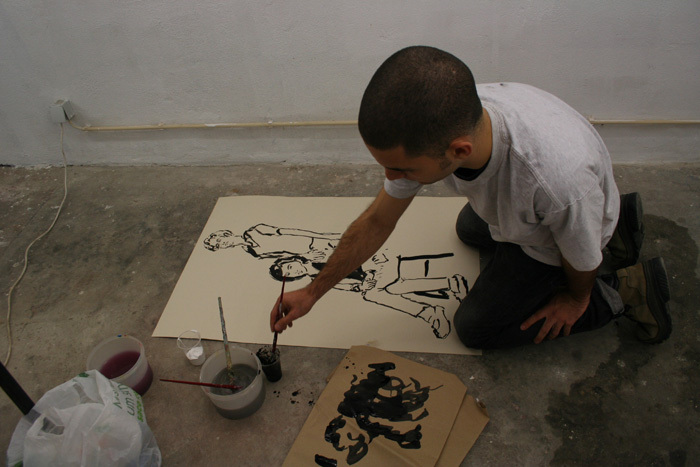 During the exhibition, Carlos Nogueira, had been working in open residence, with the facilitators, at Drawing Spaces. 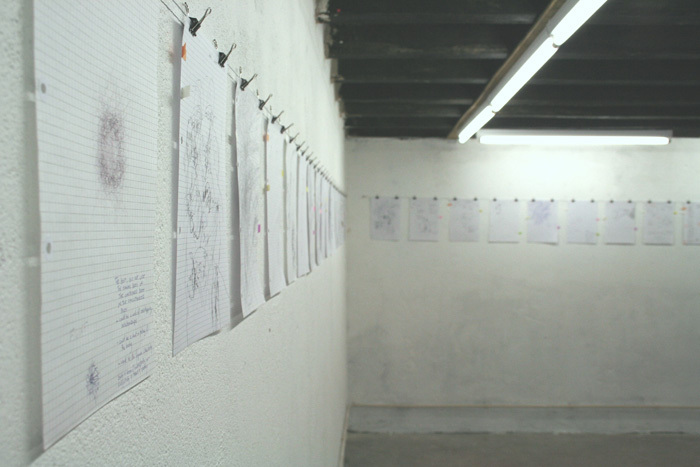 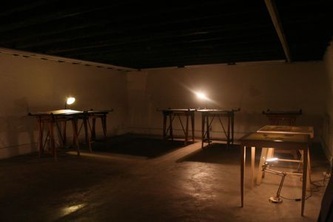 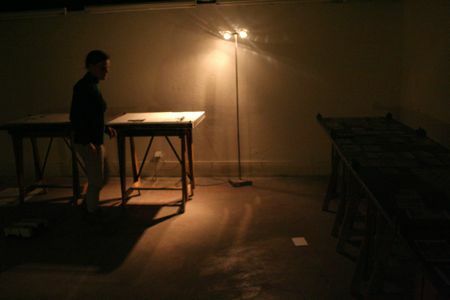 On the 16th and the 23rd of September, from 7pm to 11pm, Carlos Nogueira dictated a series of instructions to a group of participants that served as coordinates for the ‘blind’ drawings which were executed in room totally isolated from any kind of light. 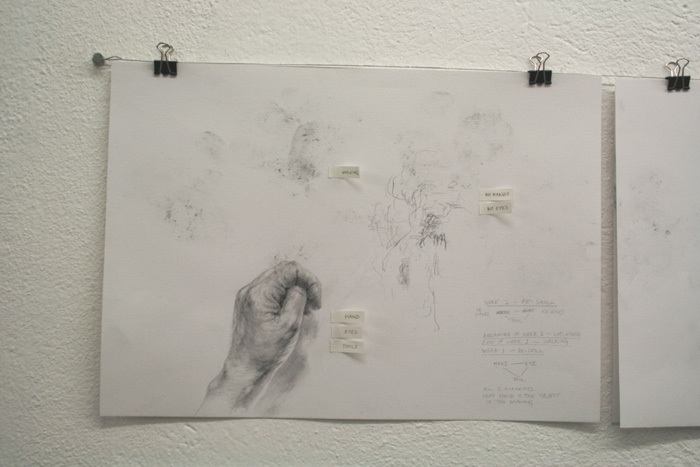 The drawing process was then more immediately tactile, as the hand, or better, the fingers, were guided to opened themselves to the pre-form, simultaneously feeling it, forming it, and ‘seeing’ what they were forming through touch. On the 26th of September, Teresa Carneiro and Carlos Nogueira delivered a presentation/discussion on this project, contextualizing it along with older works that were also exhibited for the first time during this event. 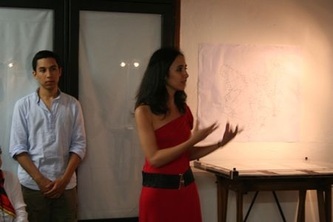 This presentation was followed by the formal opening of event. 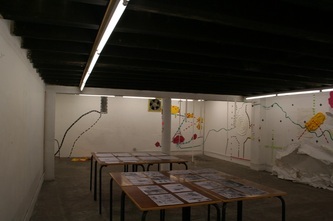 Temporary Response Unit was a project by Christine Mackey, that took place between the 2nd and the 31st of July at Drawing Spaces. 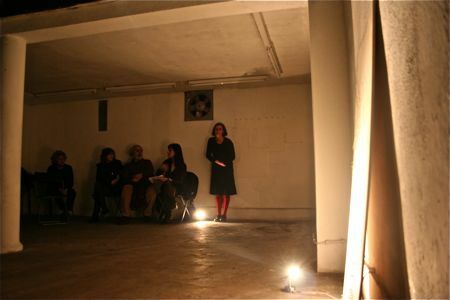 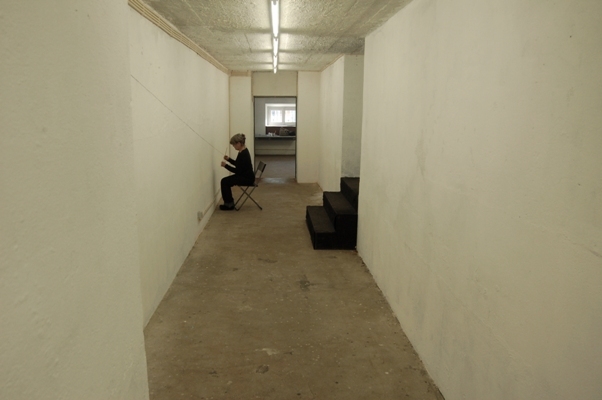 The Project had functioned as a durational archive for observational research and offered the opportunity for public participation both in the gallery and on location. 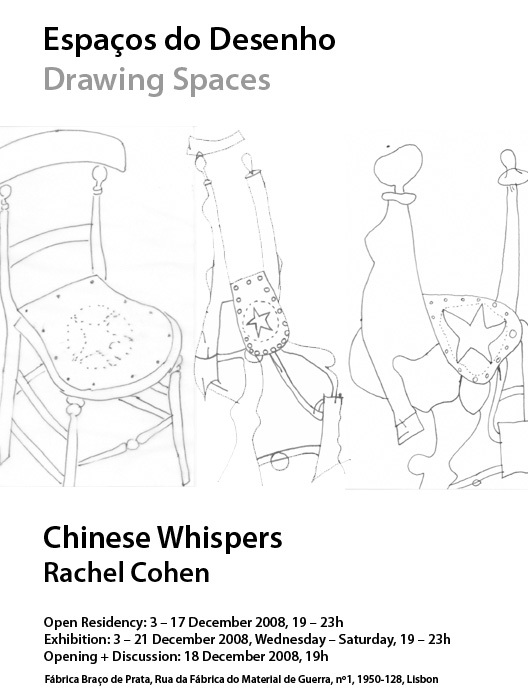 This project orientated a playful approach and invitation to how we saw and experience the world around us on a micro and social level through drawing. Building on existing elements constructed elsewhere that evolve and re-act to particular environments, for example; ‘Intimate Formations’ existed as a free hanging sculpture that was continually being expanded and altered whenever a new situation was presented, exploring in minute detail the morphology of plants. The work was initially inspired by John Millar’s essay on ‘Drawings That Question Diagrams’ a procedural process that involves the selection of a diagram which is copied by hand “over and over” again, compiled and presented as a book (infinitus). 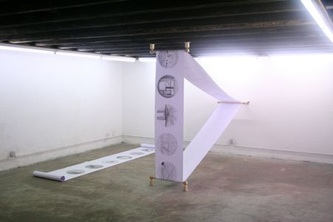 These hanging ‘samples’ expanded the parameters of the subject matter into typographic minutiae of biological forms that created a space for visual intimacy experienced by the viewer. 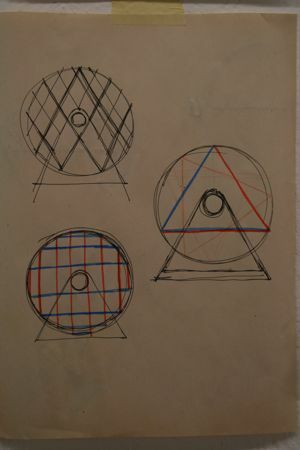 In 1913 Marcel Duchamp conceptualized chance and indeterminacy challenging traditional methodologies in developing art-works. 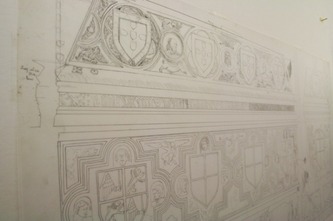 ‘The Idea of the Fabrication’ outlined a way to make drawings that could be followed by the novice or the professional. 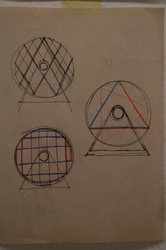 Included in this exhibition were a set of instructions informed by Duchamp. 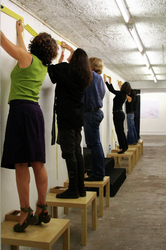 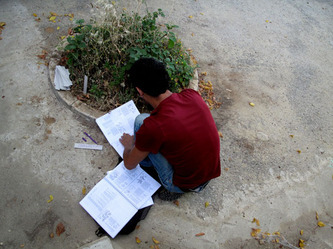 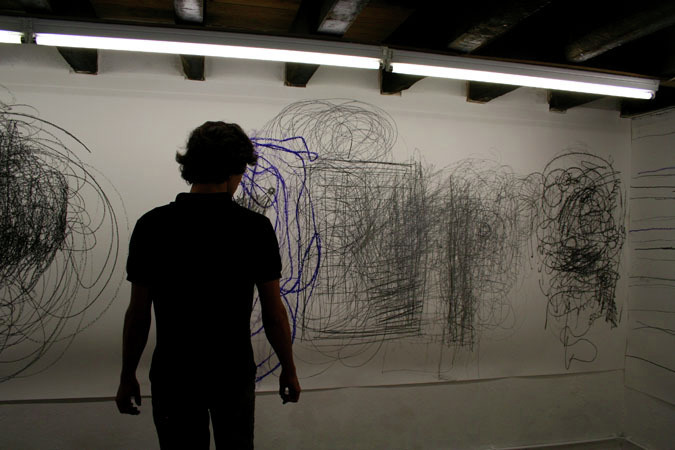 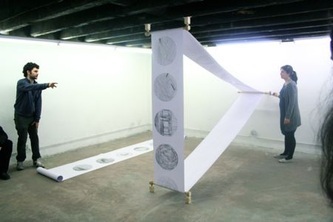 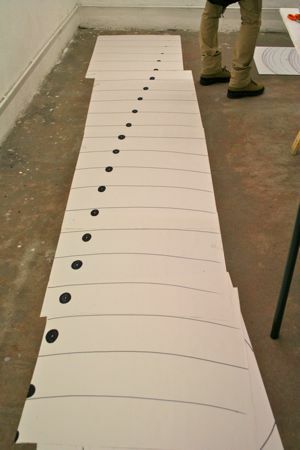 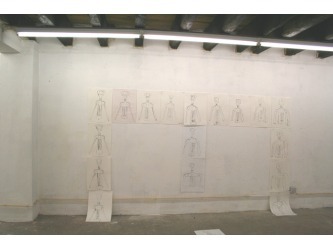 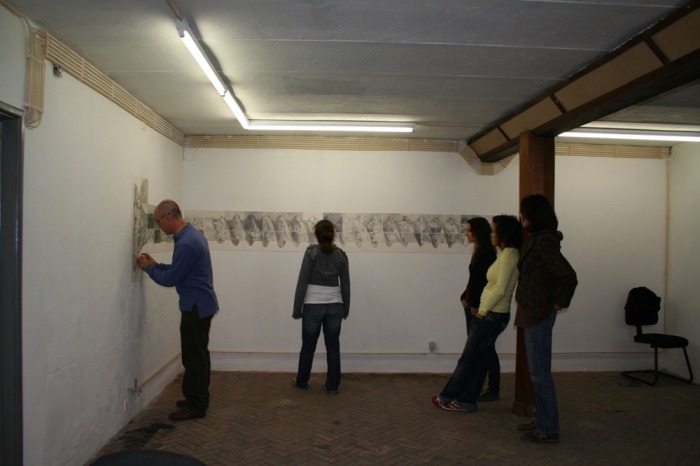 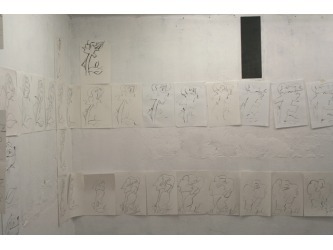 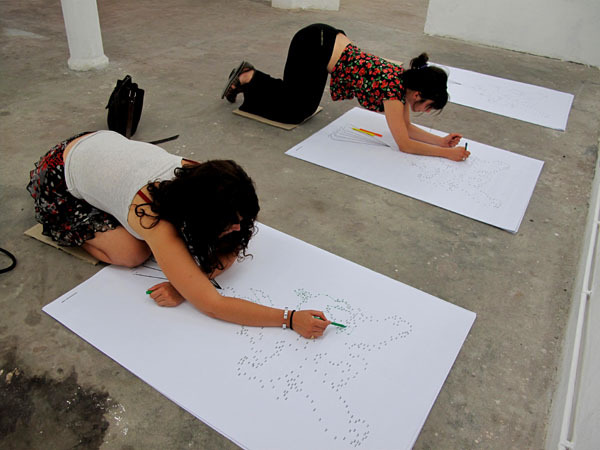 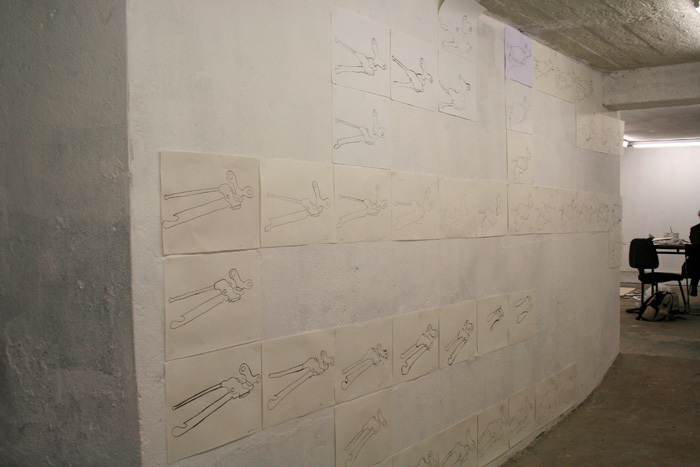 The participant could attend and adapt this method for making drawings, which was hung as a public installation during the residency. 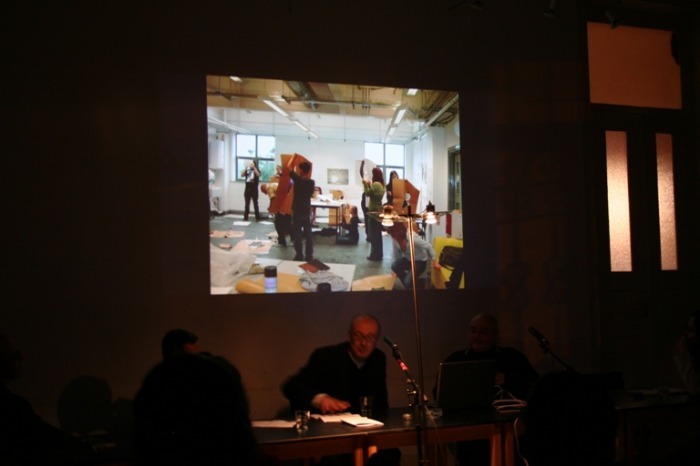 This event tried to locate drawing between art, its participants and discourse as a collective cultural process. The final work for Drawing Spaces was a site-specific using a combination of digital drawing and sound tools that notates and responds to the city on foot projected as a transitory animated composition - between walking and drawing, drawing and listening, thinking and doing. 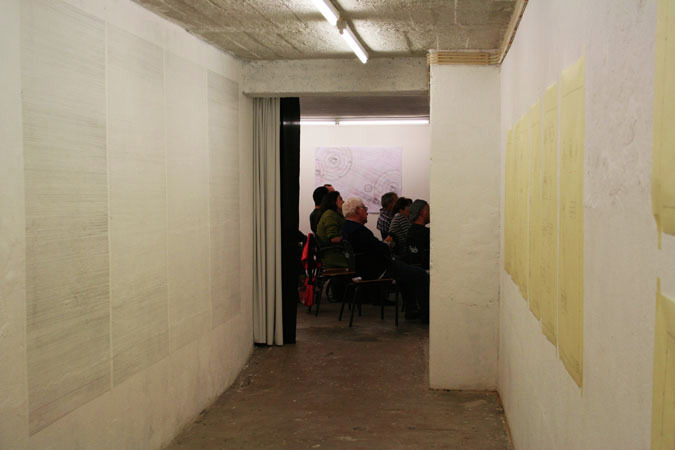 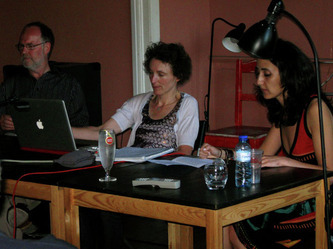 On the 17th of July, 7 pm, Christine Mackey, Steve Garner e Teresa Carneiro delivered a presentation of the resident project on Visconti Room, Fábrica Braço de Prata - Drawing: Towards a community of research and practice, 9th Drawing Lesson. 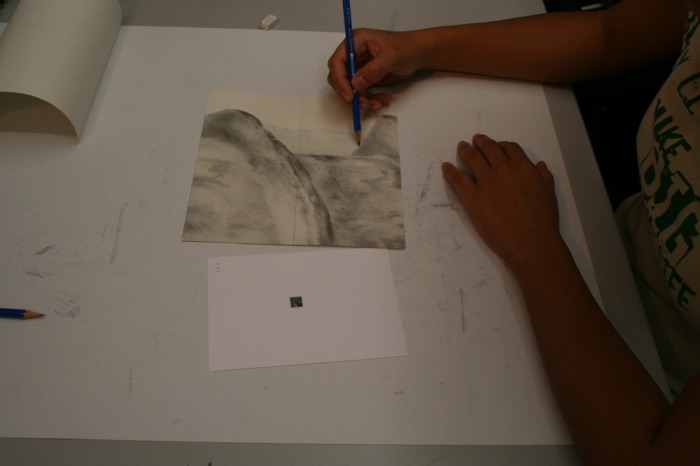 Lucy's understanding of drawing centres, is from the viewpoint that the activity of drawing leads to understanding whilst remaining respectful of the subject being observed. 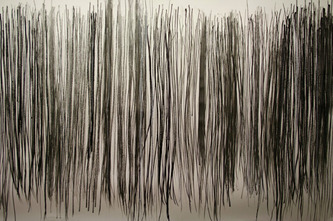 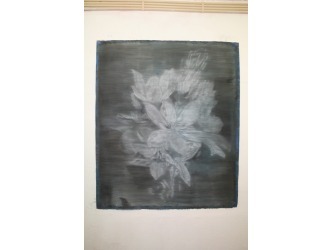 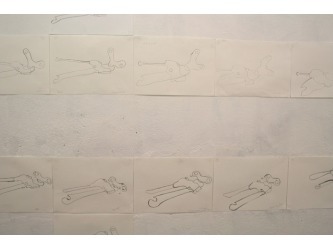 For her, drawing is not mere documentation but is mainly about participation. 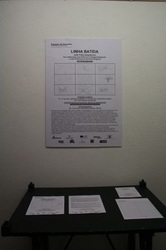 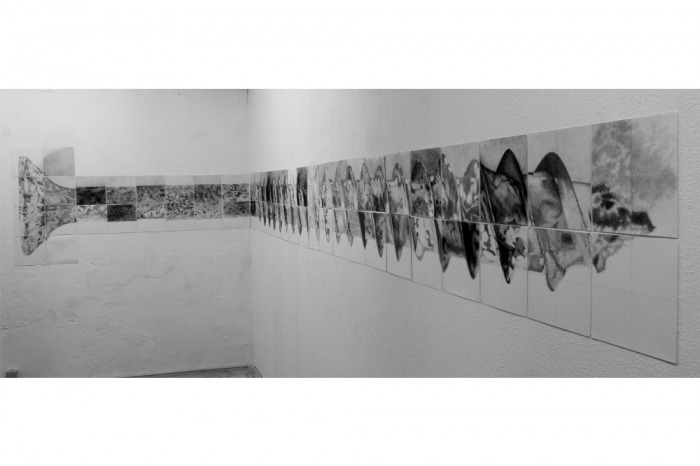 Part of her exhibition at Drawing Spaces in Fabrica Braço de Prata included a selection of her research from her PhD - Delineating Disease. 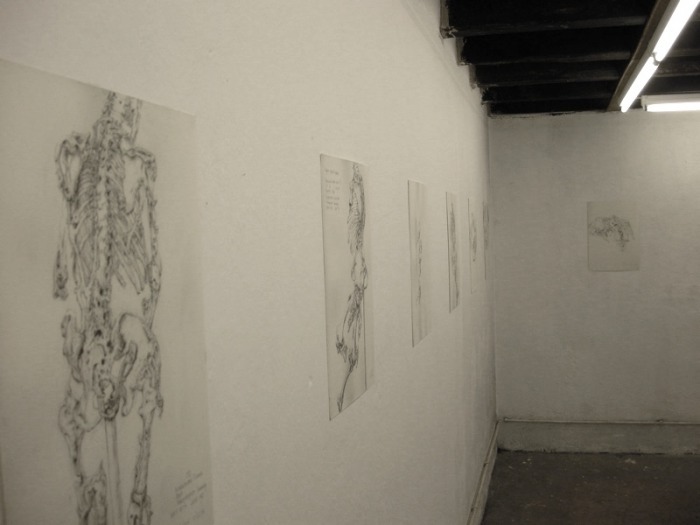 This body of work investigated encounters with a rare disease called FOP (Fibrodysplasia Ossificans Progressiva) and examined how drawing offered understanding and new insights to the artist and to medical experts. 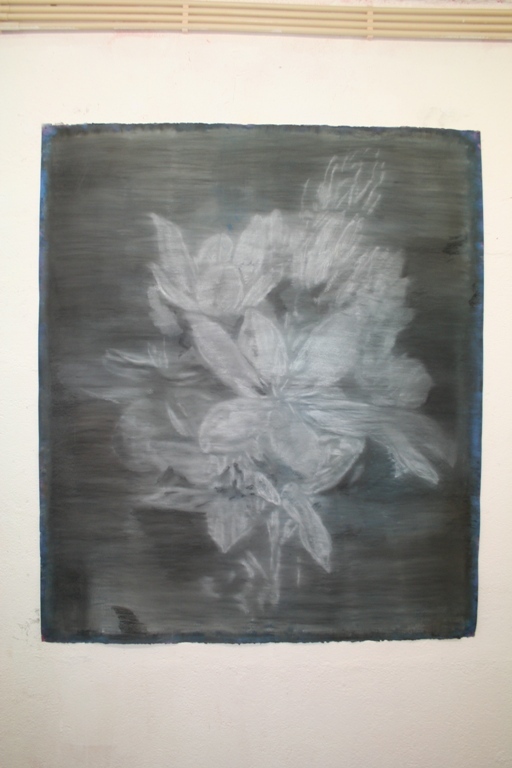 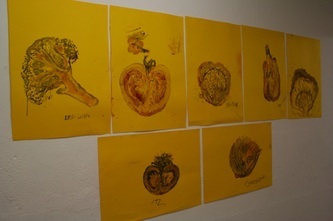 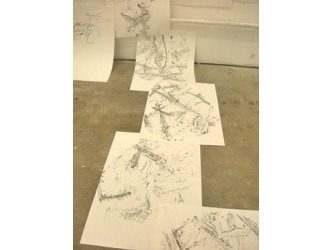 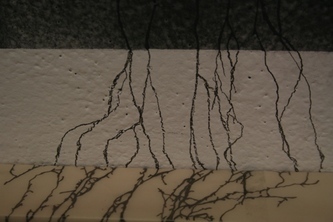 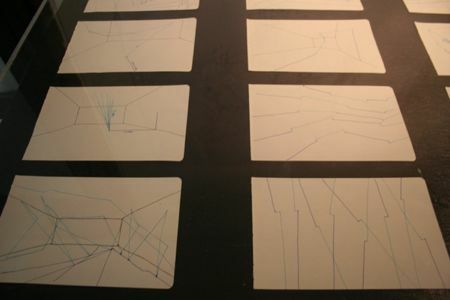 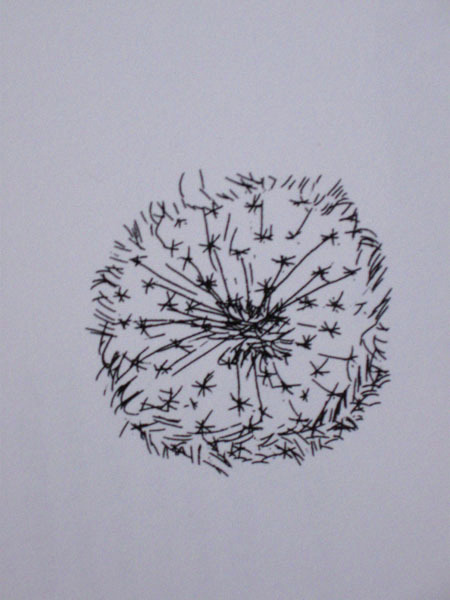 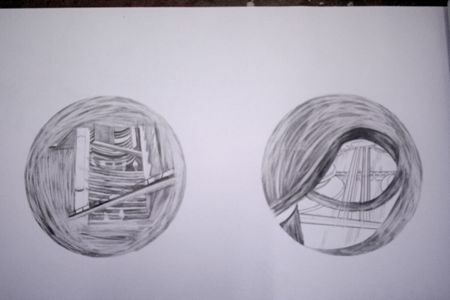 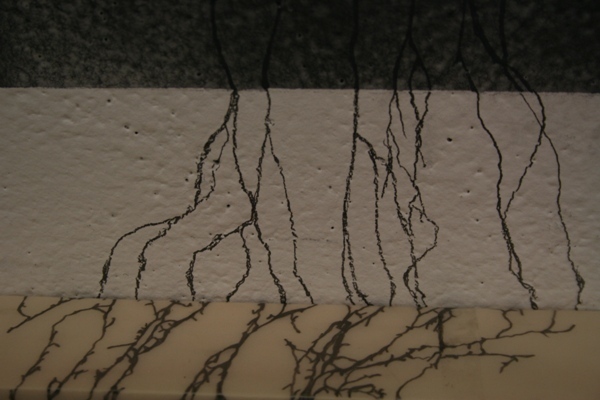 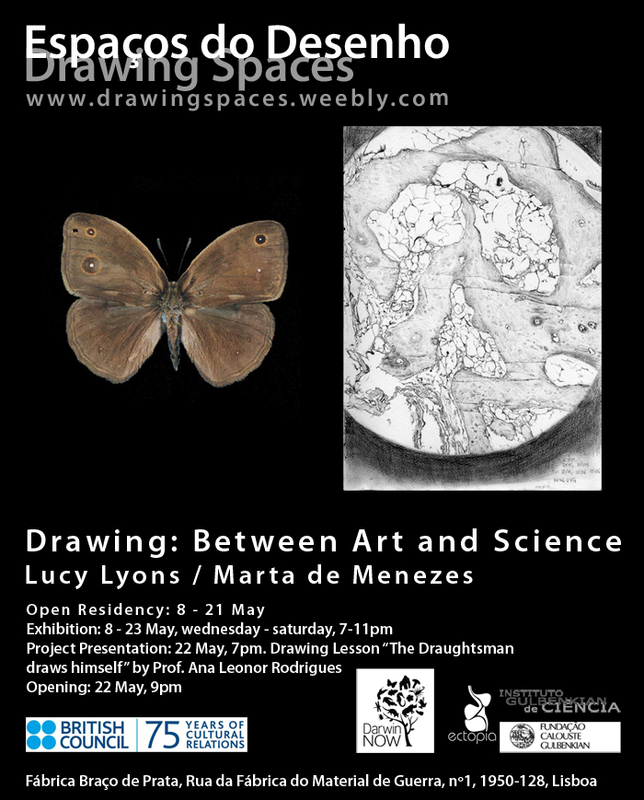 Other drawings in the exhibition were a combination of images made by Lucy demonstrating her use of drawing as a way to understand experiences and phenomena she encountered, and images made by scientists working at IGC. 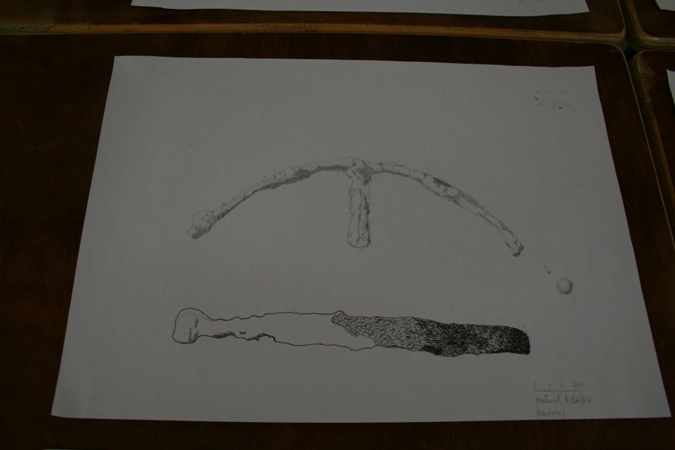 They found that by drawing with Lucy, materials and protocols with which they were familiar, became re-seen and they gained new insight into their subjects, something they had not previously expected. 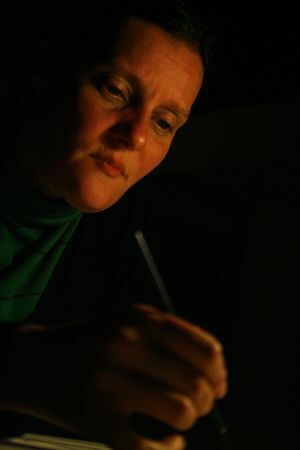 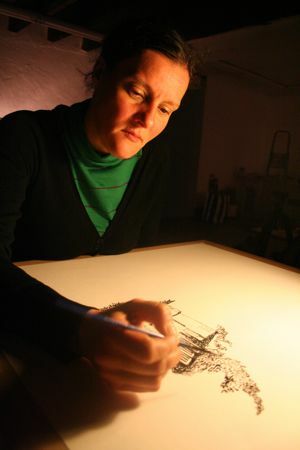 Lucy's work over the last ten years has been created in the lab or dissection room rather than in the traditional setting of the artists' studio. 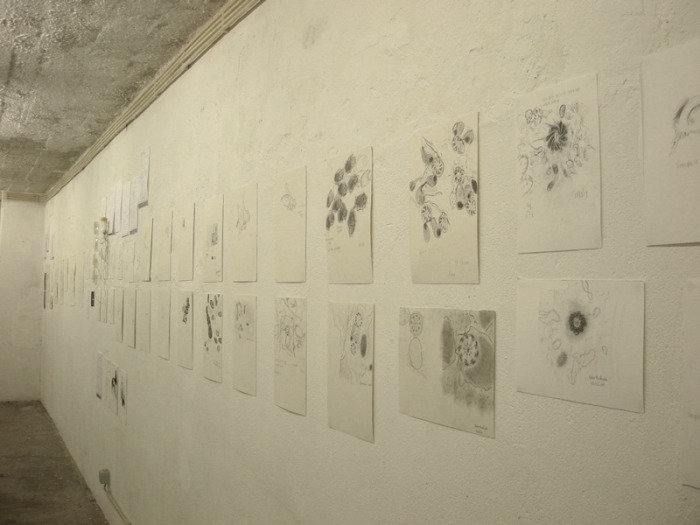 As a way of both bringing the lab into the gallery and demonstrating her theory on the role of drawing, Lucy allowed bacteria to grow on petri dishes left in the space. 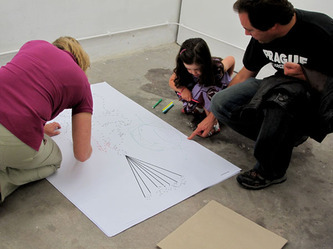 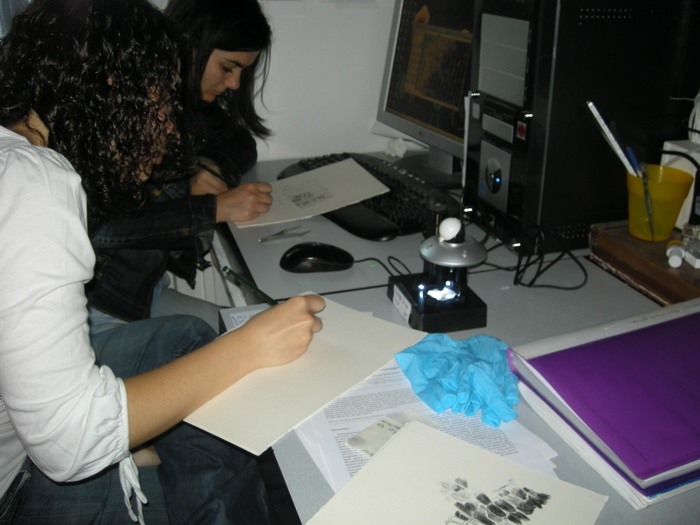 Using a microscope and drawing attachment, Lucy invited members of the public to come and draw the bacteria they saw when looking down the microscope. They engaged with something that would normally repel them and through the activity of drawing, they saw the beauty and detail in bacteria. 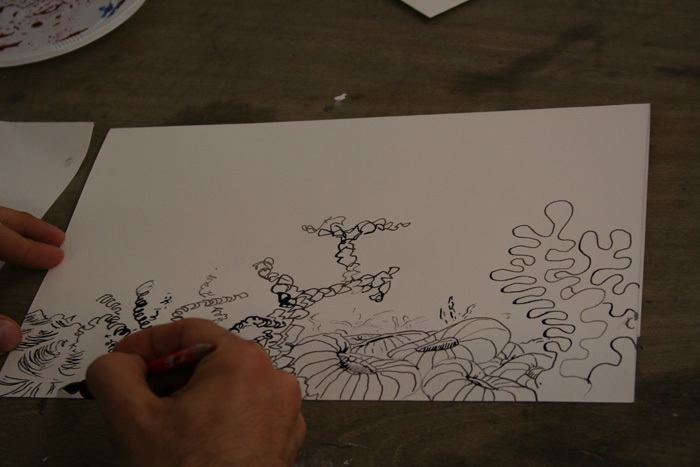 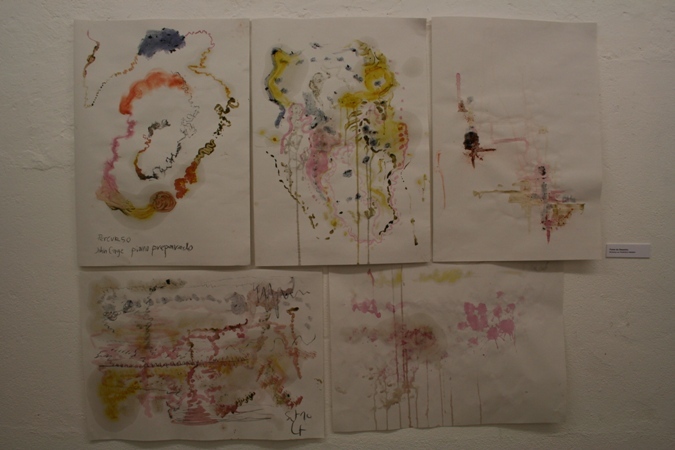 Joining together all the drawings made, the piece 'Bacteria Drawing' grew and developed collaboratively, paralleling the growth of the actual bacteria itself. 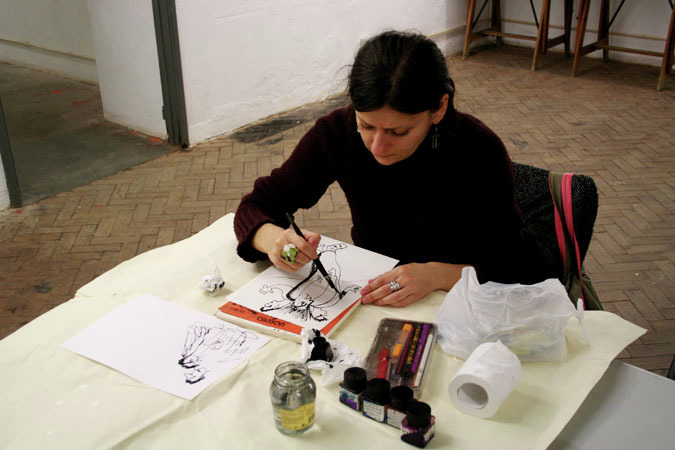 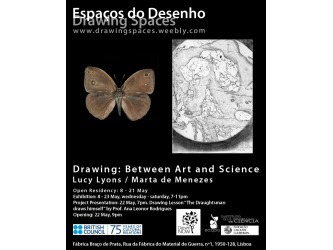 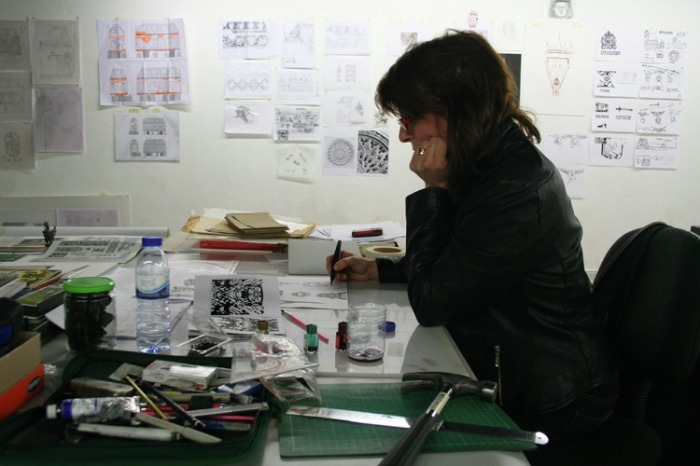 On the 22nd of May, at 7 pm, Lucy Lyons and Marta de Menezes delivered a presentation of the project ‘Drawing: Between Art and Science’ which was followed by a Drawing Lesson under the title ‘The Draughstman/ Woman draws him/herself’ presented by Professor Ana Leonor Madeira Rodrigues. 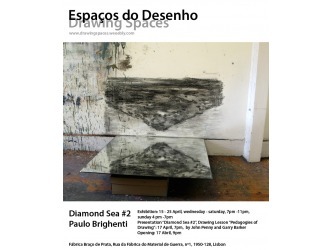 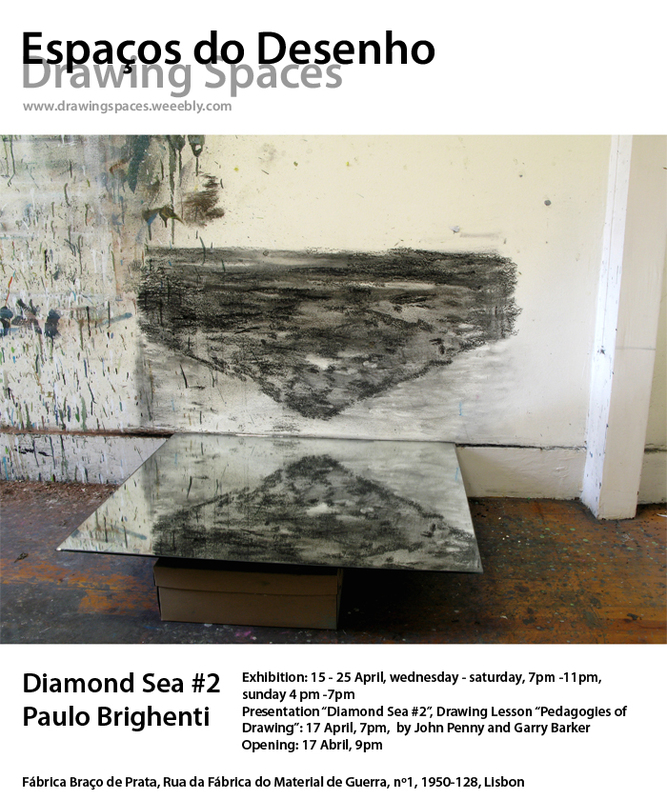 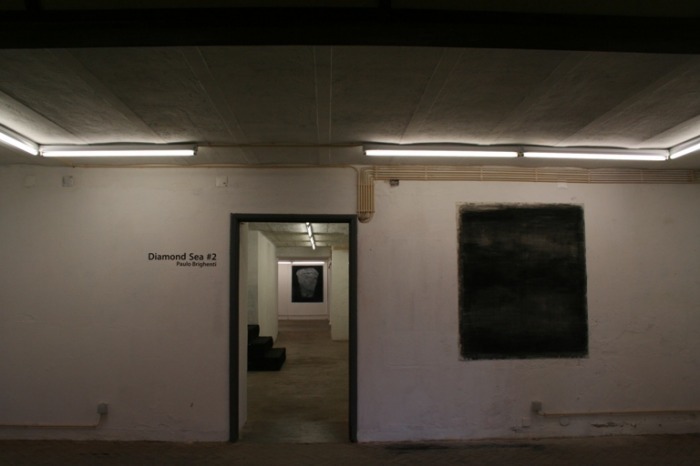 diamond sea #2 was a project by Paulo Brighenti, that took place between the 15th and the 25th of April at Drawing Spaces. 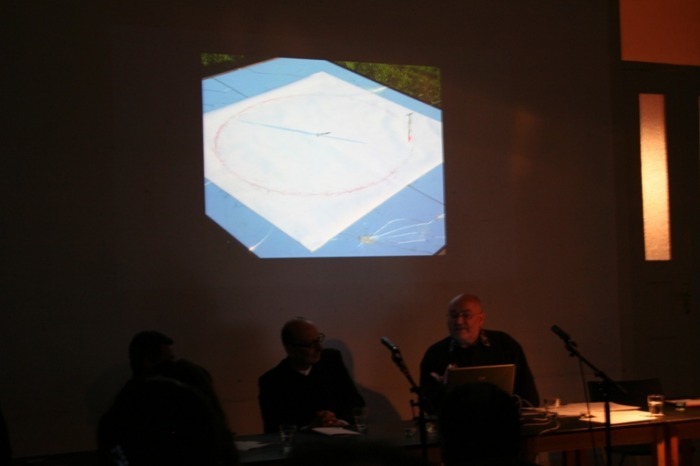 On the 17th of April, 7 pm, Paulo Brighenti delivered a presentation of his project which was followed by a Drawing Lesson on the ‘Pedagogies of Drawing’ with presentations by John Penny - Thoughts on drawing and the curriculum – and Garry Barker - Drawing and pedagogy. 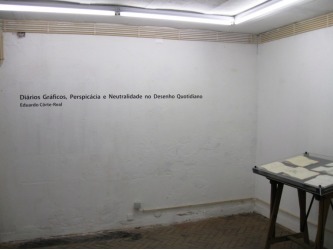 Graphic Diaries, Perspicacity and Neutrality in Daily Drawing was a project by Eduardo Côrte-Real, which took place between the 5th and the 22nd of March, at Drawing Spaces. 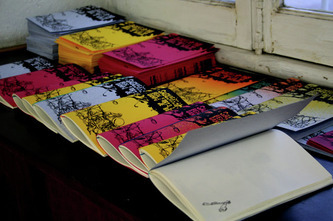 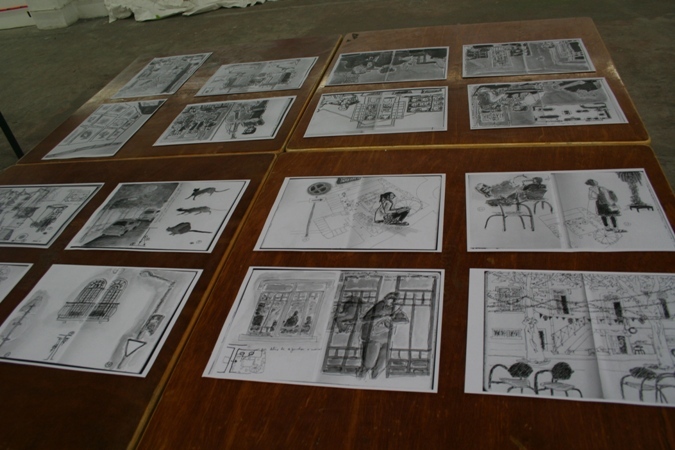 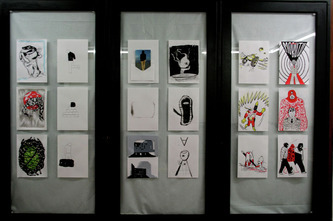 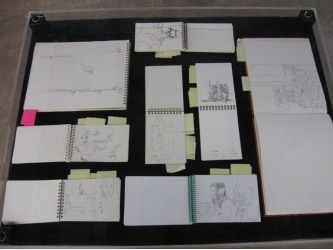 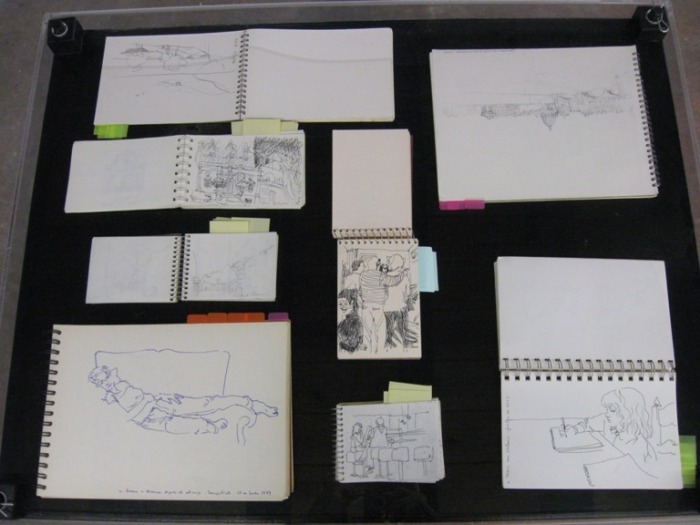 This project exhibited 86 Graphic Diaries which the author used for a decade to develop daily drawings. 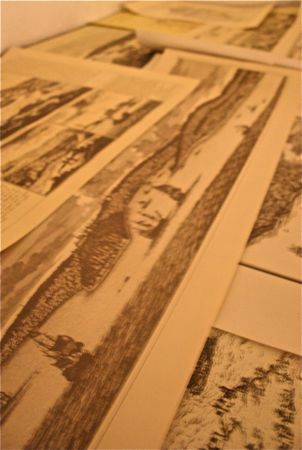 Each day a different selection of drawings was displayed, which provided the public with the opportunity to see more than one thousand observation drawings. 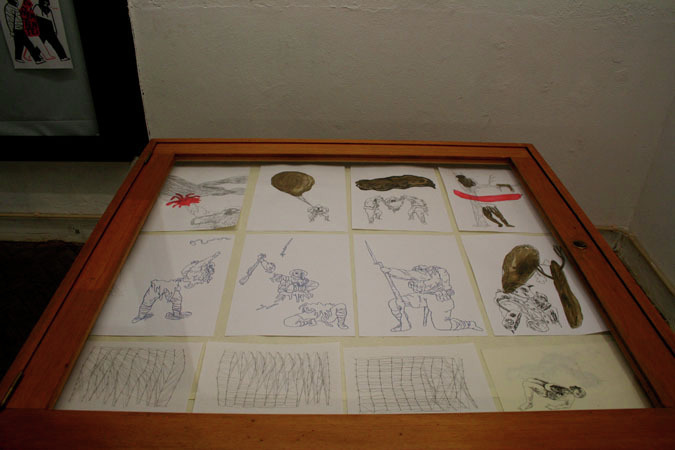 On the 5th of March, at 7 pm the author delivered a presentation of this project which was followed by a Drawing Lesson by Jill Gibbon with the title Unofficial War Art. 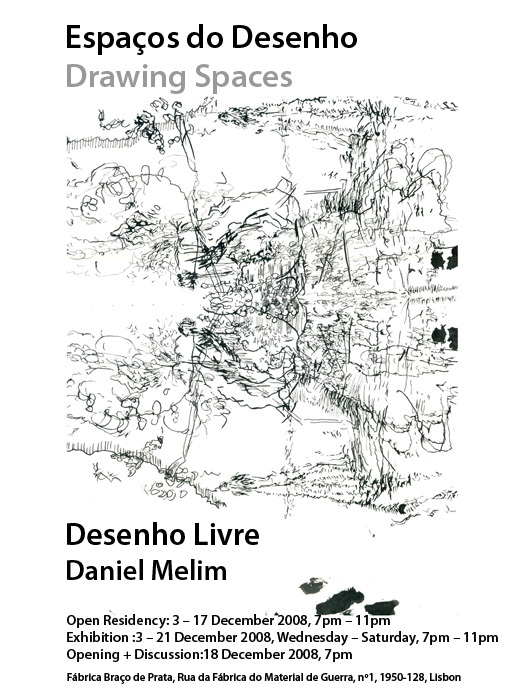 On the opening day the book The Smooth Guide to Travel Drawing, Um Suave Guia para o Desenho em Viagem, about the works of Eduardo Côrte-Real, was launched and this was organized and sponsored by UNIDCOM/IADE in partnership with Livros Horizonte. 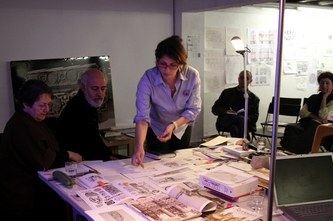 On this occasion Clive Dilnot (Parsons New School for Design, New York) delivered a short presentation of his text Why do we Draw? 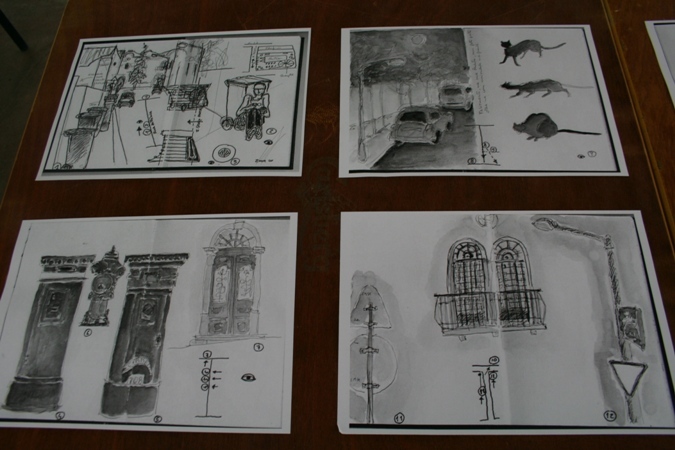 which was published on the book The Smooth Guide to Travel Drawing, Um Suave Guia para o Desenho em Viagem. 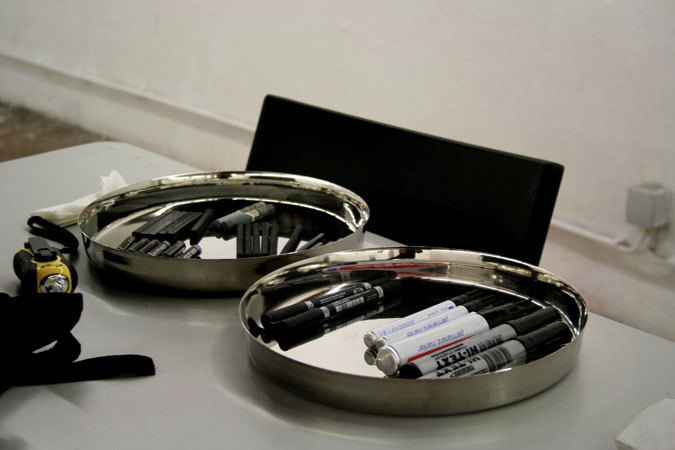 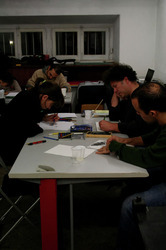 On the 12th and the 19th of March, 7pm, Drawing Spaces promoted a series of round table discussions with the participations of artists and researchers debating different perspectives on the use of graphic diaries. 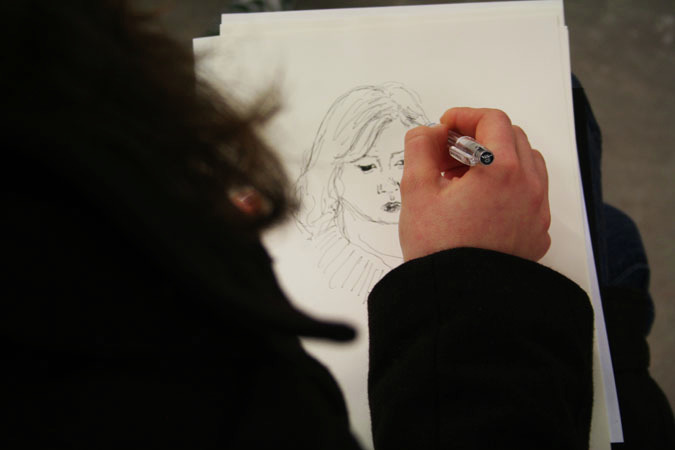 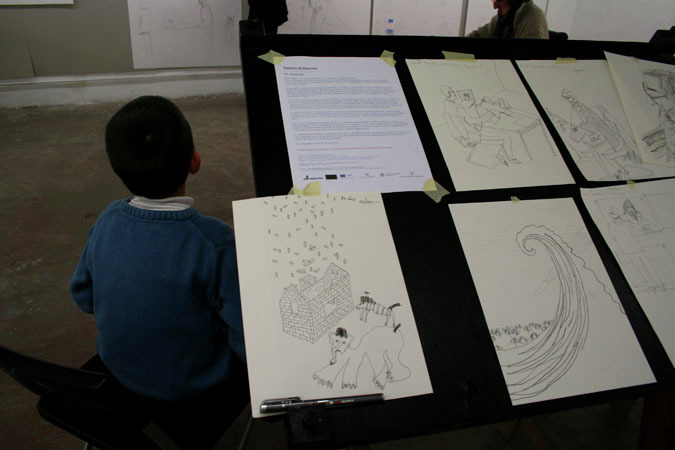 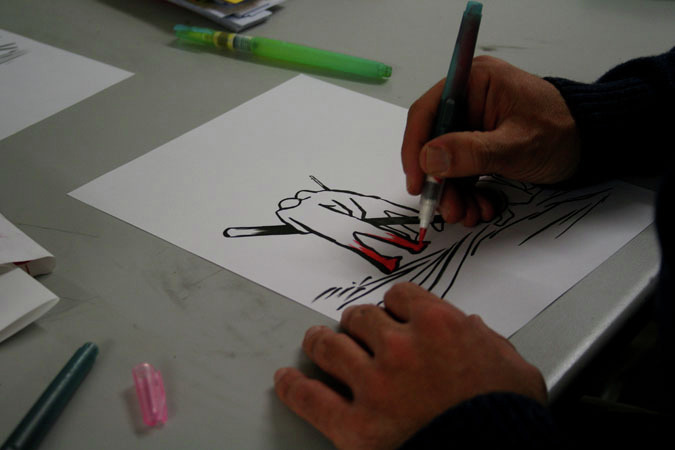 On the 8th, 15th and 22nd of March, 4 – 7 pm, the public was invited to participate in drawing sessions using their own graphic diaries. 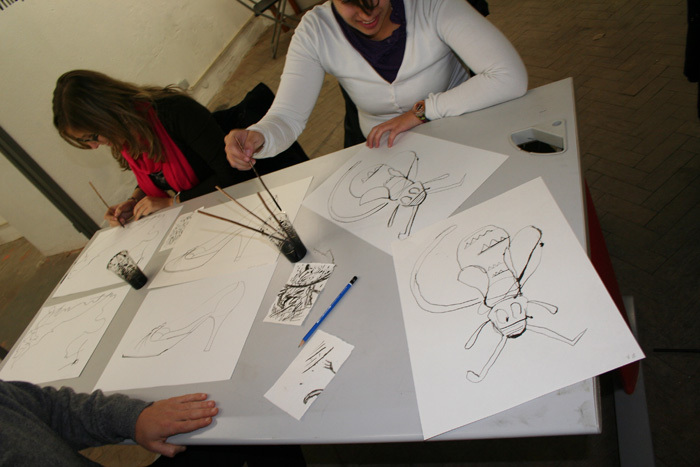 These activities were accompanied by drawing tutors from IADE. 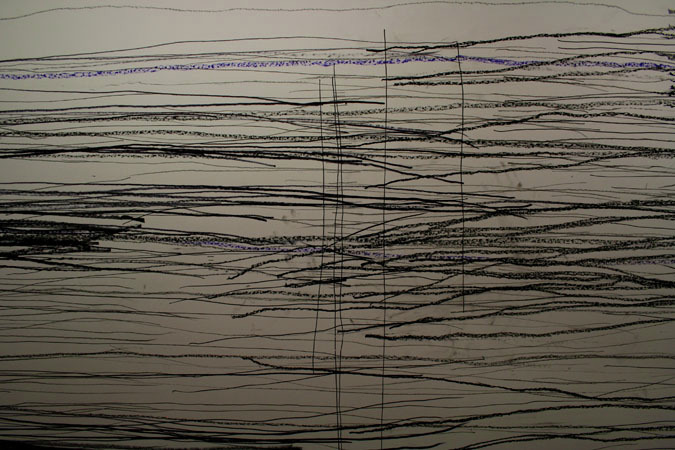 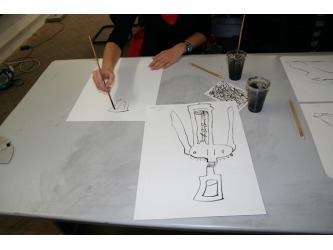 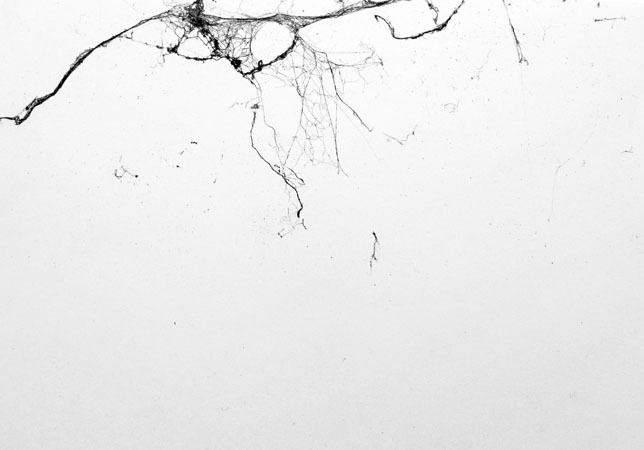 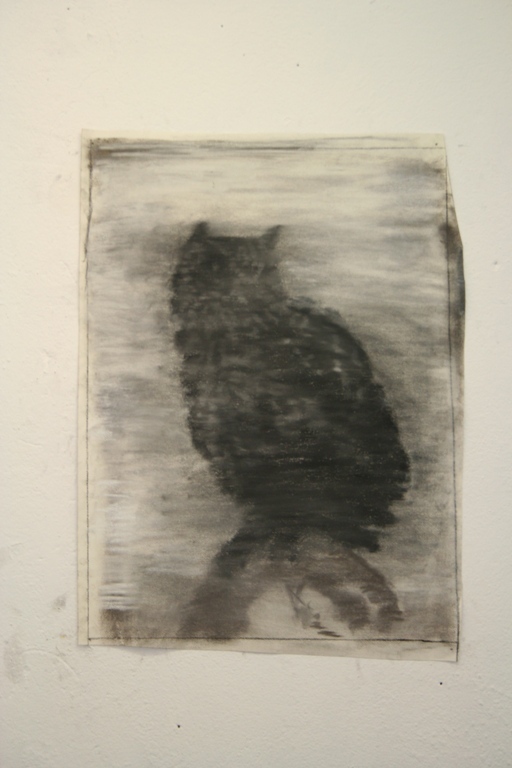 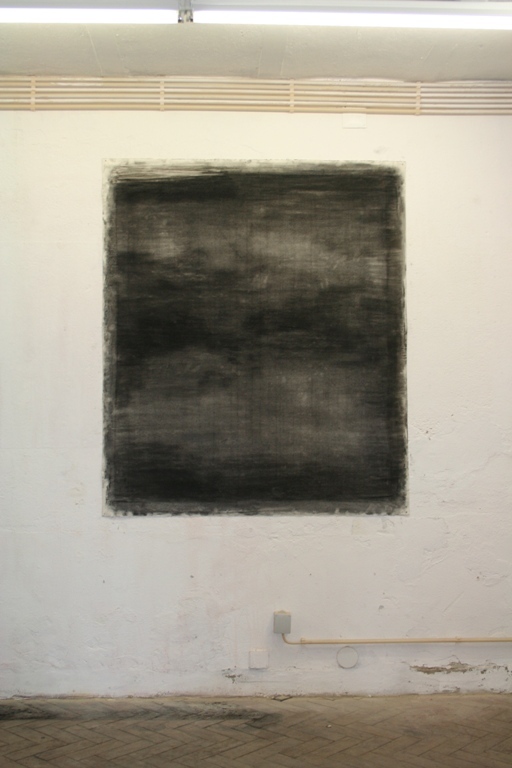 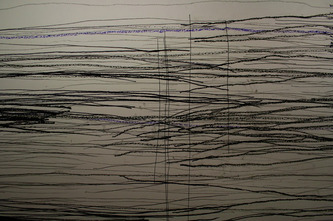 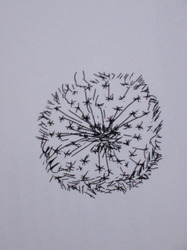 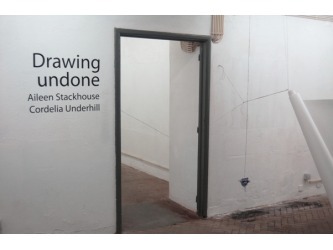 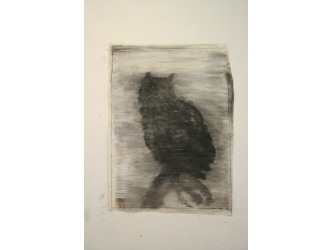 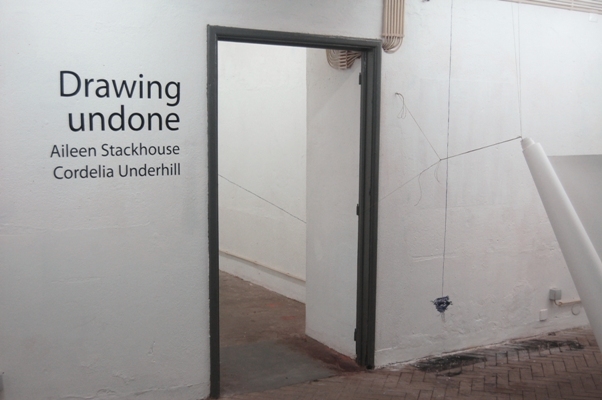 Aileen and Cordelia aimed to investigate the idea of the knowing and unknowing drawing. In practice this involved testing the possibilities of extended versus compacted time and content in line and the relationship between the drawn line and the body as contained in interior and between exterior architectural space. The artists worked separately on the same theme creating a dialectic which at times crossed and entered into each other's line and space. 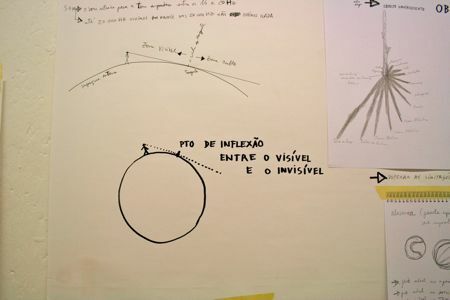 On the 12th of February, 7 pm, the artists delivered a talk about their project, which was followed by a Drawing Lesson by Paulo Freire de Almeida under the title Looking Ahead – Hypotheses for the actuality of the practice of observation drawing. 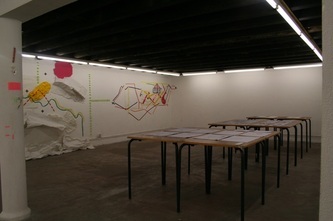 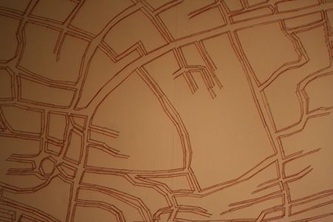 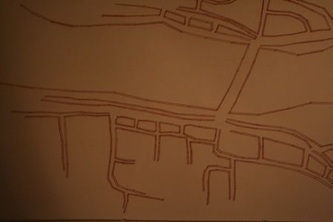 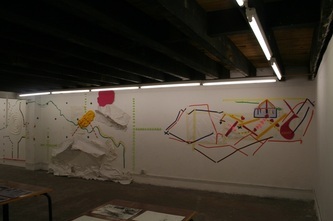 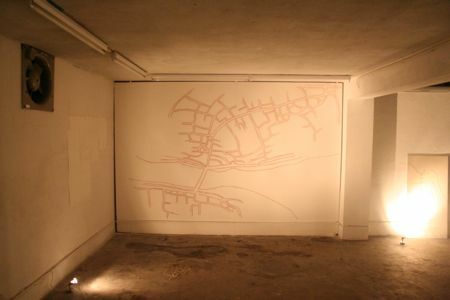 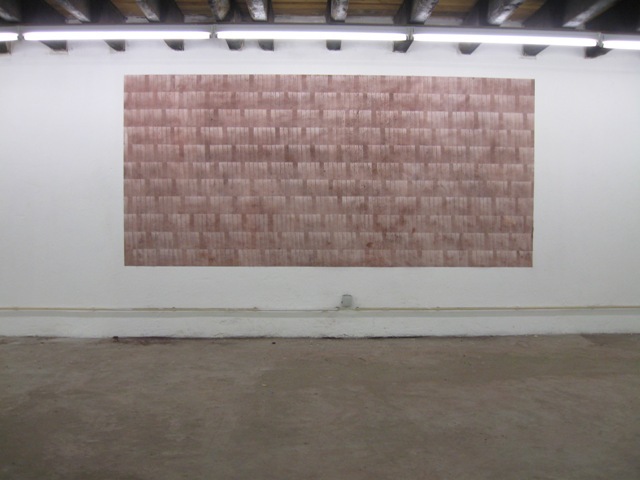 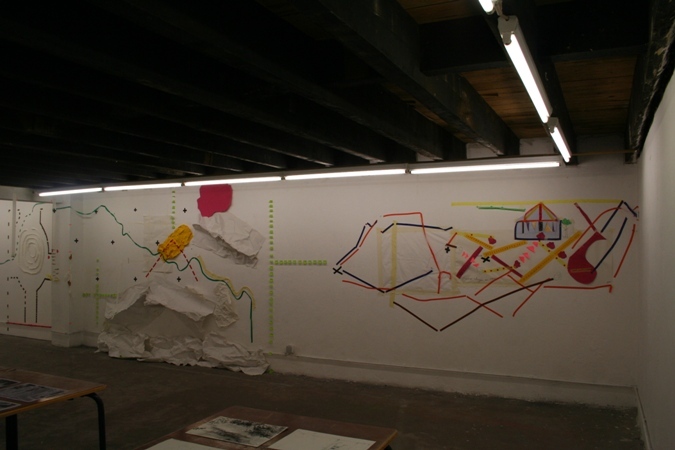 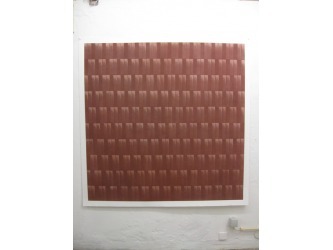 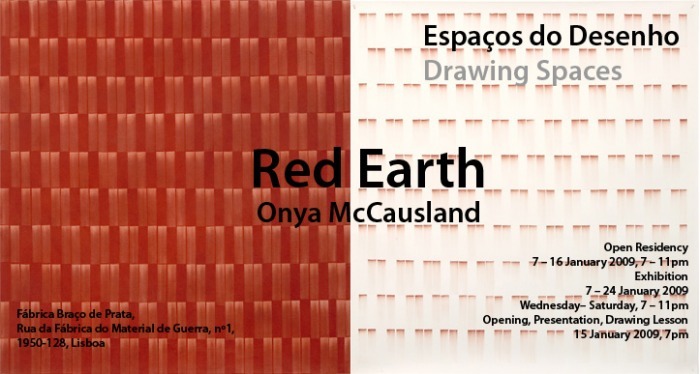 Red Earth (displaced wall drawing) was a large scale wall drawing developed as part of a series of drawings made from materials associated with the location in which a particular work was made. 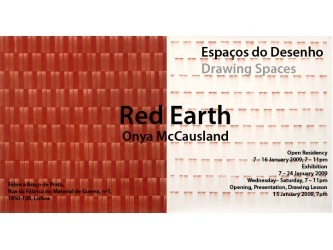 This project began with the identification, location and processing of a red iron oxide pigment from Torres Novas, Portugal. 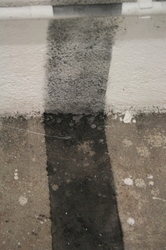 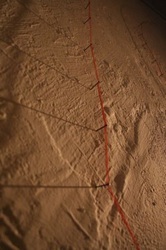 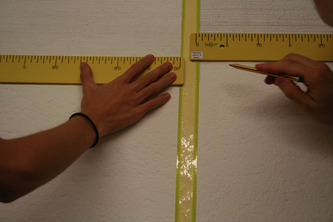 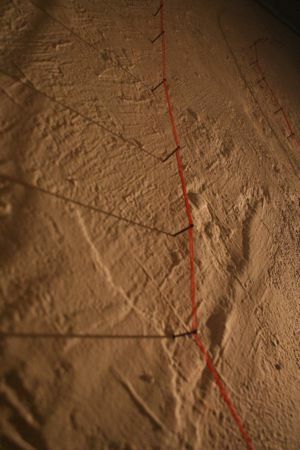 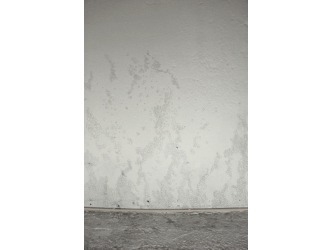 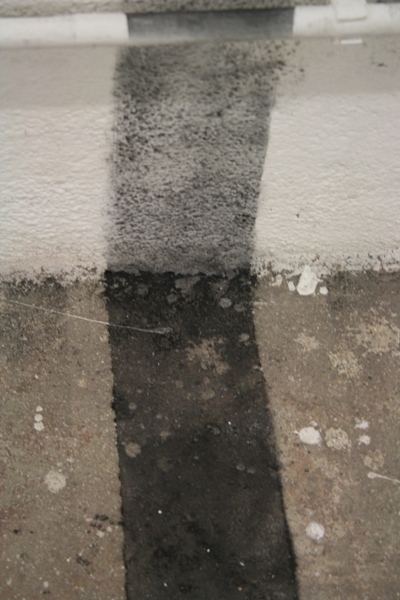 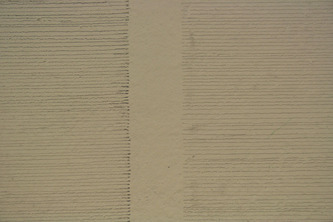 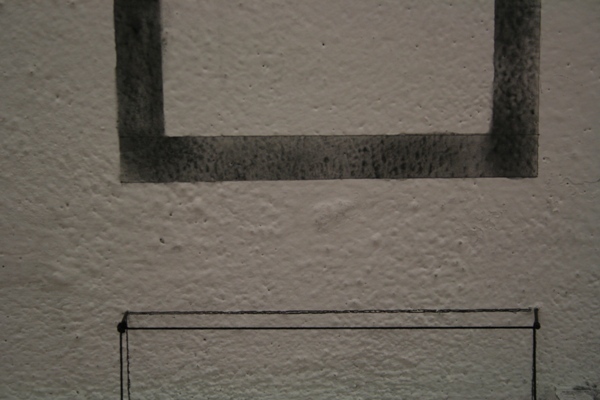 The red earth, once ‘placed’ in the space as an even ground to an area of one wall was systematically erased from the ‘source’ wall and re-located to the other side of the space mark by mark with a rubber. 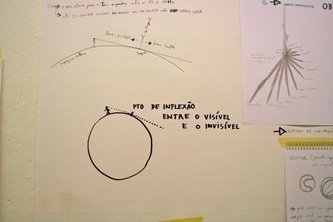 On the 15th of January, the artist delivered a presentation of her project, which was followed by a Drawing Lesson delivered by Jorge Silva Marques with the title The process as a starting and ending point. 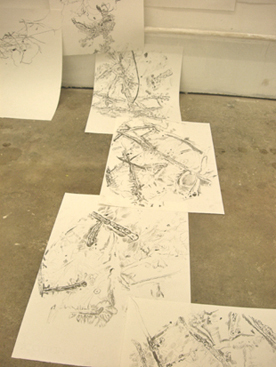 [An exploration of] drawing through process. 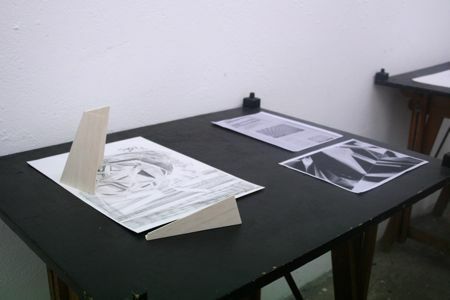 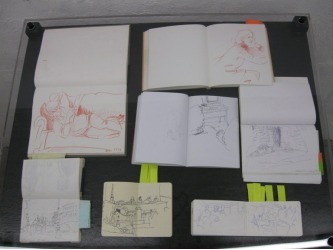 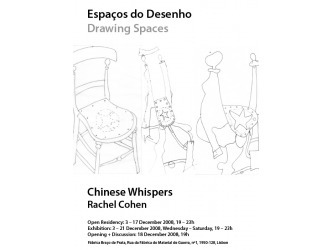 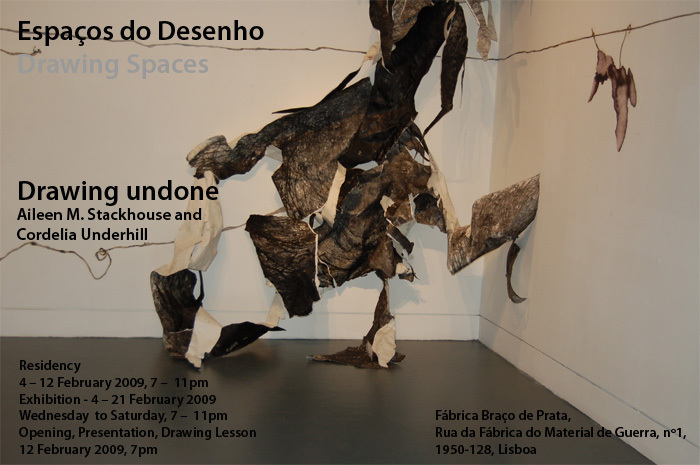 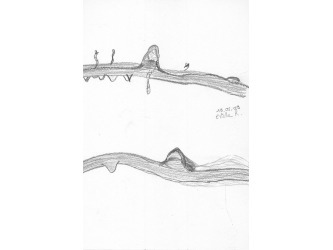 Desenho Livre [Free Drawing] and Chinese Whispers were two projects which were developed simultaneously between the 3rd and the 18th of December 2008 at Drawing Spaces. 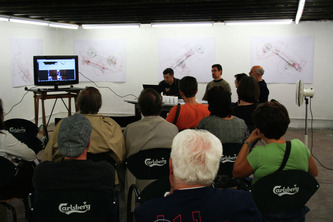 Both projects concerned drawing approaches based on interactions with the public. 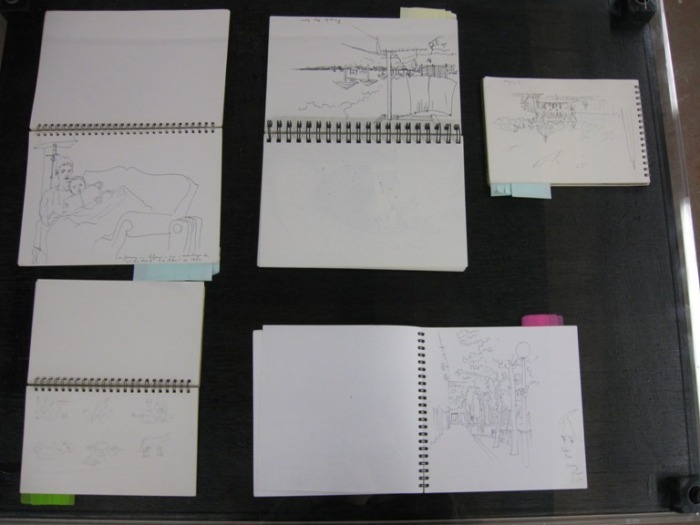 Daniel Melim produced drawings in dialogue with the public aiming to (co)respond to the descriptions of their desired images. 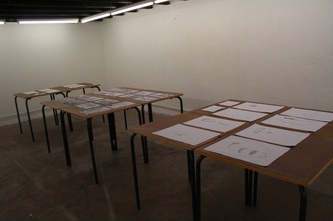 At the end of each session Daniel offered the drawings to the participants, thus each drawing was only available to be publicly viewed during the period in which the artist was producing it. 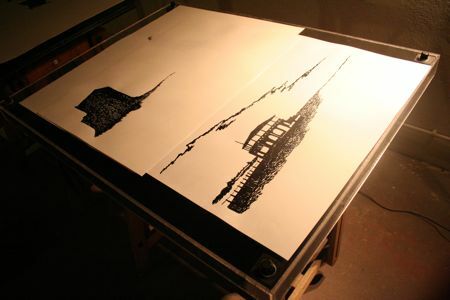 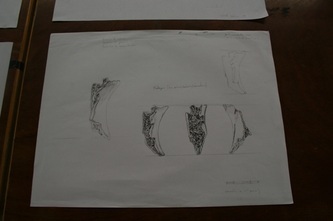 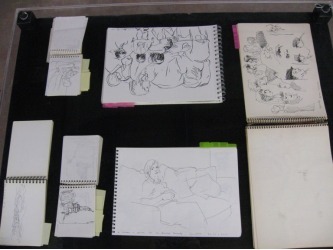 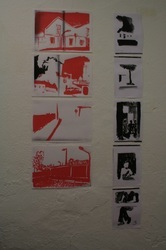 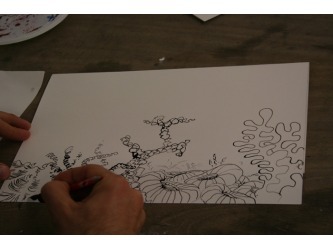 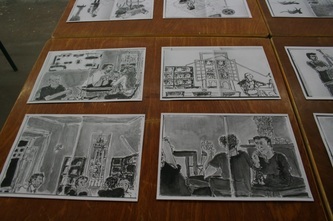 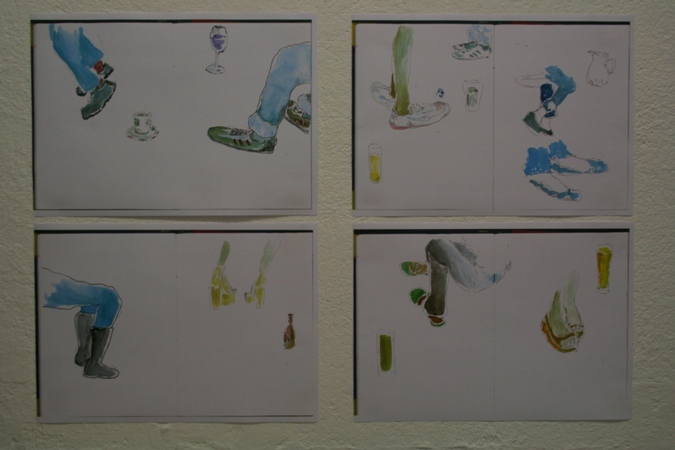 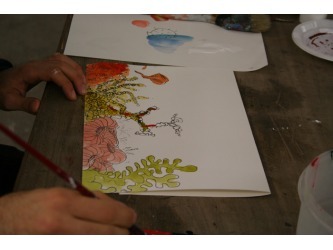 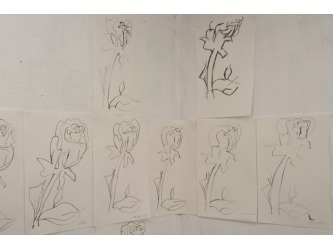 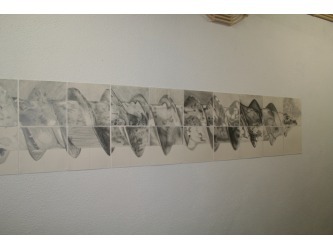 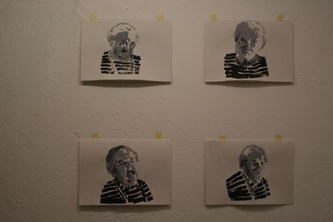 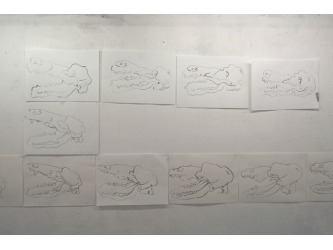 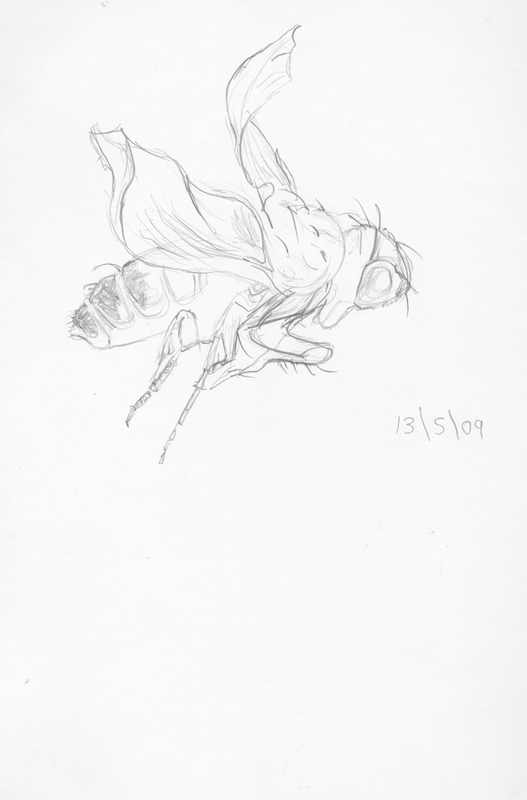 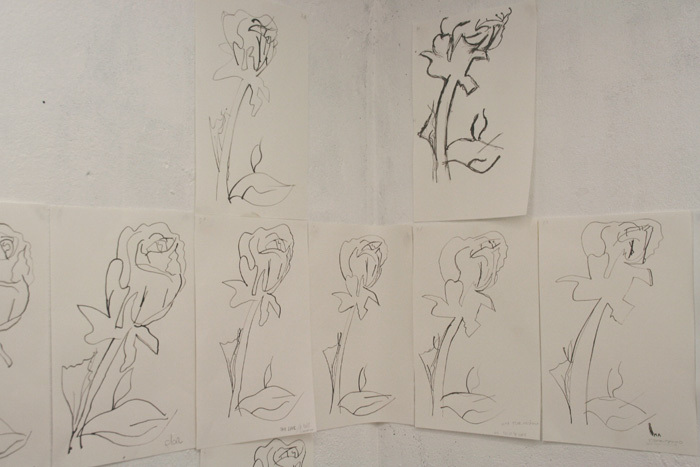 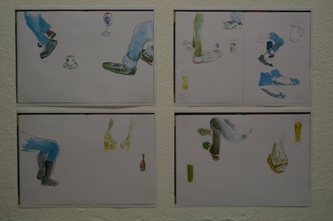 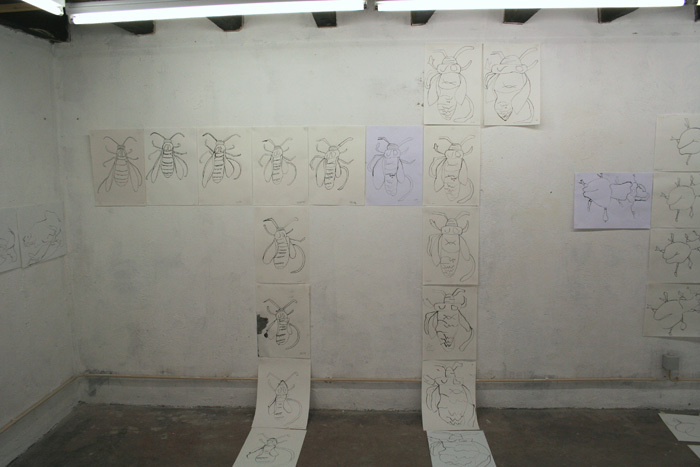 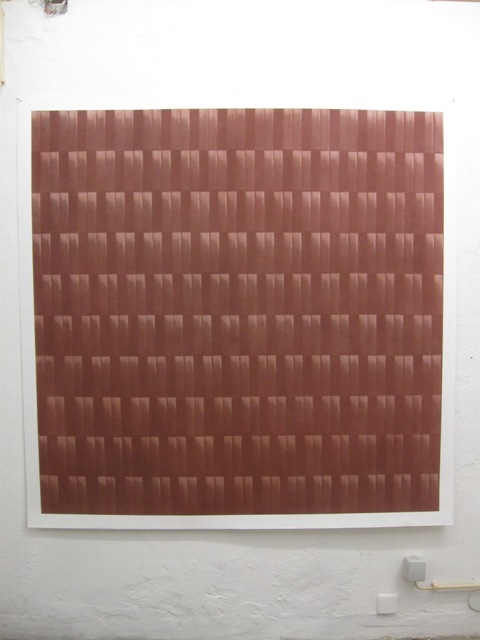 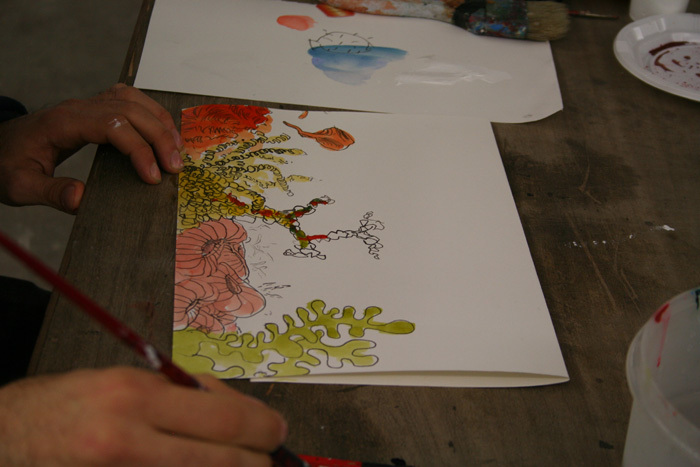 Rachel Cohen invited the public to participate in sequences of drawings which were developed from an original image. 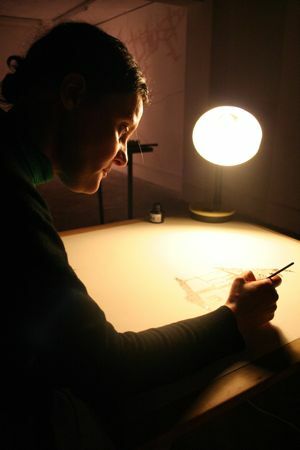 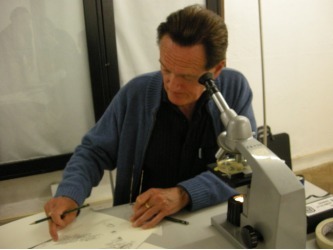 The first drawing was made by the artist. 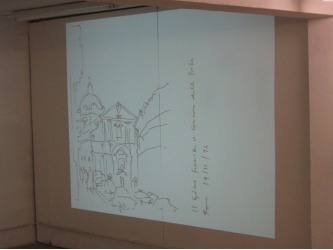 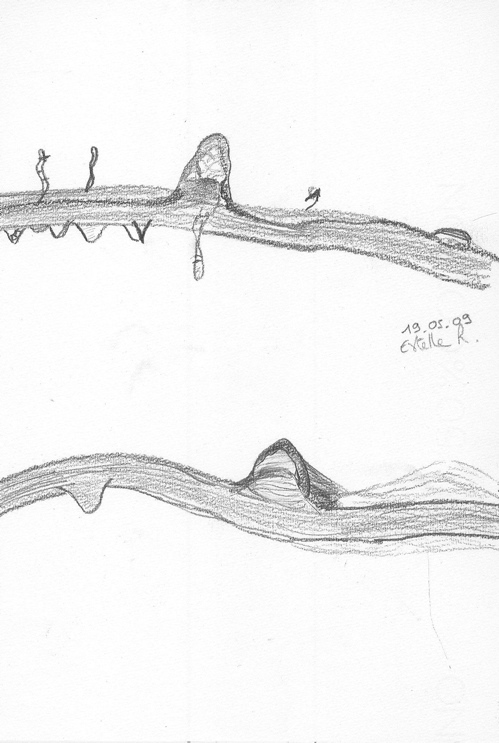 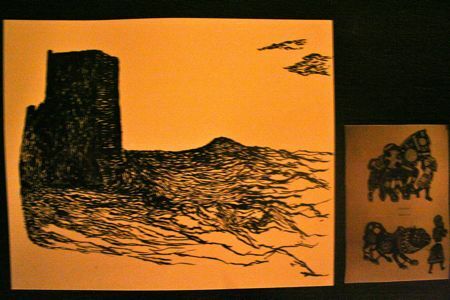 It was then copied by a participant whose drawing was afterwards copied by another participant, and so on. 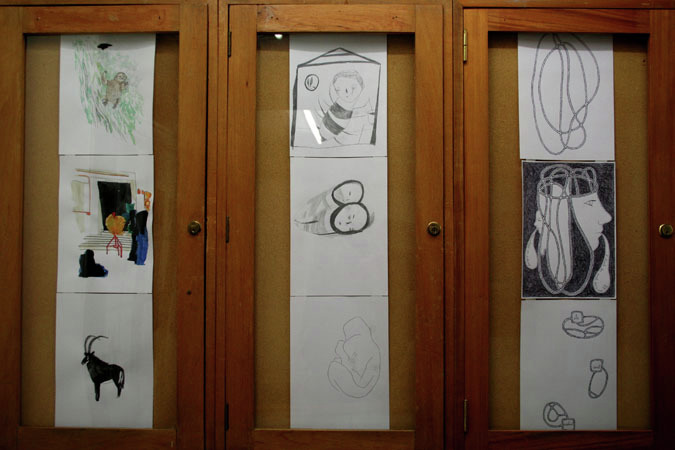 Even though each person attempted to copy a drawing as faithfully as they could, the images mutated gradually and soon became unrecognizable. 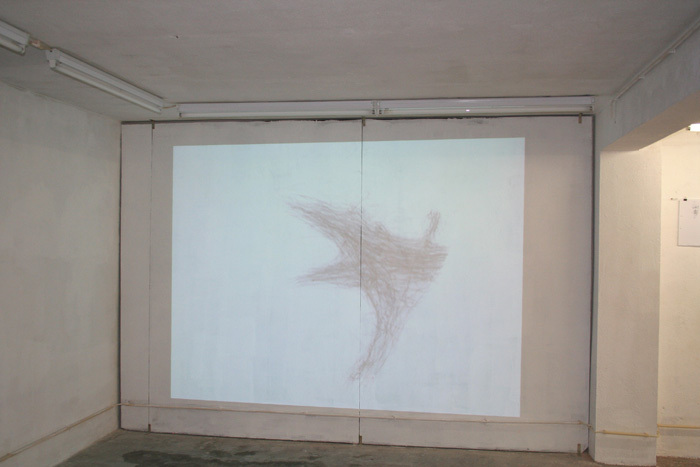 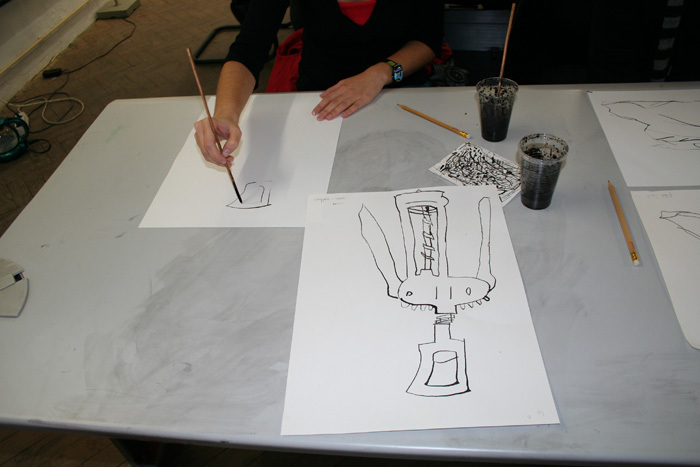 On the 18th of December both artists participated in a session where they presented their projects and Angela Rogers delivered the 3rd Drawing Lesson hosted by Drawing Spaces with the title Drawing the spaces between us: visual encounters with strangers. 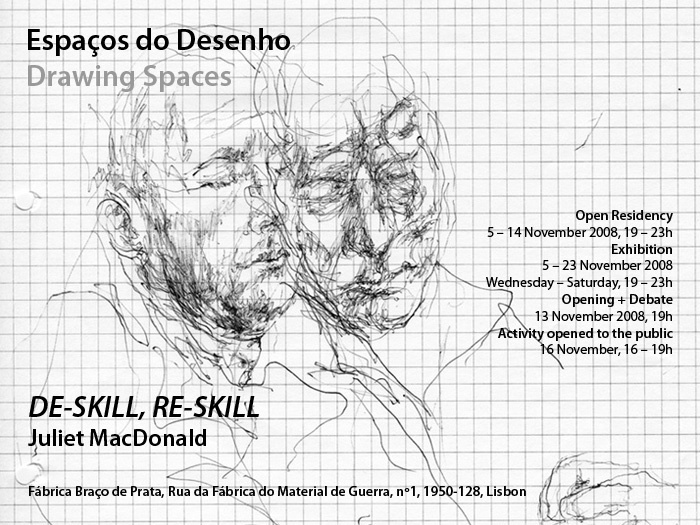 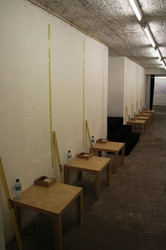 De-skill Re-skill was a project by Juliet MacDonald involving an exhibition and a residency. 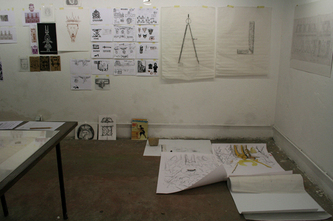 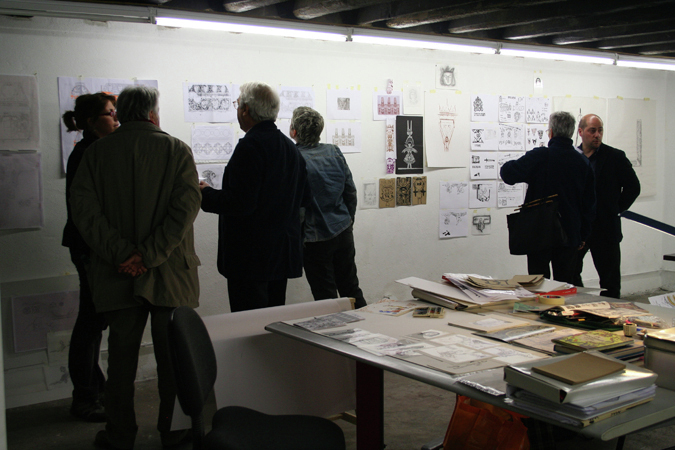 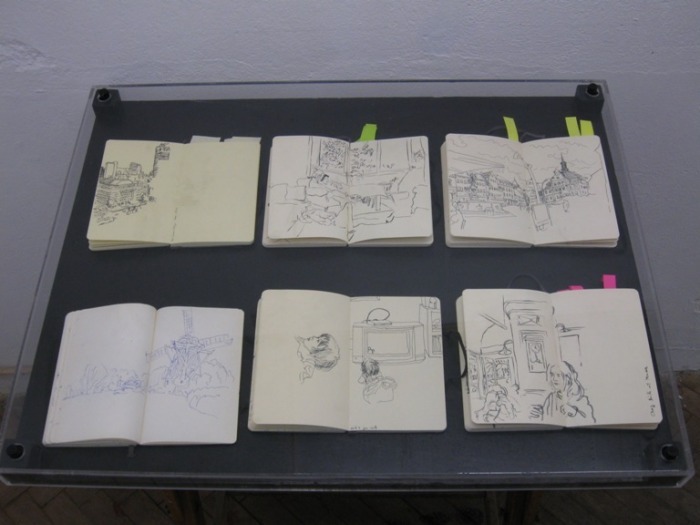 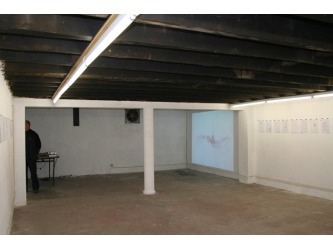 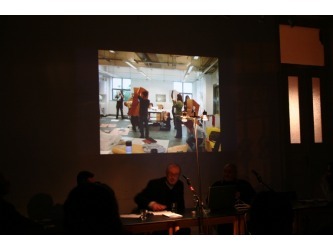 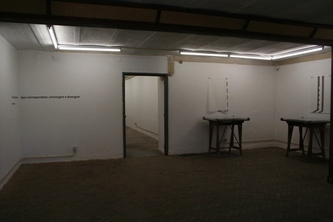 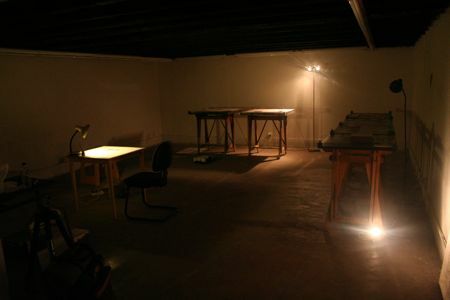 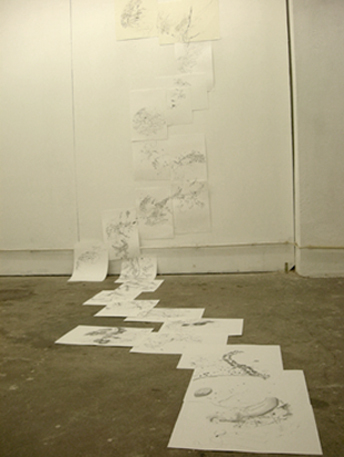 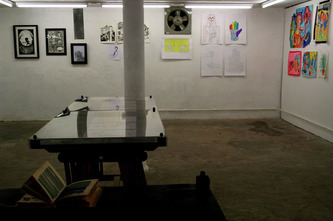 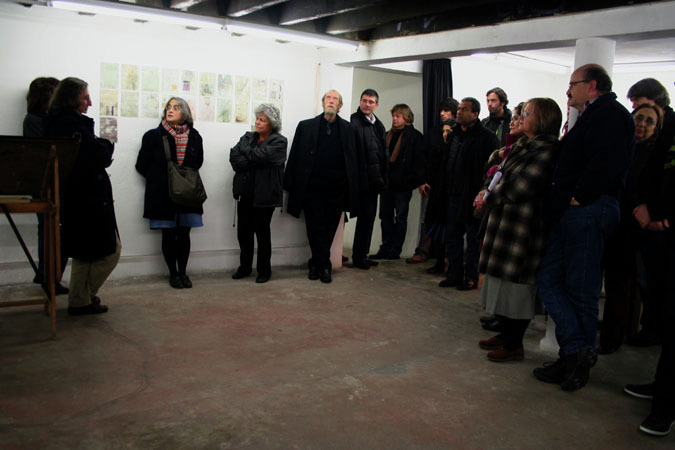 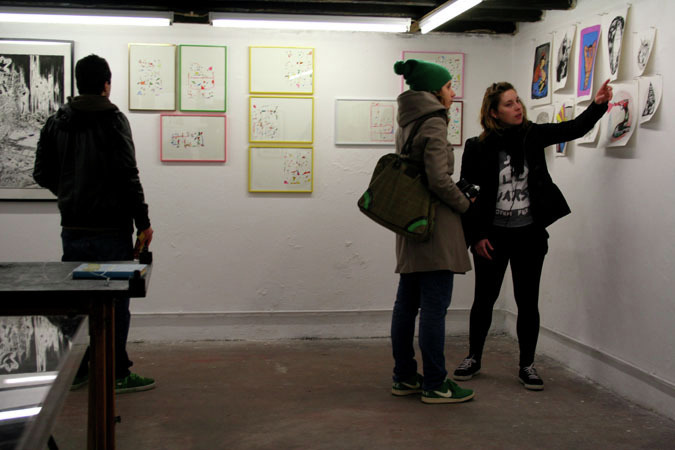 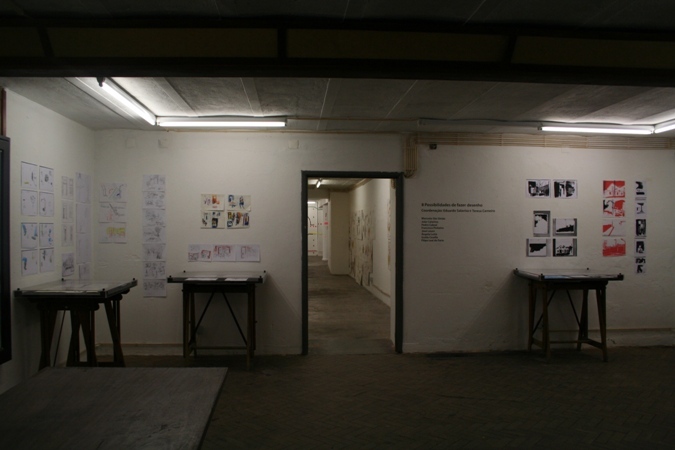 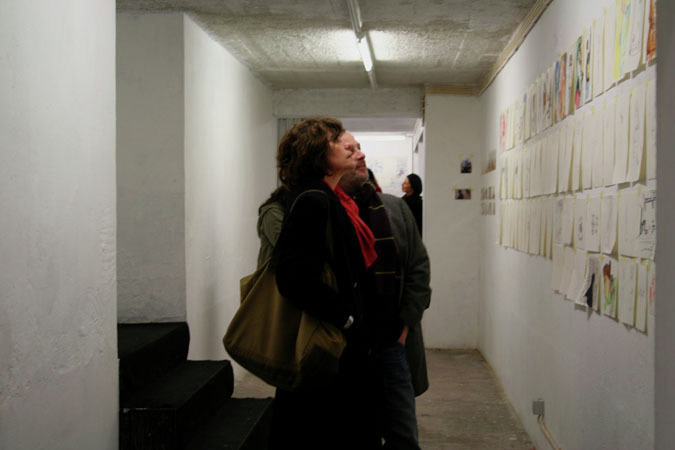 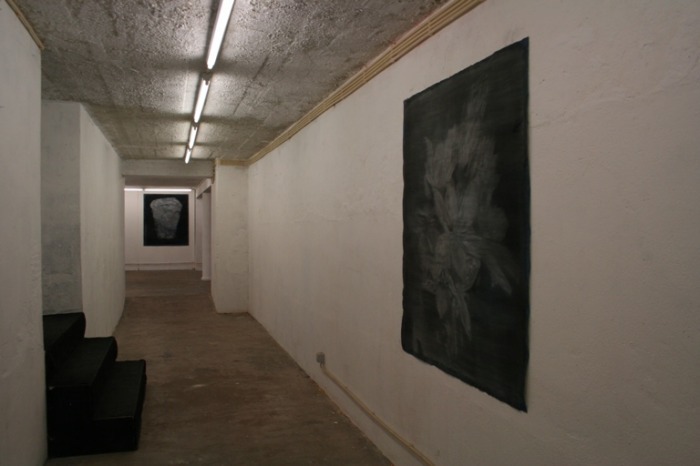 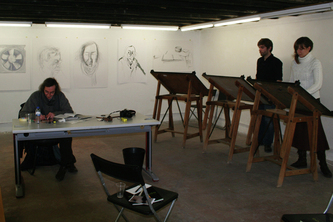 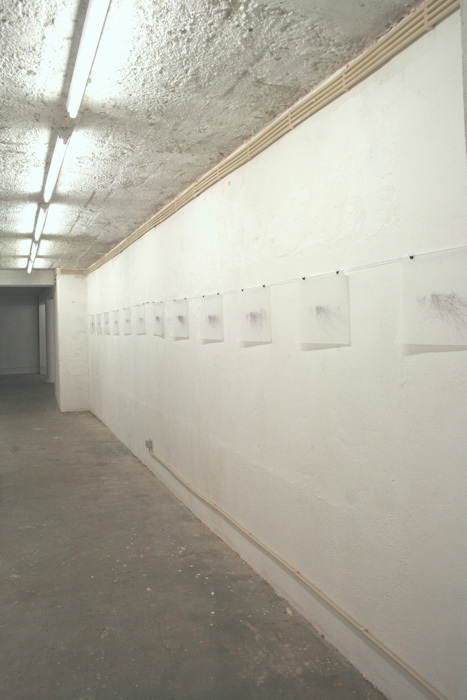 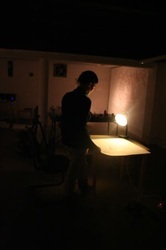 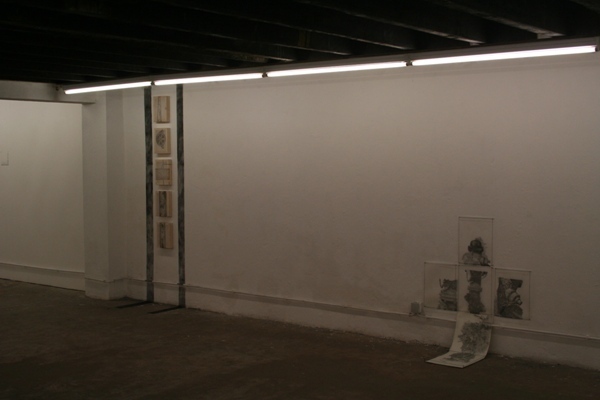 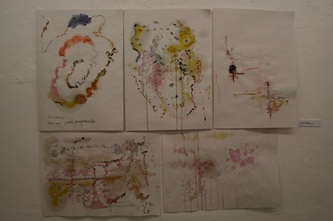 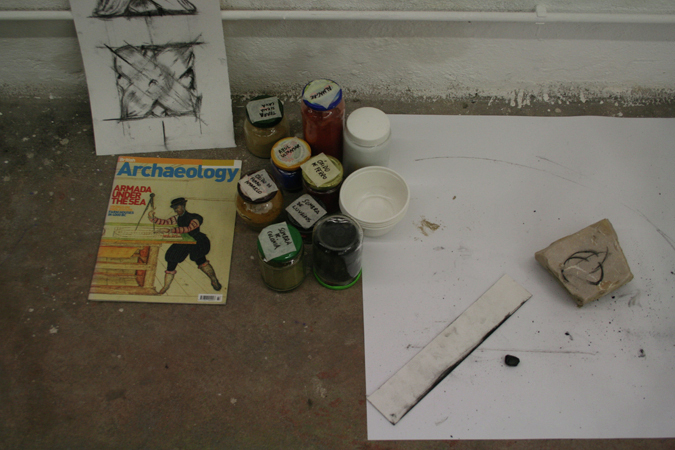 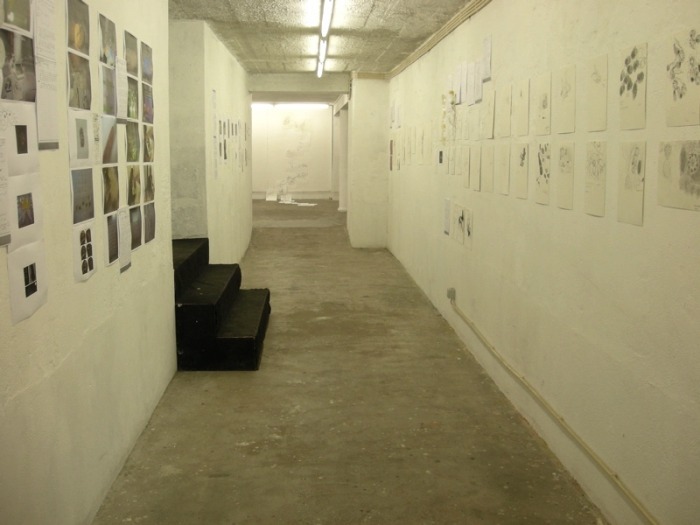 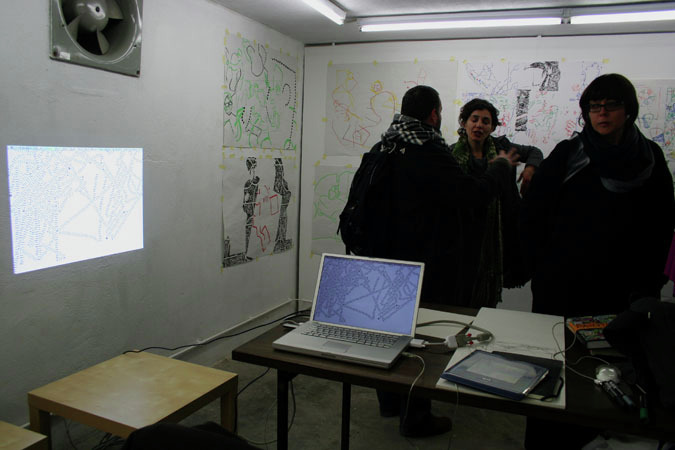 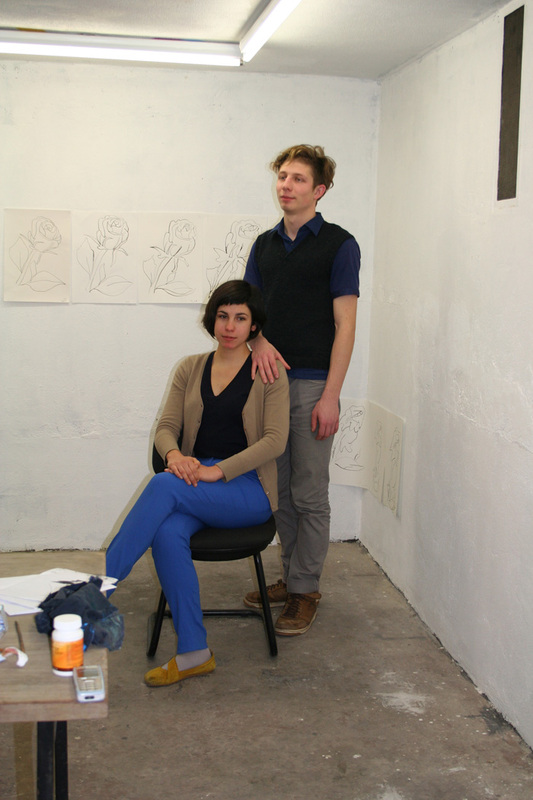 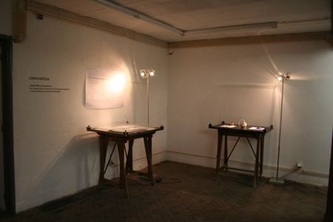 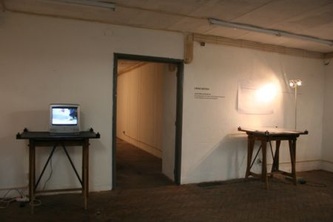 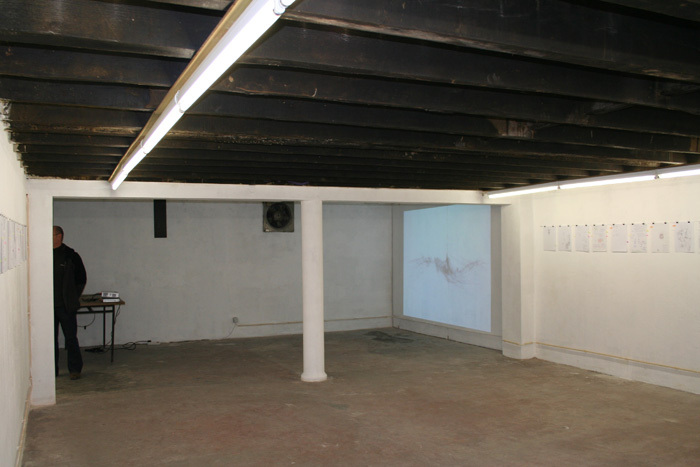 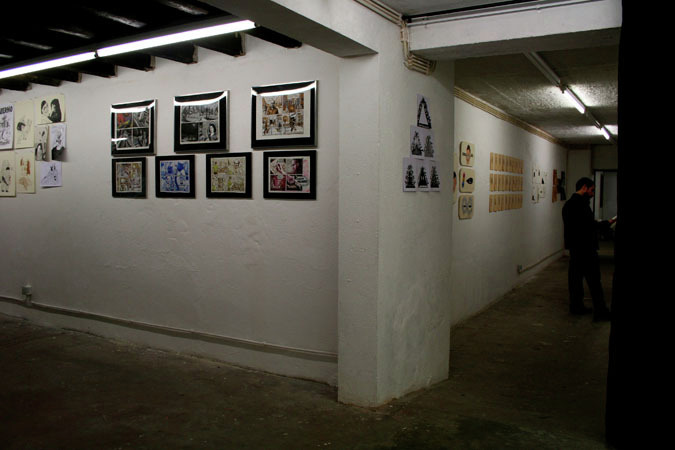 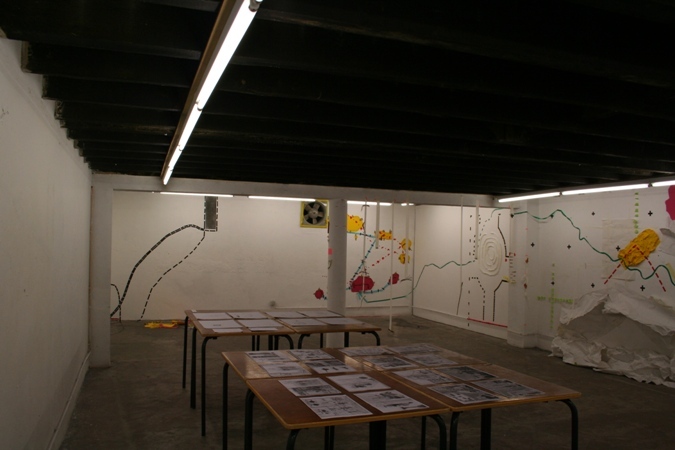 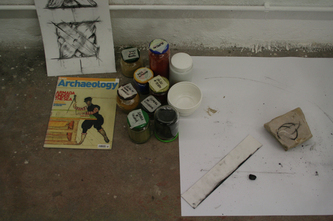 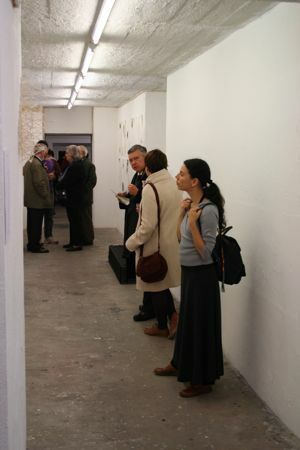 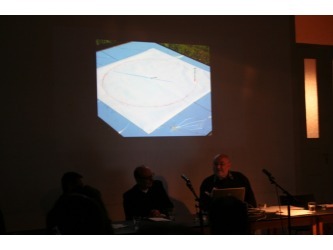 It took place between the 5th and the 23rd of November at Drawing Spaces. 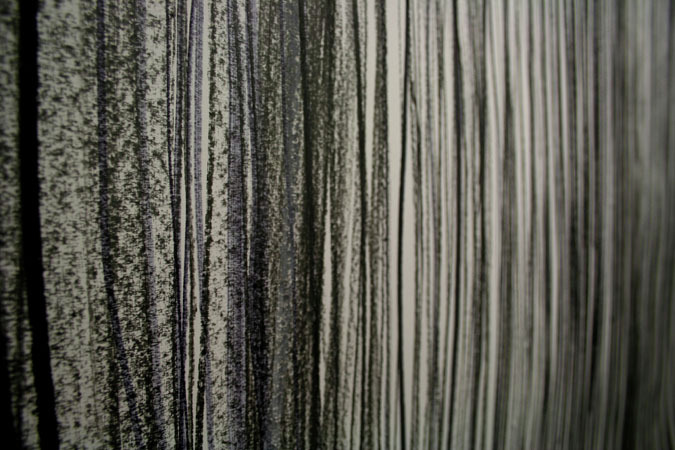 The exhibition consisted on a series of drawings produced over a number of years representing a continuous line of enquiry. 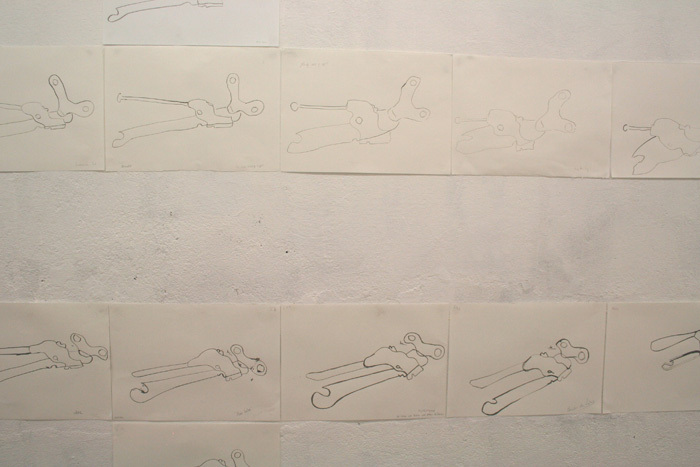 This investigation was concerned with the status of the body and the activity of drawing as a mode of embodied knowledge. 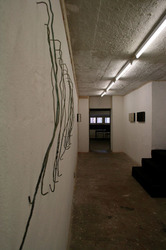 In this way, the exhibited works showed an increasing concern with the body as an entanglement rather than a singular entity. They included drawings made in the street in response to the movement of people walking past and, also, a number of notes, diagrams, workings and doodles extracted from numerous files. 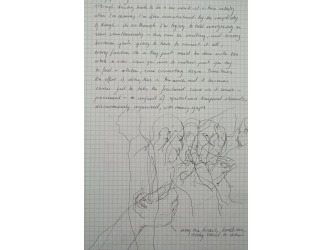 Among the notes and diagrams there were also many drawings made quickly from glimpses of faces. 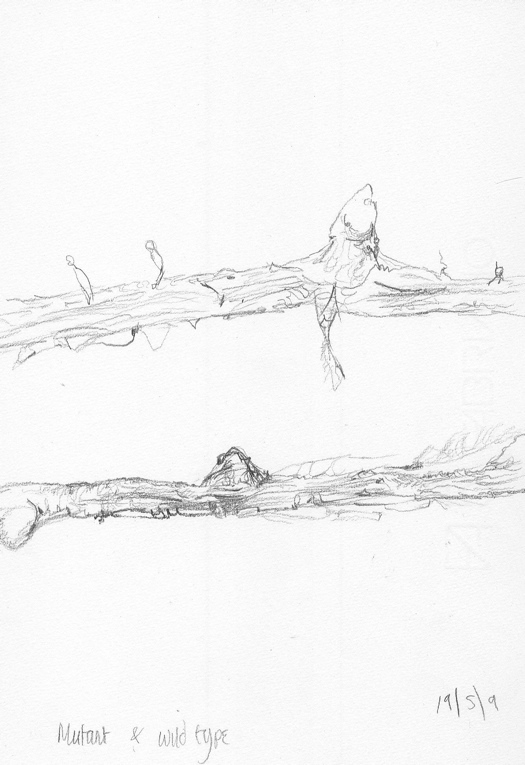 Through these multiple approaches, carefully learned drawing skills were confounded by fleeting perceptual experiences. 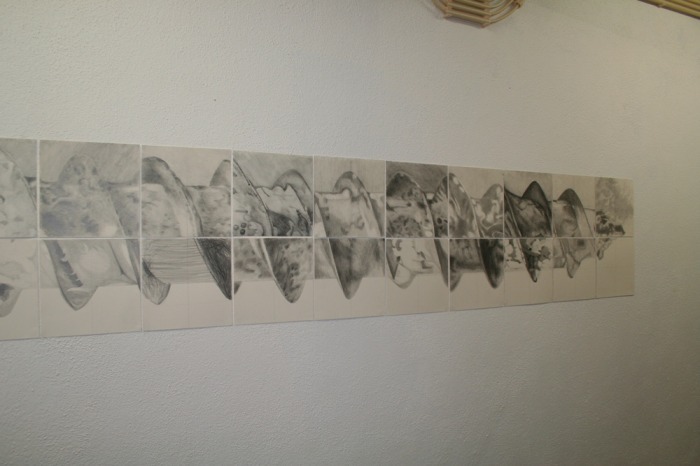 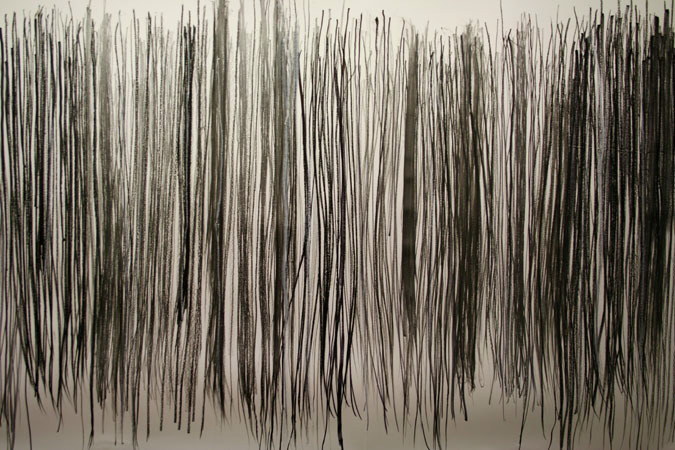 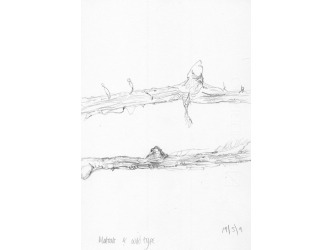 During her residency, Juliet developed a new series of drawings which were aimed to examine the manual, visual and tool-using elements that constitute drawing as a skilled practice. 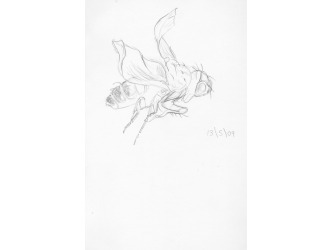 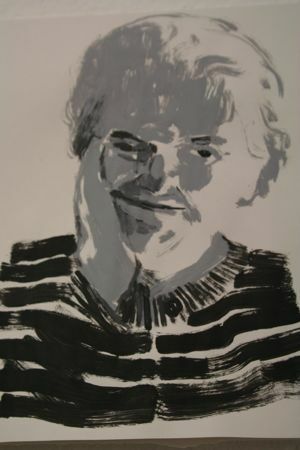 Her intention was to experiment with ways in which a drawing practice can incorporate dexterity and clumsiness, vision and blindness, figurative conventionality and animal immediacy. 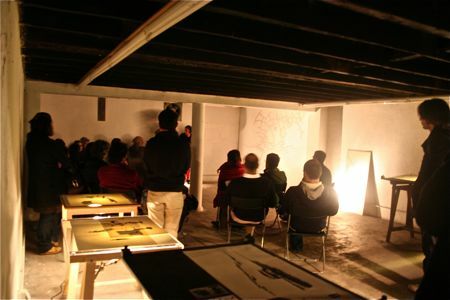 On the 13th of November Juliet delivered a presentation of her project, which was followed by the 2nd Drawing Lesson delivered by Paulo Luís Almeida with the title Faked Acts: Aspects of the performative dimension of drawing. 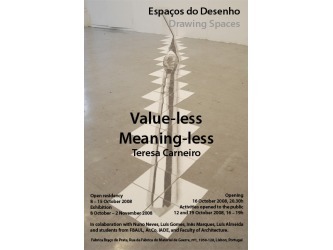 On the 16th of October Teresa participated in a symposium where she presented her project. 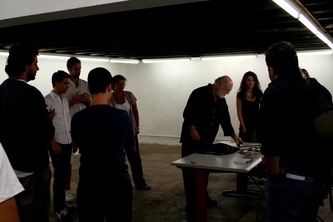 This was followed by the 1st Drawing Lesson by Vítor Manuel Oliveira da Silva under the title «Waiting for Success» by Henrique Pousão, a presentation by Nuno Nabais where he addressed the relation of drawing and scale, an a presentation by Catarina Nabais, Marco Pina, Joana Mesquita and Flávia Neves called The Image in Science and Art. 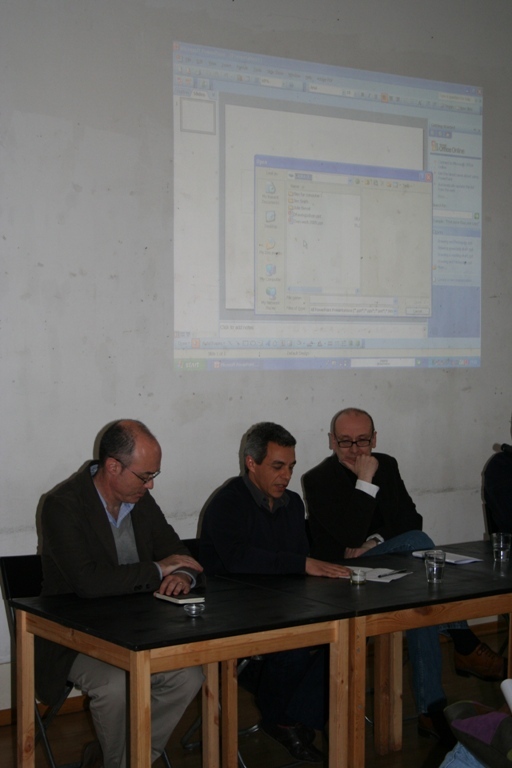 Presentation of a project (Centre for the Philosophy of Sciences, University of Lisbon).